Peter Edwards grew up in Sussex and nurtured a love of walking amid the ‘blunt, bow-headed, whale-backed’ hills of the South Downs. 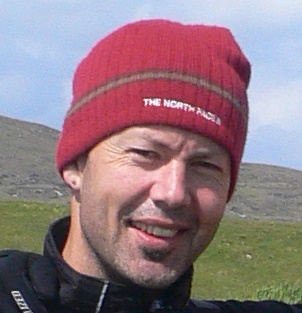 He has undertaken numerous walking and cycling expeditions in Europe and beyond and is particularly drawn to wild and remote landscapes. After completing his doctorate on British collective memory of the Great War at Sussex University, Peter moved to Scotland in 2006. 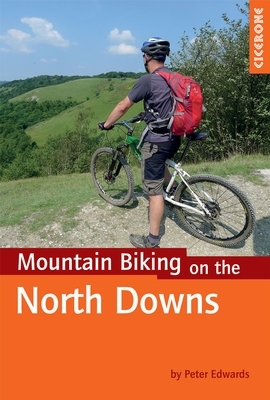 Peter has written two walking and mountain biking guidebooks for Cicerone Press, a third is in production www.cicerone.co.uk. 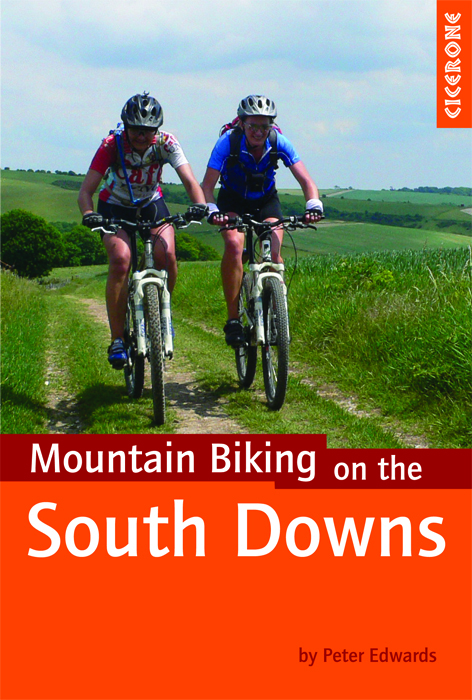 Peter also writes about his walking and cycling trips on his blog site at www.writesofway.com. 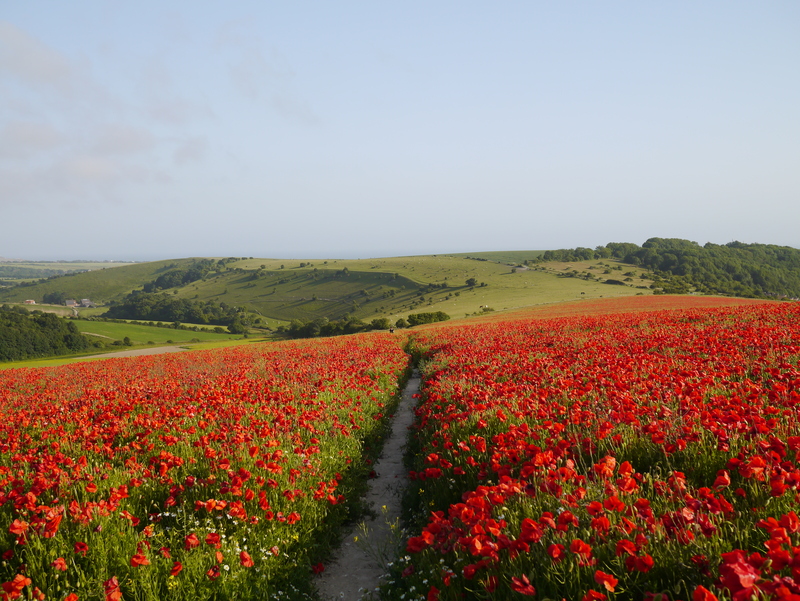 We’re staying in Sussex just now and this field of poppies adorns a hillside just near my sister’s house. We’ve been walking the dogs up this way for the last few days – in a few more they’ll be gone. 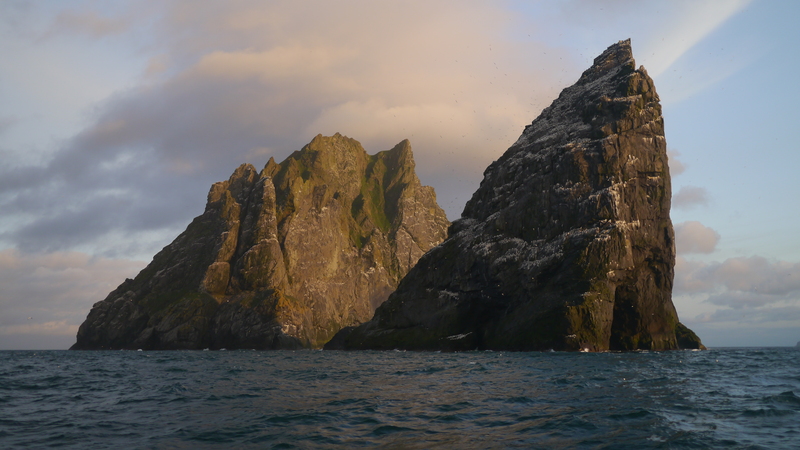 I recently read a blog post describing St Kilda as ‘one of the most aspirational destinations in the British Isles’. There’s probably some truth in this, yet it didn’t put me off going. 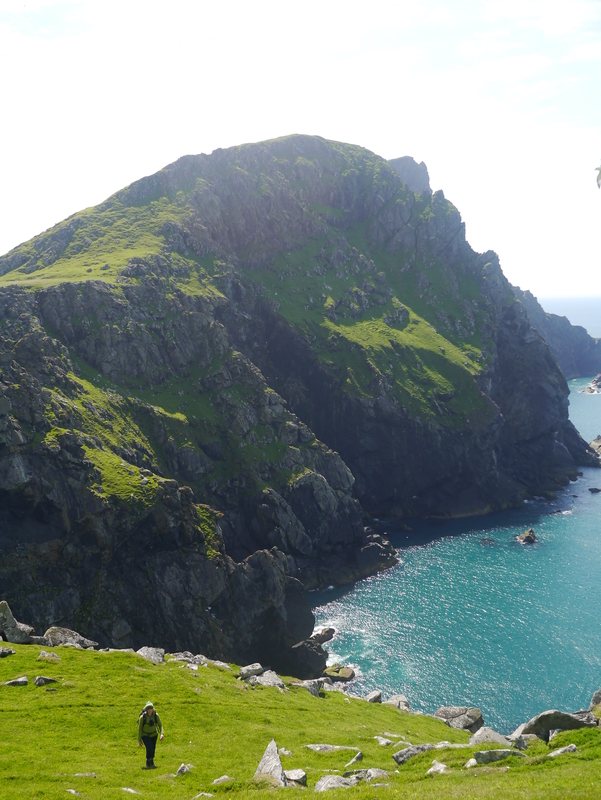 It seems that for some people the idea of St Kilda creates a powerful urge to visit this small archipelago of islands – or rather, Hirta, the largest of the island group where the ossified physical remains of a unique way of life stand alongside an incongruous MOD radar base. ‘The St Kilda story is like a modern myth’, according to Kathleen Jamie, on which some people become ‘perfectly fixated’. I was keen to visit, but not fixated on the idea; I’m of the view that investing too much expectation in something often leads to an underwhelming experience. Let’s go and see what we find when we get there. 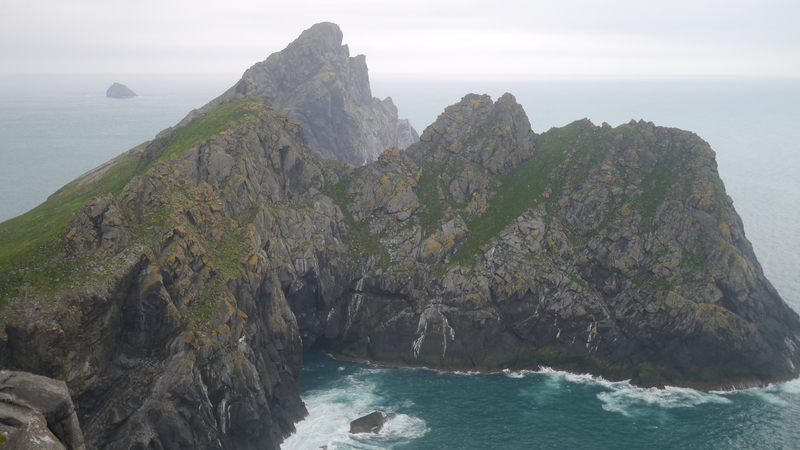 The St Kildans were a small island community in more or less continuous occupation of their island domain for many hundreds of years, eking out a hard existence from the archipelago of isolated and frequently storm-battered small islands and sea stacks that rise like jagged shards from the Atlantic Ocean, 40 miles west of the Outer Hebrides. The St Kildans’ life was tough, but they were a joyful people who loved to make music, sing, dance and play together. 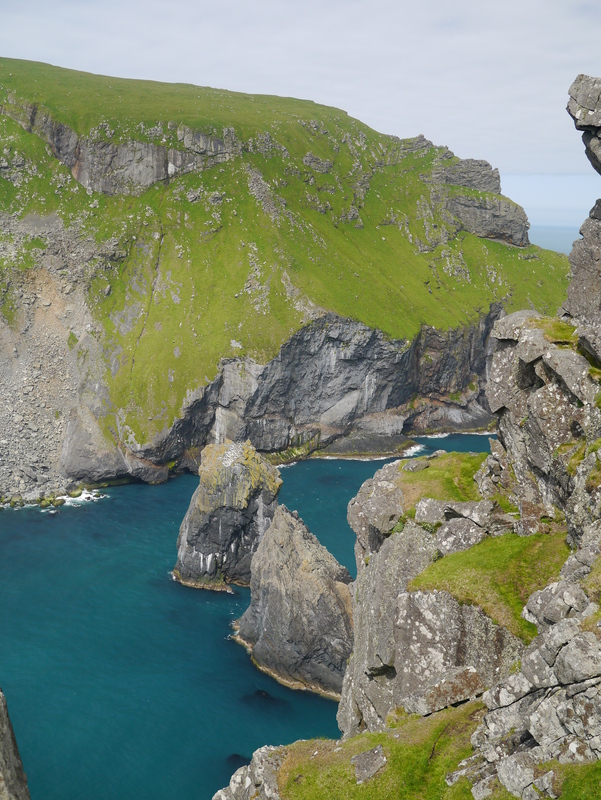 The islanders lived from their land; the men abseiled barefoot down the sheer sea cliffs of Hirta and Boreray and climbed Stac Li and Stac an Armin – vertiginous sea-girt rock stacks – to harvest the sea birds and their eggs that made up a large part of the islanders’ diet, while the women spun wool from the islands’ indigenous Soay sheep and tilled the sparse soil. Those who could work did so for the collective benefit of the entire population. 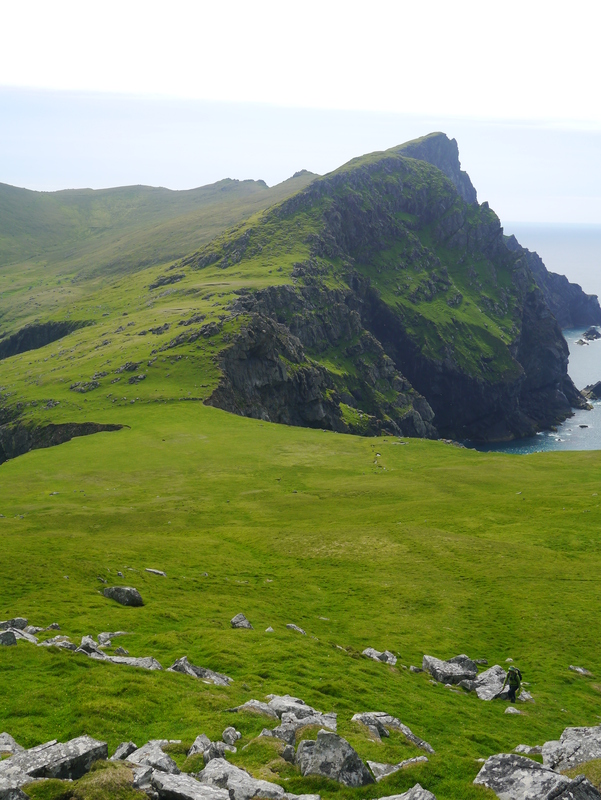 The undoing of the St Kildan idyll arrived on two fronts. Victorian tourism brought significant numbers of sightseers, who came to gawp at the aborigines and turned their heads with the possibilities of commerce. They also brought diseases to which the islanders had little resistance. Arguably more pernicious was the arrival of the Free Church of Scotland. A succession of ministers brought doctrine and the sabbath and in return they eroded the islanders’ joyfulness and took up time they could ill afford with religious observance. 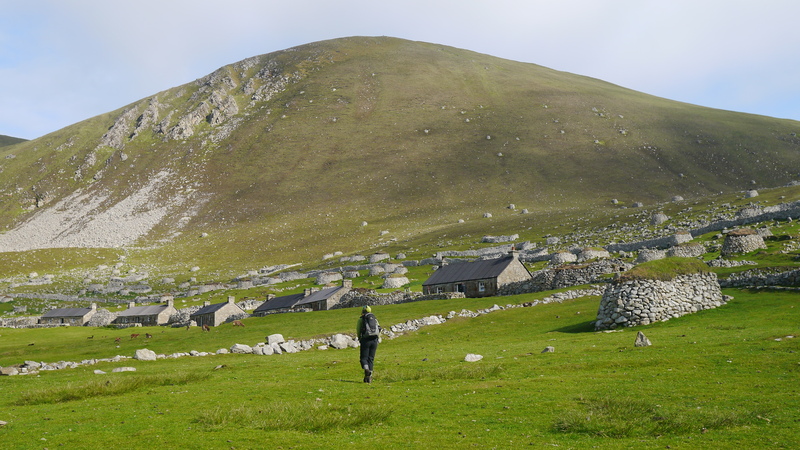 The St Kildans became increasingly reliant on supplies from outside and less able to meet their own needs from the land and sea, as migration, disease and high infant mortality took a grievous toll on the islands’ population. The authorities failed to supply the regular supply ships that could have made the islanders’ existence viable, and in 1930 the remaining population asked to be evacuated. In 1957 work commenced on Hirta to establish a radar base, with attendant barracks, roads, landing slip and other infrastructure and utilities. Since then, the island has had an itinerant population of military and civilian personnel at the base. 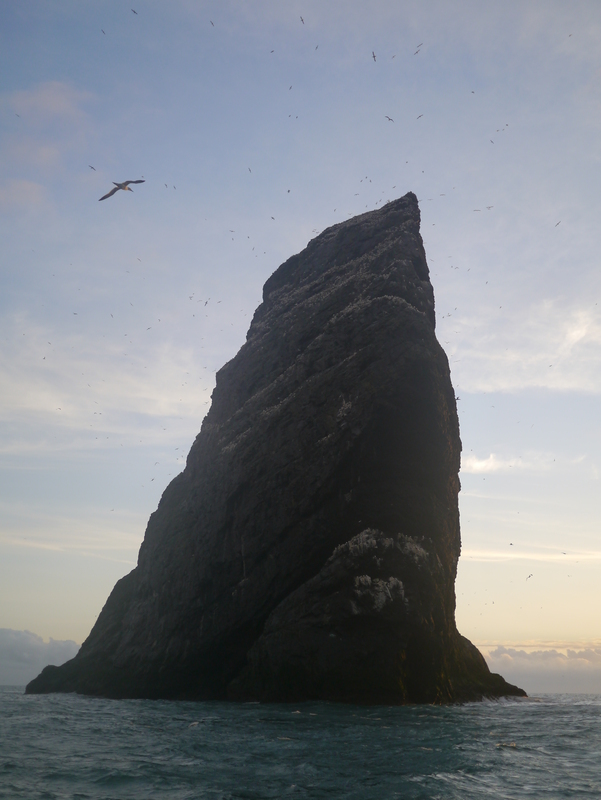 In the same year, St Kilda became a National Nature Reserve with ownership transferred to the National Trust for Scotland. The NTS was able to influence the MOD’s plans for the radar base and limit its extent. 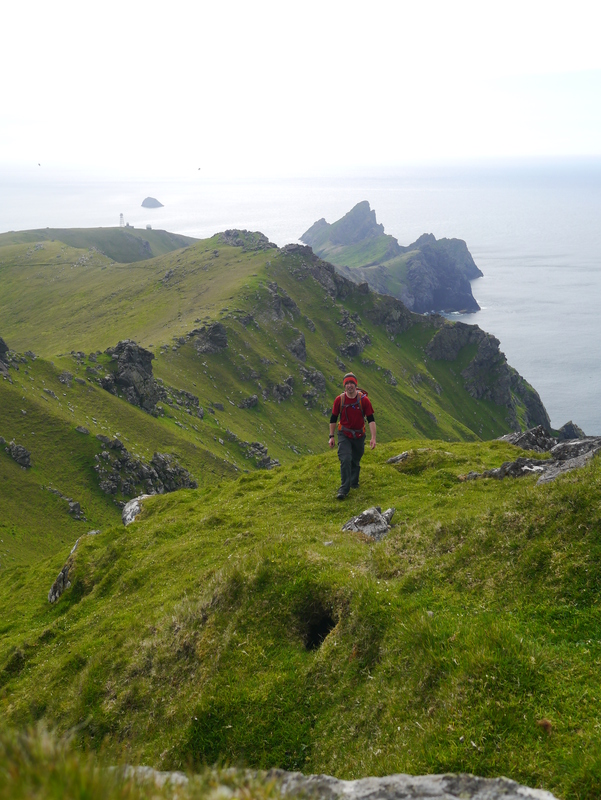 Today, there is a permanent NTS warden on Hirta and during the summer months the population is increased by volunteers and professionals who work at the behest of the NTS, maintaining and restoring the physical legacy of the St Kildans. 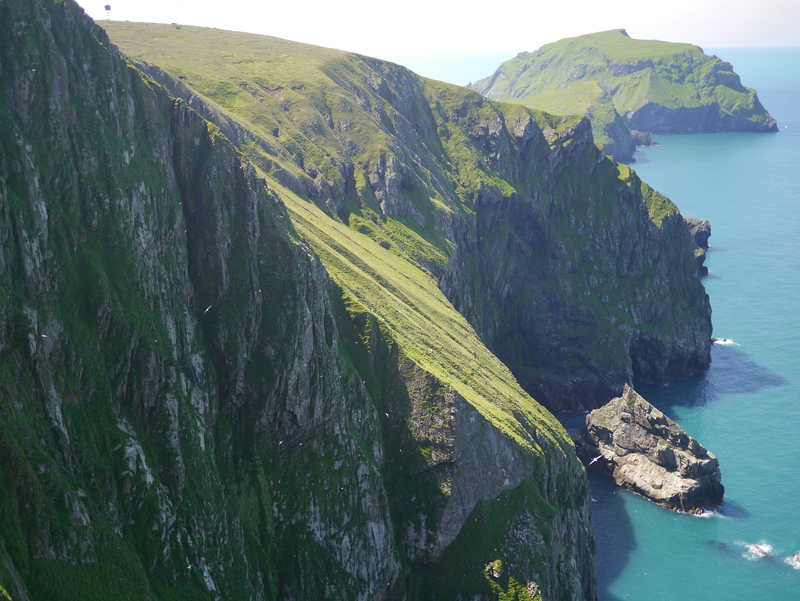 St Kilda became a World Heritage Site for its natural history interest in 1987 and latterly achieved dual WHS status with the inclusion of its cultural heritage. You might think that a a small island with dual WHS status and a MOD radar base might make for incongruity. It certainly does, but then to a significant extent, the infrastructure and utilities installed by the MOD have made the work of the NTS more feasible. 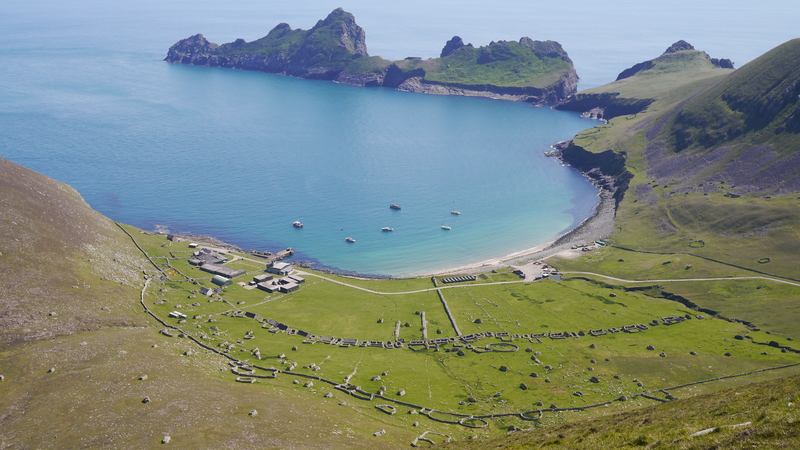 How the St Kildans would have marvelled at the constant coming and going of supply ships, personnel, volunteers and visitors arriving in a multitude of different craft. 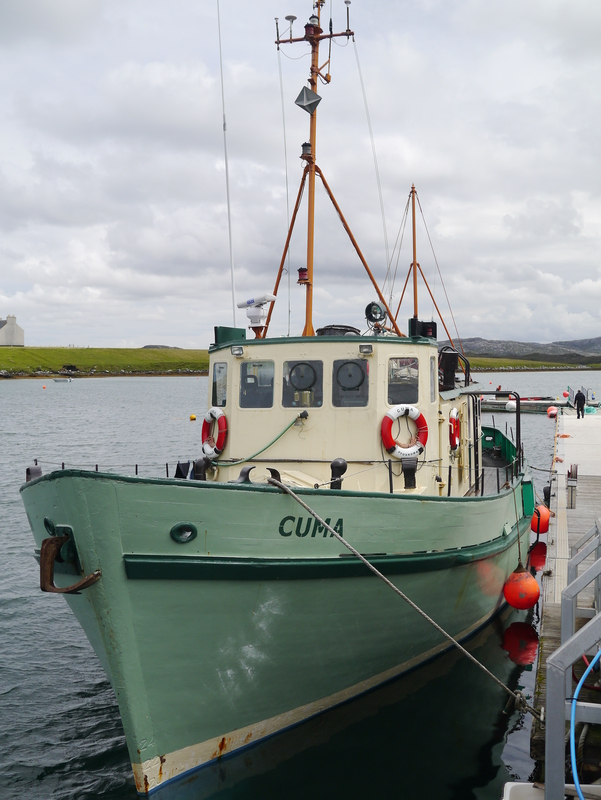 Not for me and TLF though; we wanted to be able to have time to explore as much as possible so we saved up all our pocket money for a long time and invested in a four day cruise on the MV Cuma which sails from Uig on Lewis and is skippered by the quietly assured Murdo Macdonald. Murdo collected us from Stornoway and drove us to Miabhaig where we joined the Cuma. There was a bustle of activity as Murdo, Gary, Murdo’s wife, daughter and granddaughters stowed supplies and readied the Cuma for the off. 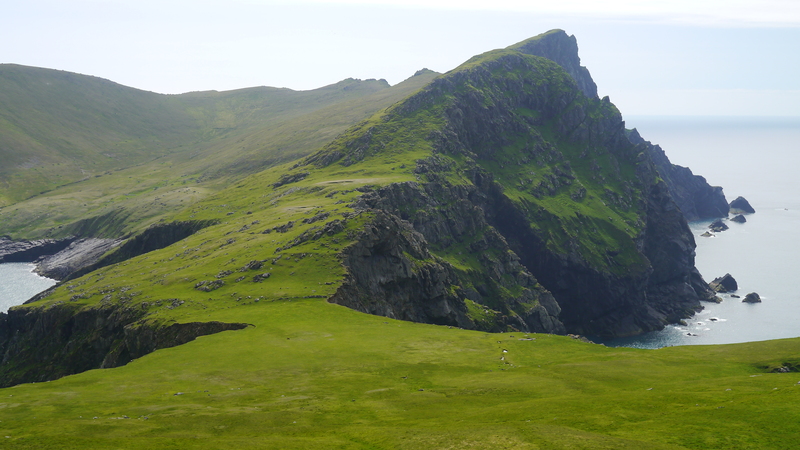 We were scheduled to sail down the coast to spend the night in Loch Reasort, but Murdo suggested that we head straight for St Kilda as conditions were good and this would mean that we’d get two full days ashore on Hirta. We weren’t inclined to argue. Myself and TLF spent the six and a half hour crossing on the deck, largely because it was such a wonderful place to be, but also because the swell was rowdy enough to make being in the main cabin a wee bit nausea-inducing. Gannets and fulmars accompanied us the entire way and several dolphins put in brief appearances. In the distance the Flannan Isles came and went to starboard (see what I did there?) and we fixed our collective gaze on the horizon. It was somewhat cloudy and overcast, so we were only around 20 miles off when we caught sight of Boreray and Stac Li on the horizon. 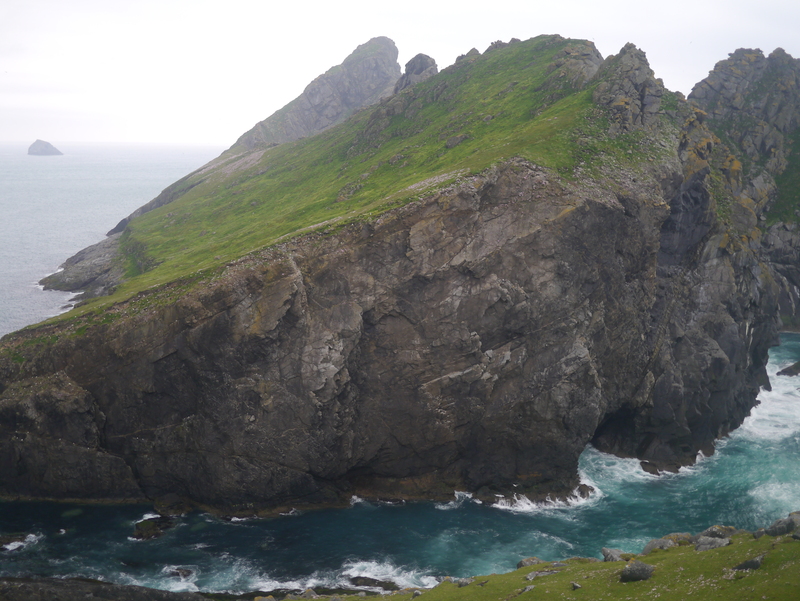 We drew steadily closer until eventually we passed by Stac Li, a vertiginous sea bird citadel. 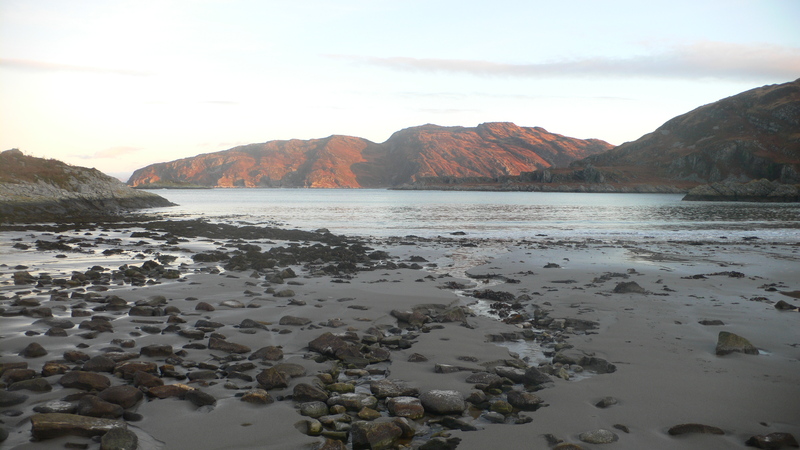 It was nearly 11pm when Murdo steered the Cuma into Village Bay, and dusk was settling. We had a late dinner and soon retired to our cabins to be rocked gently to sleep. Next morning, after breakfast, Gary took us ashore in the dinghy and we avoided the obligatory NTS ranger visitor briefing by dint of it being early on a Sunday morning. Before we headed for the hills we had a small mission to accomplish: by coincidence a friend’s mum was working as a volunteer conservator in the village so we were able to hand-deliver letters to her. She was quite surprised. 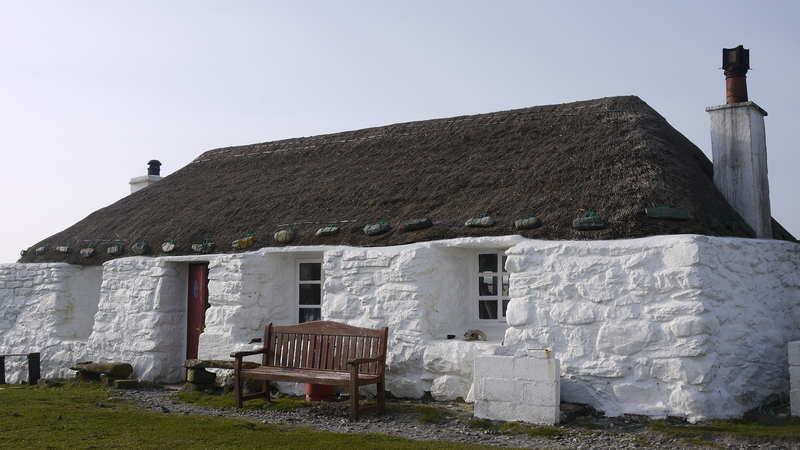 Several of the old houses along the village ‘street’ have been restored for use as accommodation for volunteers, which you can see in the pictures below. 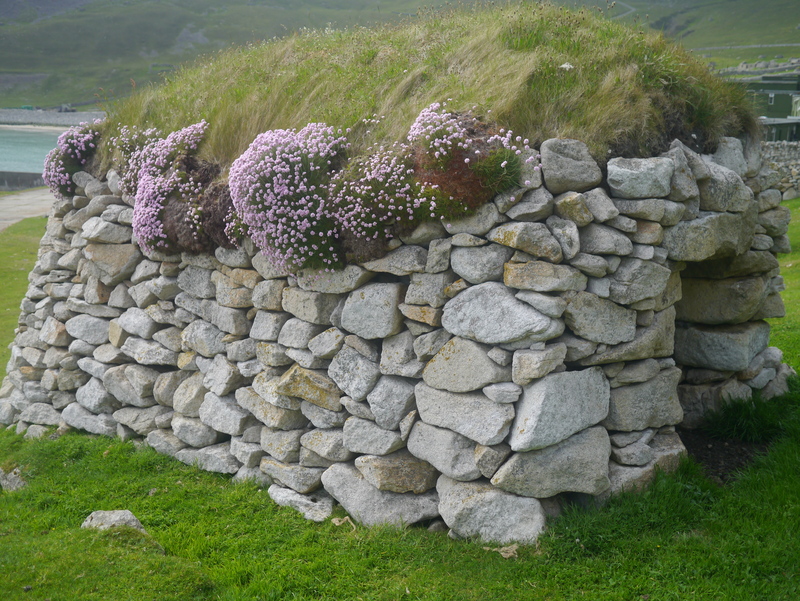 The small stone structures with turf roofs are known as cleits; these were used for storing everything from harvested sea birds to turfs drying for fuel. 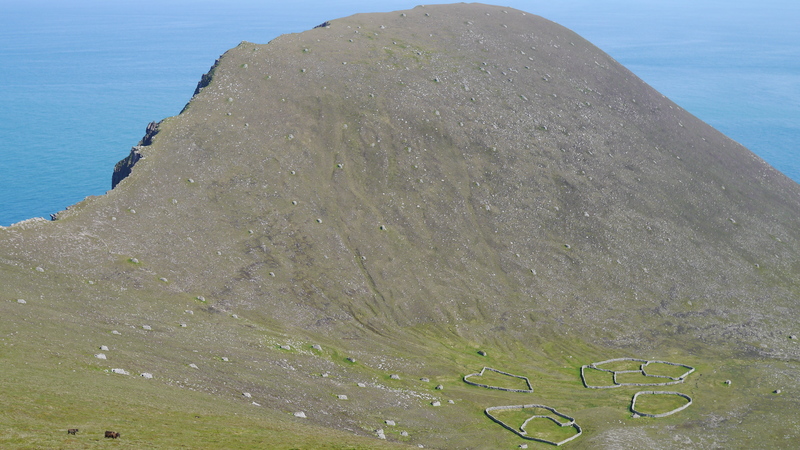 There are some 1200 of these intriguing structures dotted around Hirta alone – in the village, on the hillsides and on the cliff tops. Everywhere you look, there are cleits. 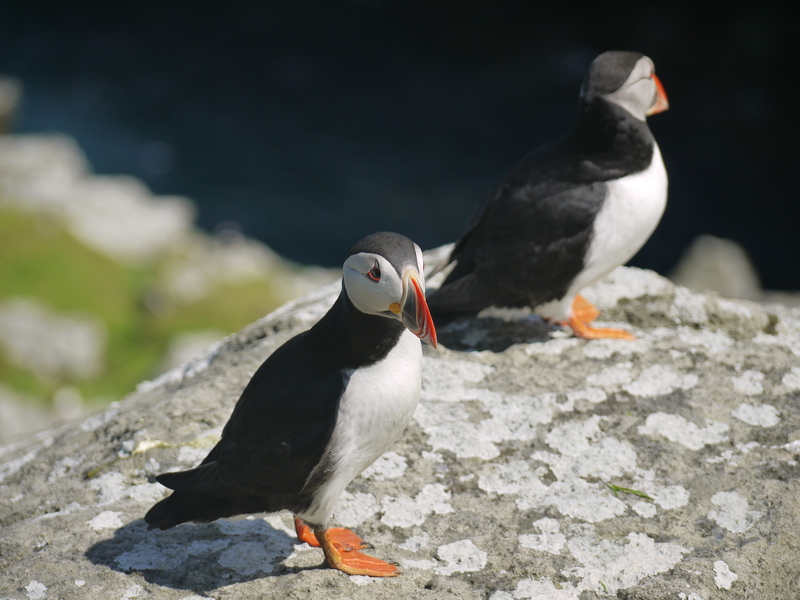 They are unique to St Kilda – or at least they will be until I’ve built the one in our back garden that TLF has requested. In the picture below the layout of the village is clearly visible with the MOD base on the left and the road leading to the landing slip, helipad and out onto the hillside. The Cuma and several yachts are moored in the bay. 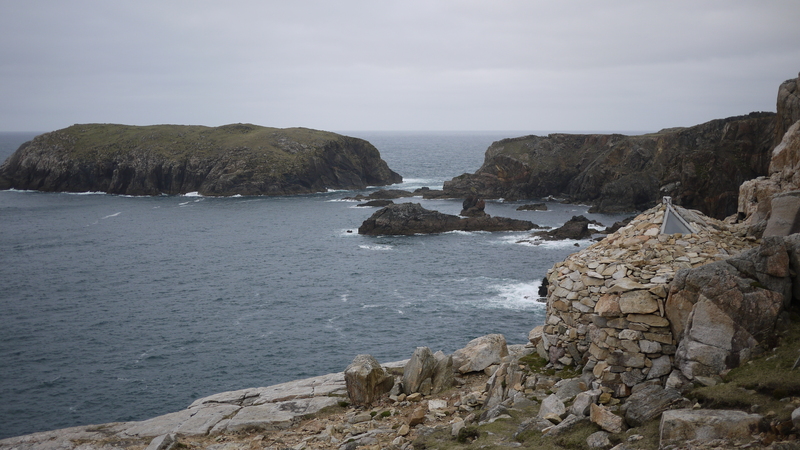 Having delivered the post, we walked along the ‘street’, passed through the head dike and contoured around the hillside towards Ruabhal, a rocky hill overlooking the narrow channel separating Hirta from Dun. 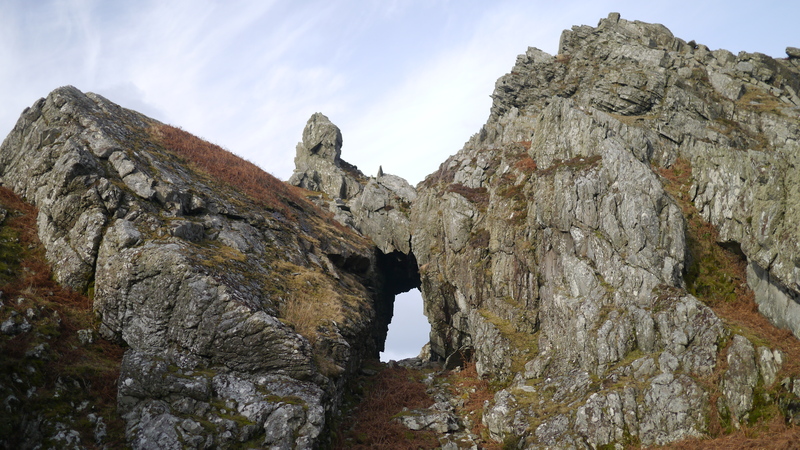 Having done so, we turned around and headed back through the curious rock window capped by a slab known as the Mistress Stone. Note the radar station on Mullach Sgar. We continued up onto Mullach Sgar and joined the radar station access road which winds its way up to the radar station on Mullach Mor. The hill tops were shrouded in clag so there were no views to be enjoyed as we continued past the transmitting station and down a short way to a bealach before making the final steep climb to Conachair, Hirta’s highest point at 430m. The clag was dense. Nothing to see here. 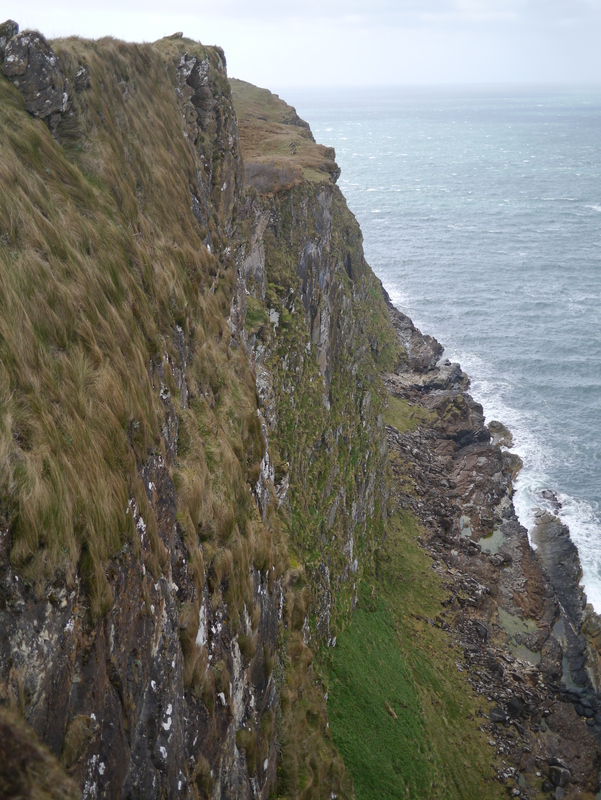 We descended carefully, aware that there are steep sea cliffs to the north. Emerging from beneath the murk we stationed ourselves by a cleit and took in the views with our sandwiches. 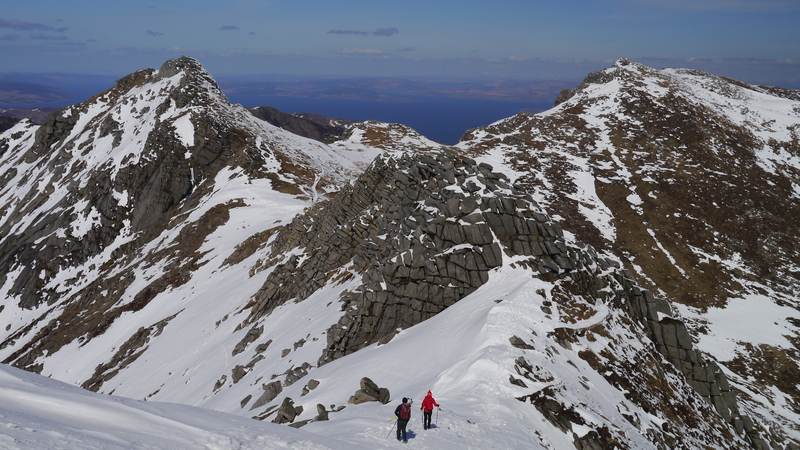 Thereafter we headed towards the cliff edge at The Gap – a col between Conachair and the neighbouring hill – Oisebhal. The sea cliffs are steep, towering, and mightily impressive, perhaps the more so in the cloud swirling around them on this very afternoon. 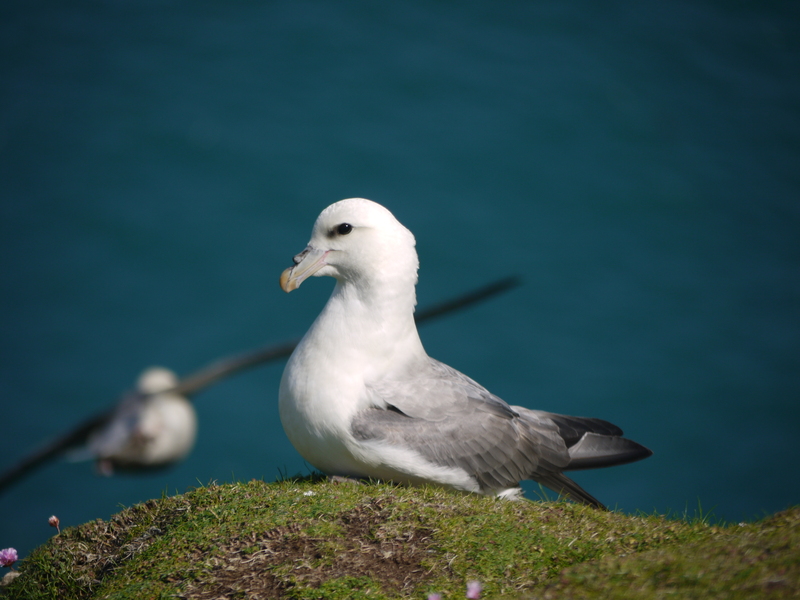 Fulmars and bonxies swooshed back and forth, the latter frequently dive-bombing us with great enthusiasm. 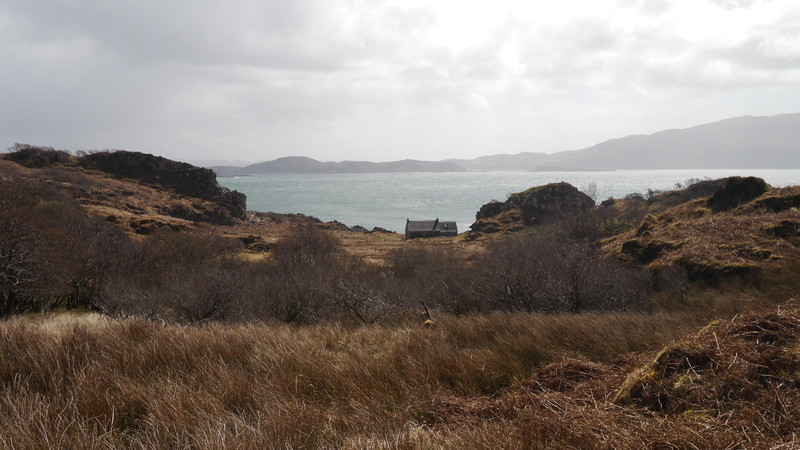 A little later, we zig-zagged down the steep flank of Oisebhal and returned to the village for a look around. 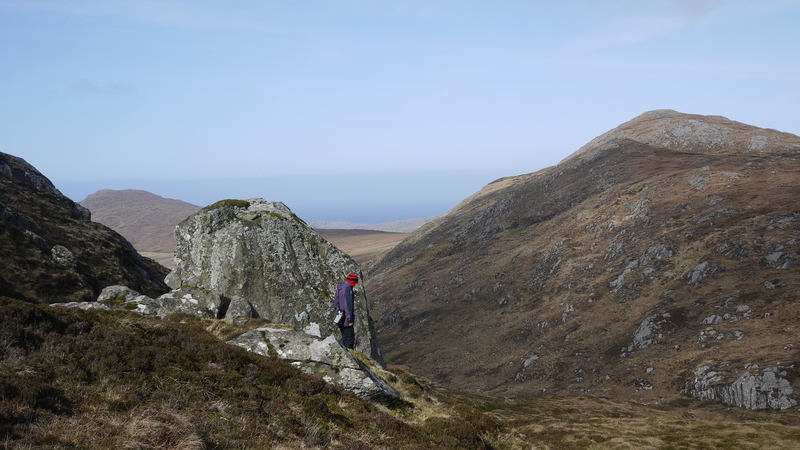 Conachair cleared briefly, so I decided to head back up to The Gap and then on to the summit – who knows when I’d get the chance too see the view from the summit again? Well, the clag descended again and I sat by the summit cairn for 15 minutes before admitting defeat and slinking back down the hill. 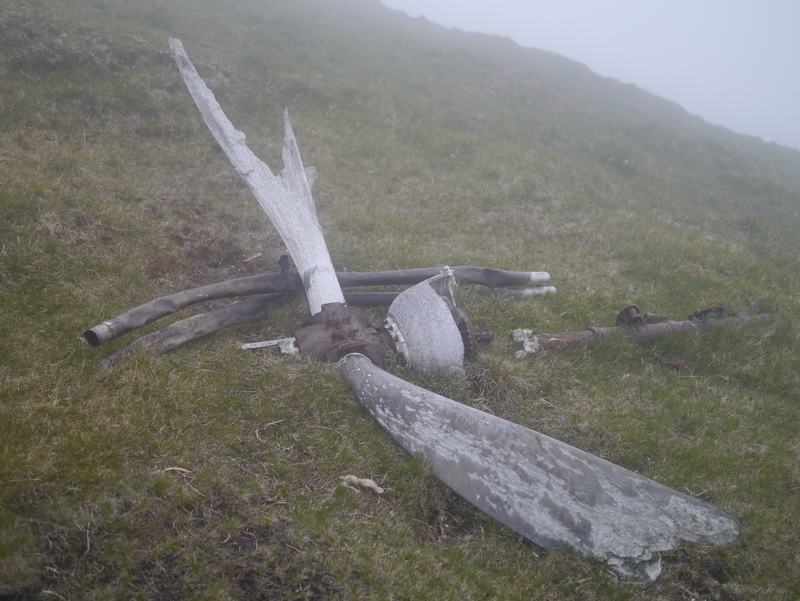 On the hillside, I chanced on the buckled propeller from a crashed second world war Bristol Beaufighter, which to my mind resembled bleached whale bones. 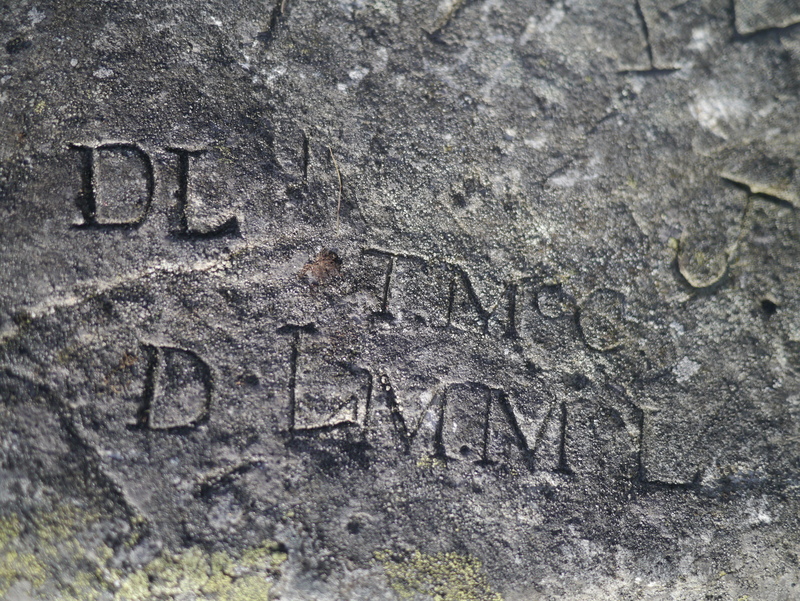 Back at the village, TLF had had a much more fruitful time exploring various fanks and cleits. Before long it was 7pm and time for Gary to fetch us back aboard the Cuma for our tea. The next morning was a bit brighter and it looked like it might improve. 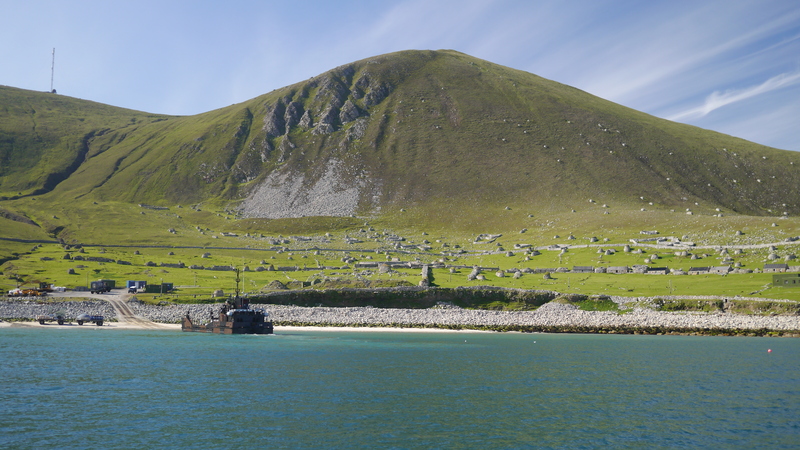 We’d decided to head over to Hirta’s north-west to explore the peninsula known as An Campar and Gleann Mor. If it stayed clear we might also have yet another go at Conachair. 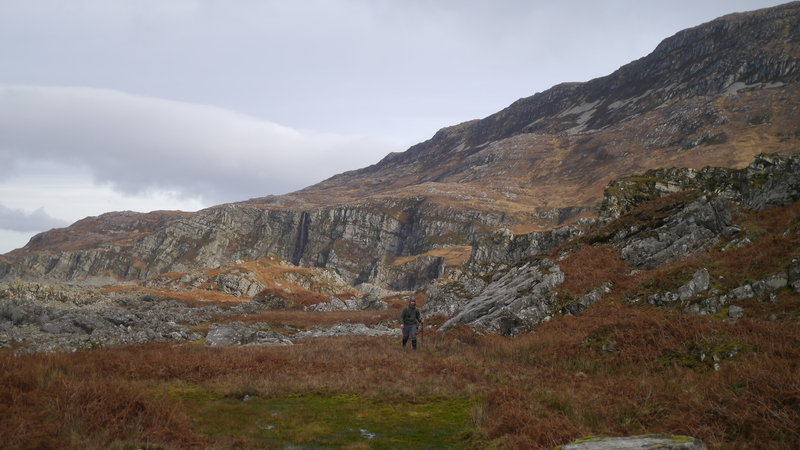 We followed the radar station access road up to Mullach Sgar and then continued west, skirting the rim above Gleann Mor. 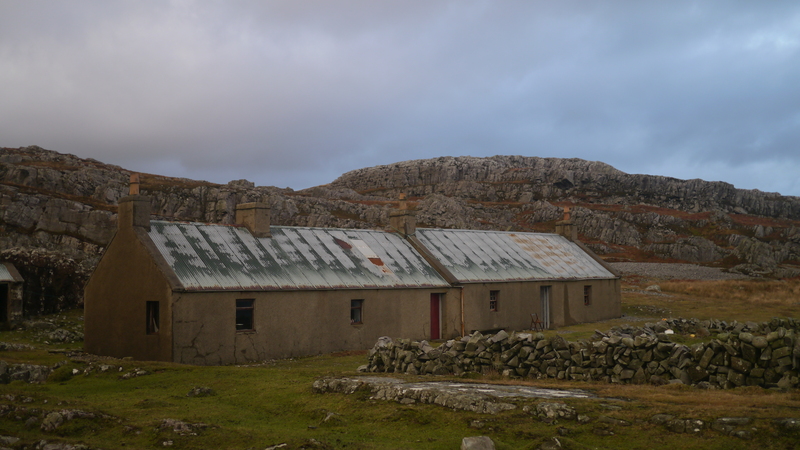 This part of the island had been invisible to us in the previous day’s clag; the contrast with the other side of the island with its abandoned settlement, NTS accommodation and radar base was startling. 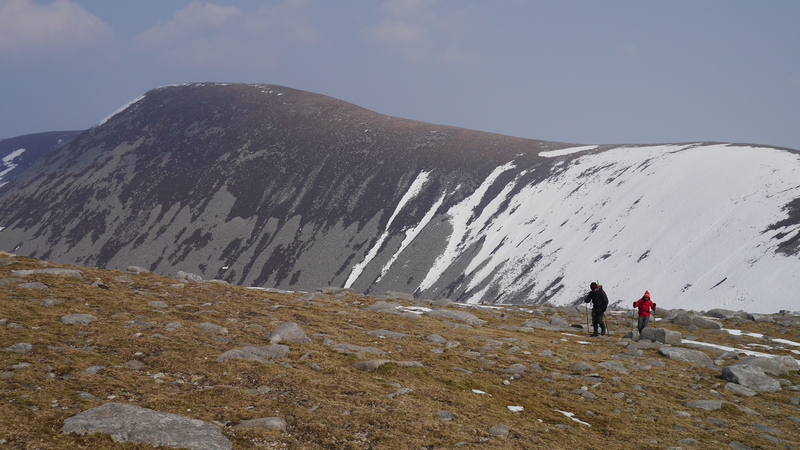 We were soon climbing to Mullach Bi, at 358m the highest point on the rim enclosing the glen. 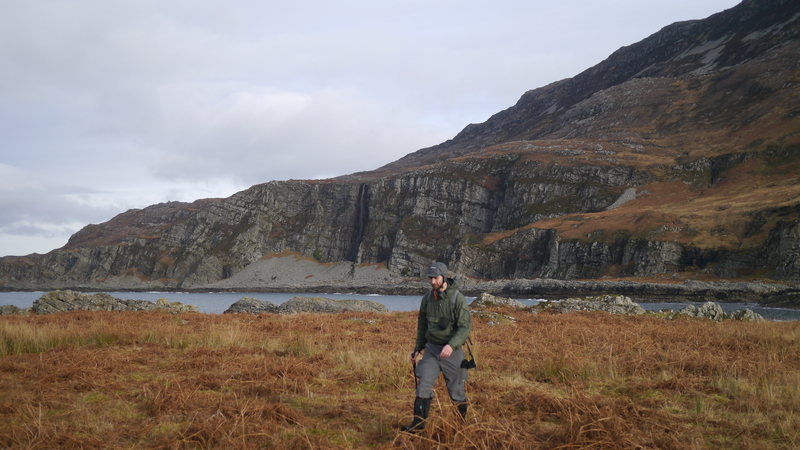 There was quite a lot of unsolicited bonxie action and one of the pesky brutes actually clattered my heid; luckily I was wearing a beanie. 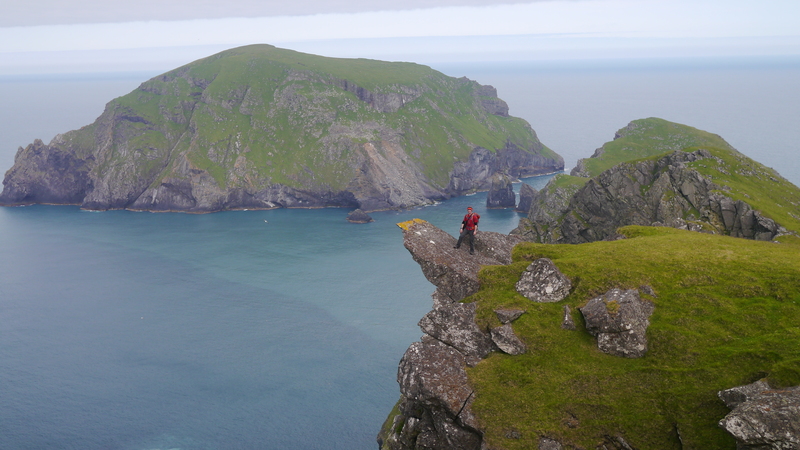 The views were stupendous as we descended the ridge above the western sea cliffs towards An Campar; the sky was clearing and our outing was turning into something quite unforgettable. 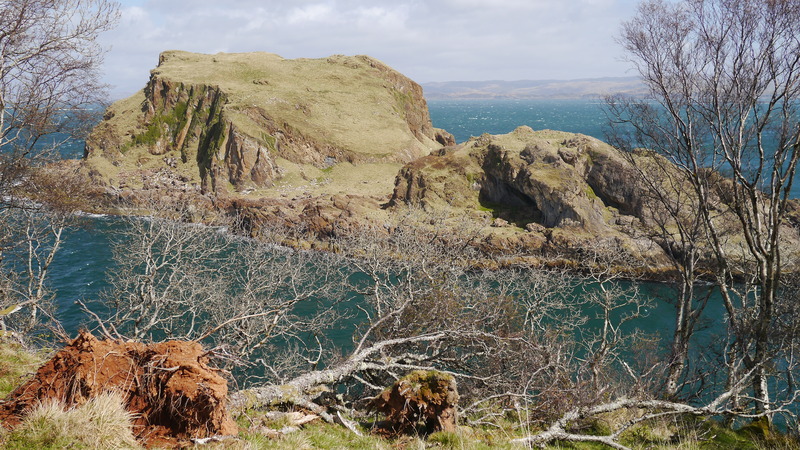 The island of Soay detached itself from the end of the An Campar headland, which did little to detract from the wonderful vista. 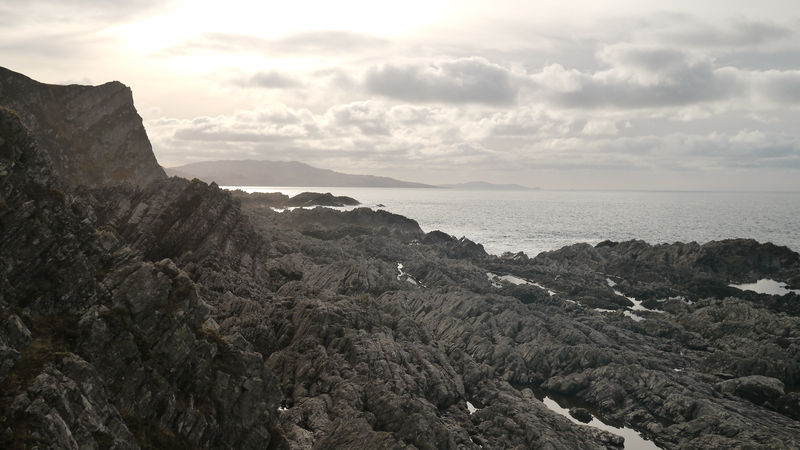 We sat for a while on the headland just absorbing the views and atmosphere of this astonishing place. Just us and the birds and the Soay sheep; an utter contrast with the relative hurly burly over the other side of the island. Eventually we got going again, keen to see as much as we could in the time left to us. 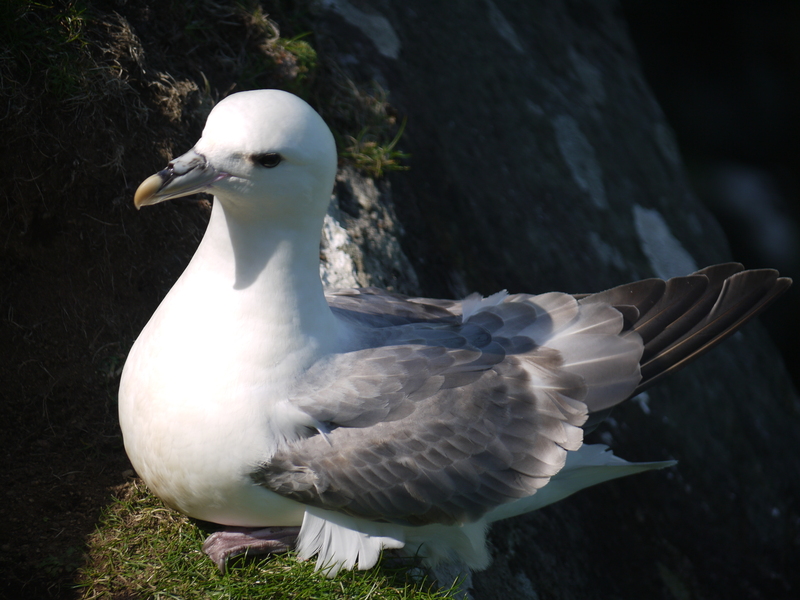 However, we’d not got far before we were caught up in the business of watching the fulmars and puffins haunting the sea cliffs flanking Glen Bay. TLF sat on the cliff tops watching through binoculars while I shimmied down a steep slope and inveigled my way into the birds’ domain. Here I spent one of the happiest hours of my life. 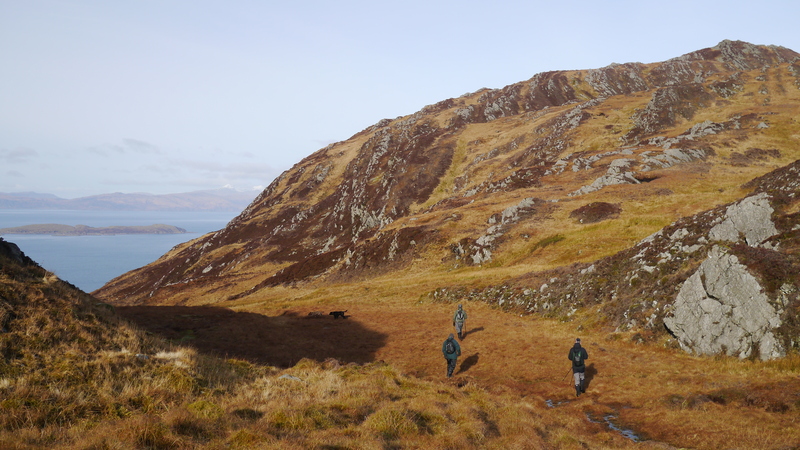 When we could finally drag ourselves away, we dropped down into Gleann Mor and after being subjected to sustained bonxie bombardment we climbed up to the bealach between Mullach Sgar and Mullach Mor. 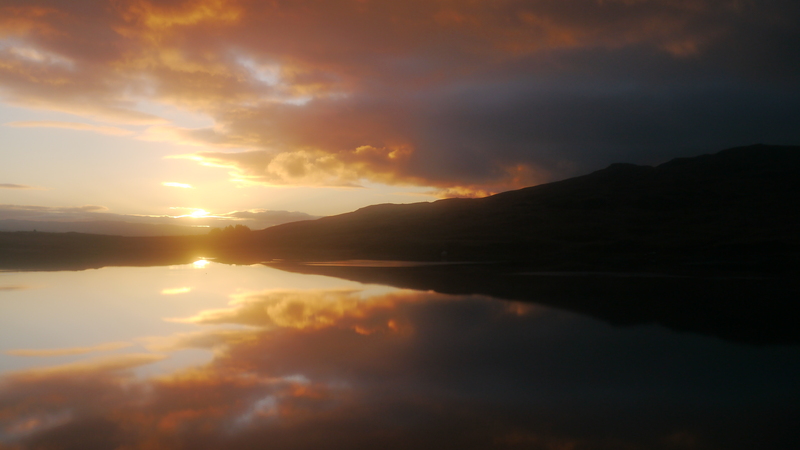 The day had become progressively clearer so there was no option other than to pay another visit to Conachair. From the summit all that could be seen in each direction was sea, save for the whale-backed chain of the Outer Hebrides on the eastern horizon. 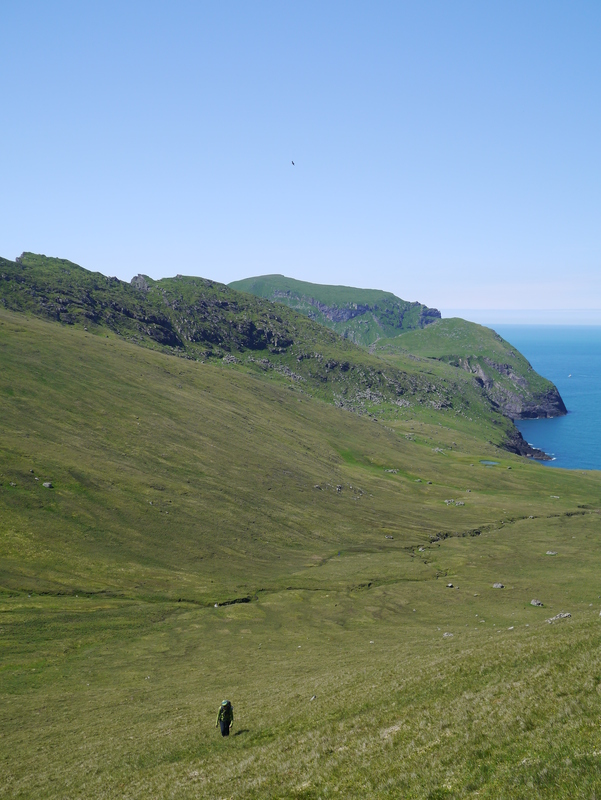 Descending from the summit of Conachair, we strode out along the narrow grassy slope jutting north from the sea cliffs, which would have been too dangerous to contemplate in the previous day’s clag. 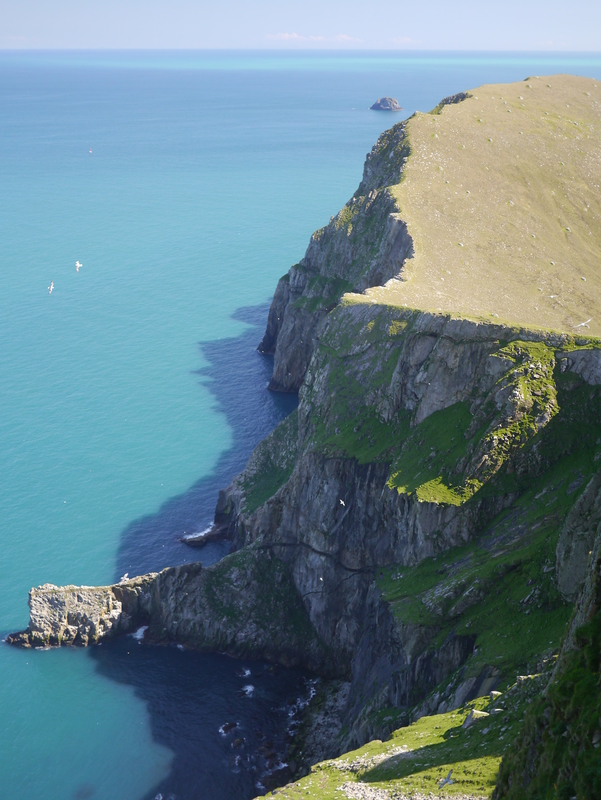 The views onto the sea cliffs were almost intimidating in their grandeur; I think I’m right in saying that these are the highest sea cliffs in the British Isles. We returned to the village and I basked in the sunshine while TLF took in a bit more of the cultural landscape. 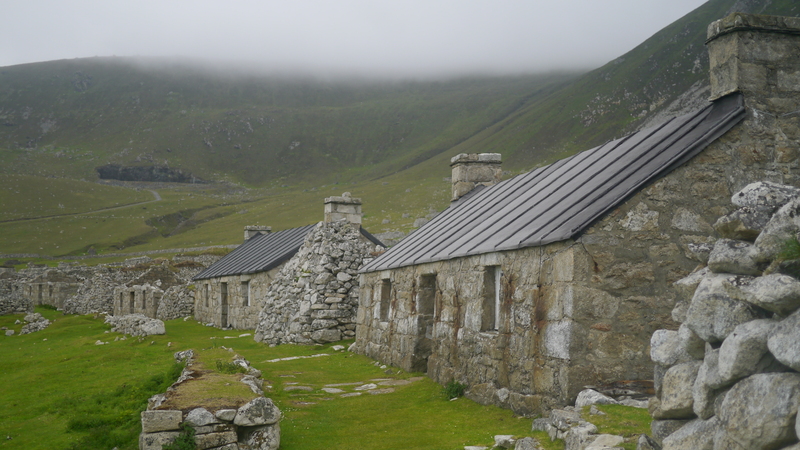 The NTS have a real challenge on their hands in preserving the St Kildans’ former home; preservation and restoration is a costly business – how long will the endeavour continue – and what exactly is it that’s being preserved, I wonder. 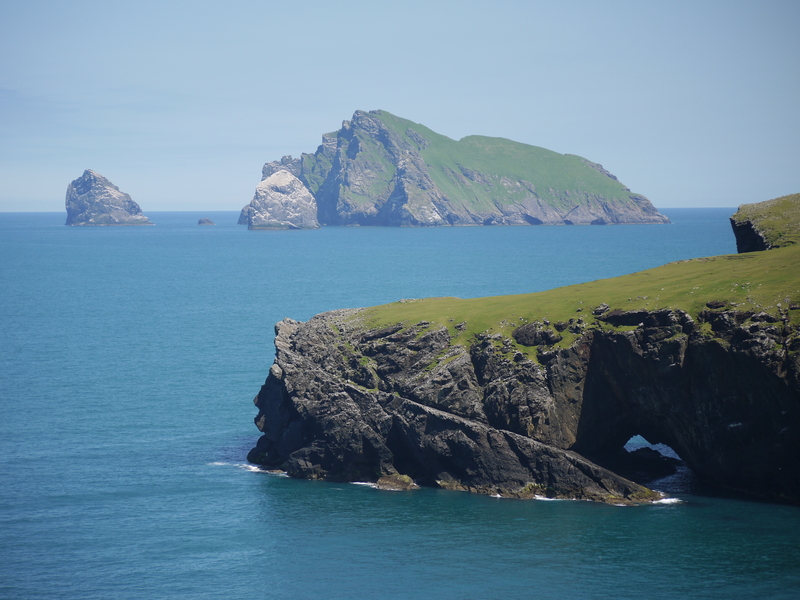 Our friend’s mum, Ros, had said when we arrived that she had expected to feel more of sense of the St Kildans’ presence on Hirta, but they’re gone and only the stones remain. 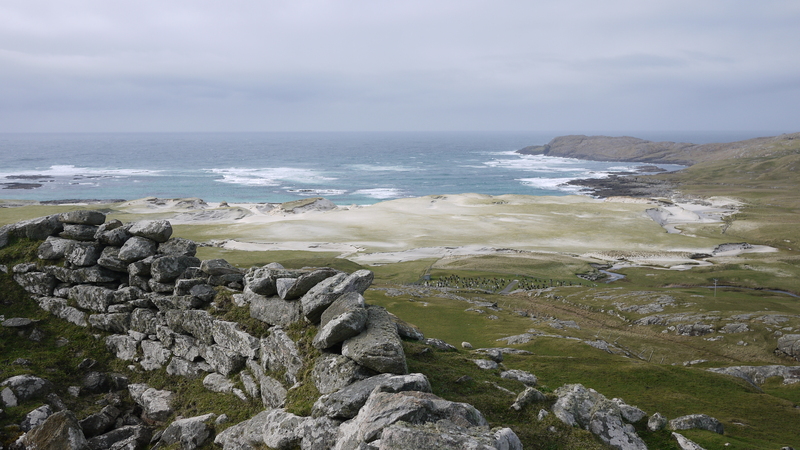 The cultural landscape is like a palimpsest, a stone tablet overwritten by the presence of the MOD base and its infrastructure, but also by the conservation work of the NTS. A paradox. A few days back it was TLF’s birthday. What do you get for the woman who has everything (including a handsome Labrador and a top of the range bald middle-aged husband)? Well, get this, I bought her a chain of small islands in the Southern Hebrides known as the Garvellachs. Generous, huh? Well, there was a catch – she would own them for a mere 24 hours before they would once again become the property of a member of the landed gentry (yawn) in absentia. TLF was thrilled. 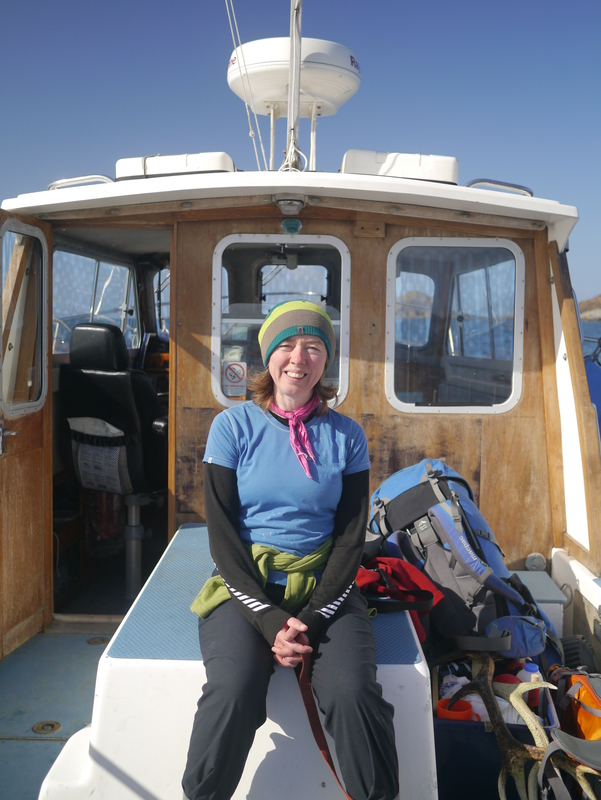 We set off from Glasgow early on Monday and were sat aboard the Farsain at Croabh Haven by 10am. The Farsain is skippered by the evergreen Duncan Philips who has been plying the waters of the Southern Hebs from Croabh (on the Argyll coast south of Oban) for 25 years. He knows the territory intimately and his enthusiasm for the islands and their wildlife is still of the wide-eyed-wonder variety even after all these years. Duncan had two other passengers for the journey out to the Garvellachs though they would be staying on-board. Every year for the last 20 our fellow passengers had made a pilgrimage out to the islands with Duncan to remember their son who had been killed shortly after his 18th birthday. 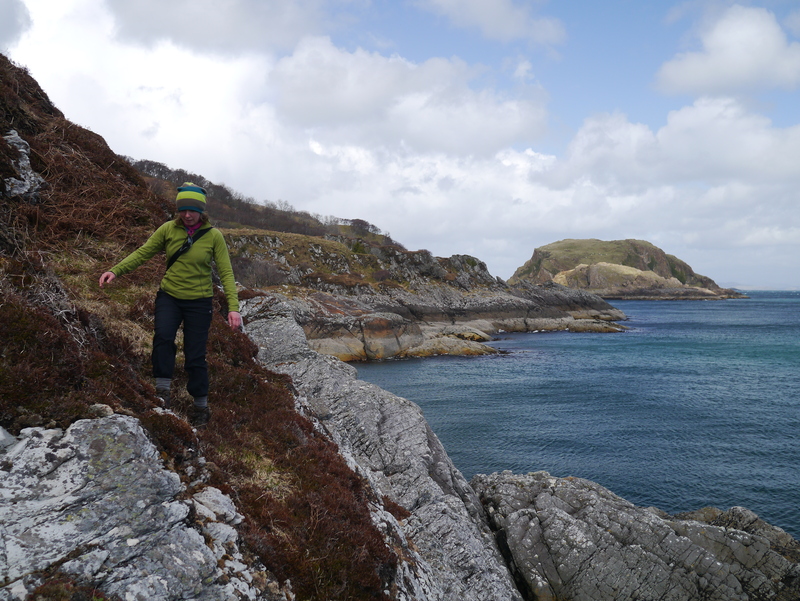 That birthday had been spent diving around the Garvellachs – from the Farsain. Duncan had presented the young man with a cake – he was, says Duncan a ‘smashing boy’. Once through the Grey Dog our ride became even bumpier as we were buffeted broadside by sizeable wind-driven waves. Were it not for the fact that we were in Duncan’s competent hands I mightt have felt a little unrelaxed… By this point it’s fair to say that Dougal had probably had enough; his ears drooped pitifully and his eyes were closed in a please-make-it-stop fashion. Still, his reward would be along shortly. After one and a half hours, Duncan put the fenders over the side and brought us alongside the small stone jetty in a little bay on the south-eastern coast of Garbh Eilach (pronounced Garvellach, geddit?) 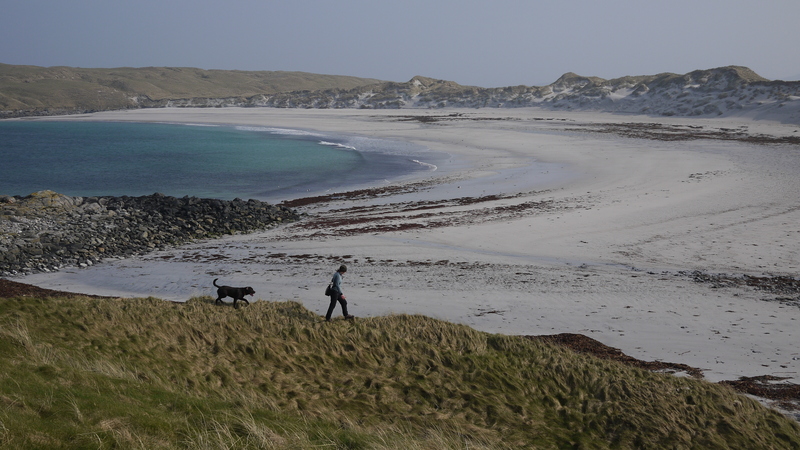 – Gaelic for Rough Island – and we scrambled ashore with our considerable load of supplies. 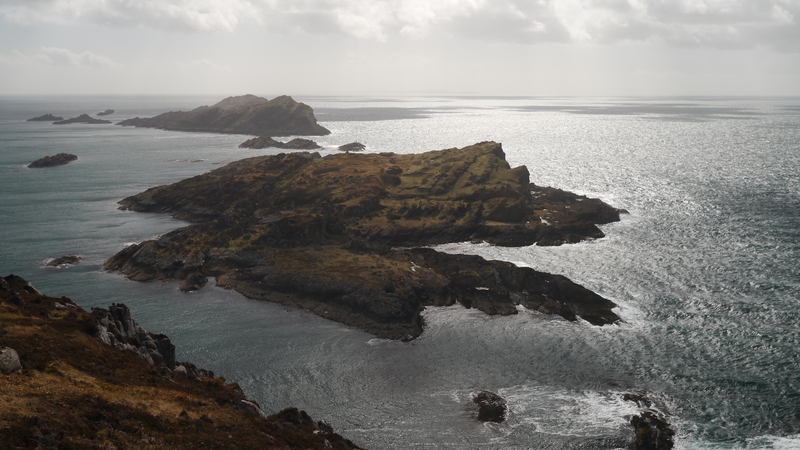 Garbh Eilach is the largest of the Garvellachs – An Garbh Eileaicha in Gaelic (Rough Islands or Isles of the Sea) – though the best known of the island group is Eilach an Naomih (pronounced Neve) or Isle of the Saints, for reasons I’ll elaborate on later. 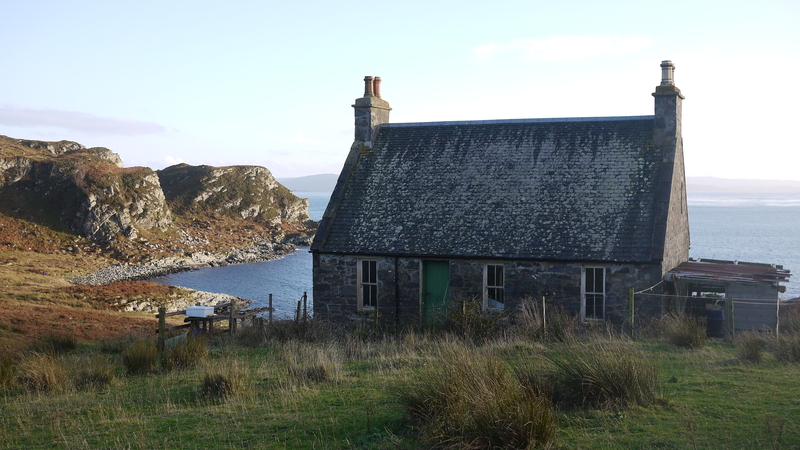 A short walk from the jetty there stands a small house of a very bothy-like disposition, but it is kept locked for use only by those on estate business. This was fine by us as there is a great spot for pitching a tent in front of the house, with a wee burn running by, and no-one was home. The island was TLF’s. 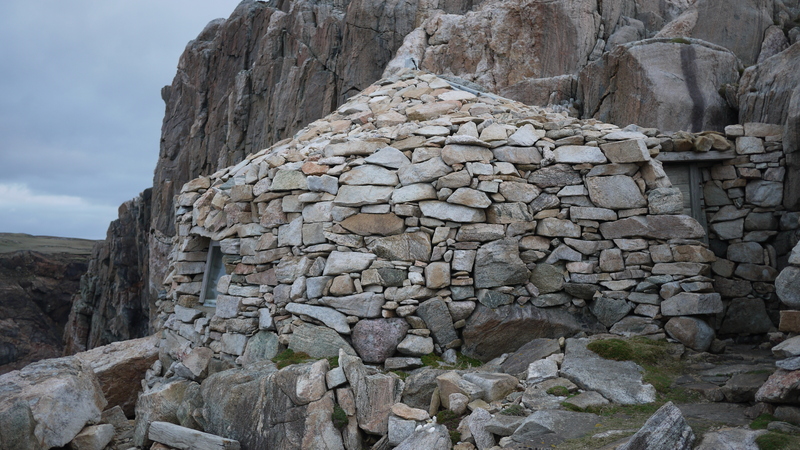 The house is the only habitation on Garbh Eilach, which is a mere 2km east to west and 1km north to south. Should be a doddle tootling around the island in its entirety in an afternoon, no? 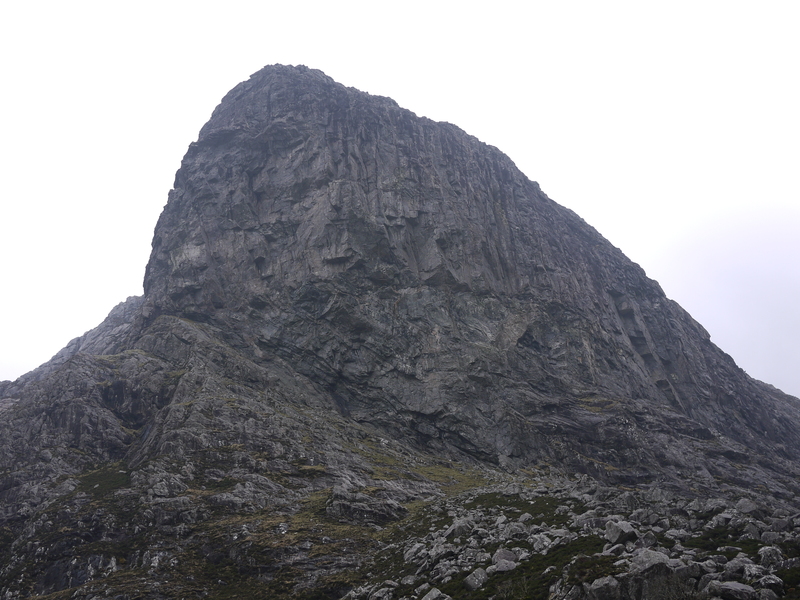 Well, Garbh Eilach somehow looked bigger in the flesh than the map suggested. 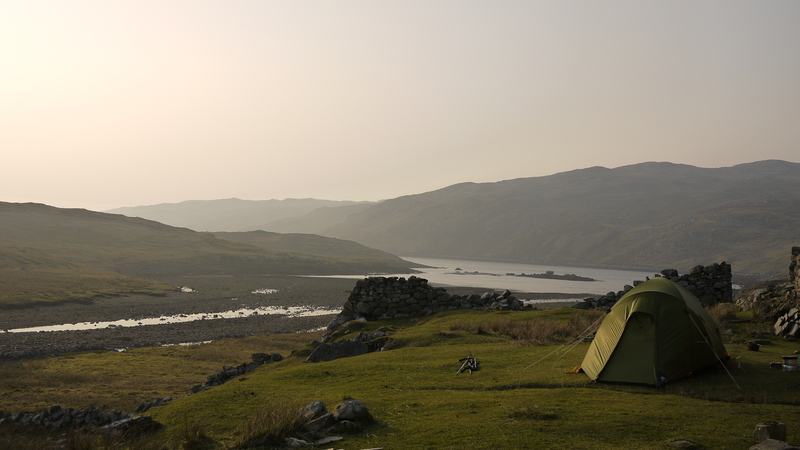 Anyway, after pitching the tent the obvious choice for an initial mini-expedition was to head north-ish through the Bealach an Tarabairt, a declivity which descends to the north coast through steep cliffs. We had a go at seeing how far we could scramble westwards along the coast and came up with the answer ‘not very’. We backtracked, climbed up back through the gap and headed east climbing to the higher ground. 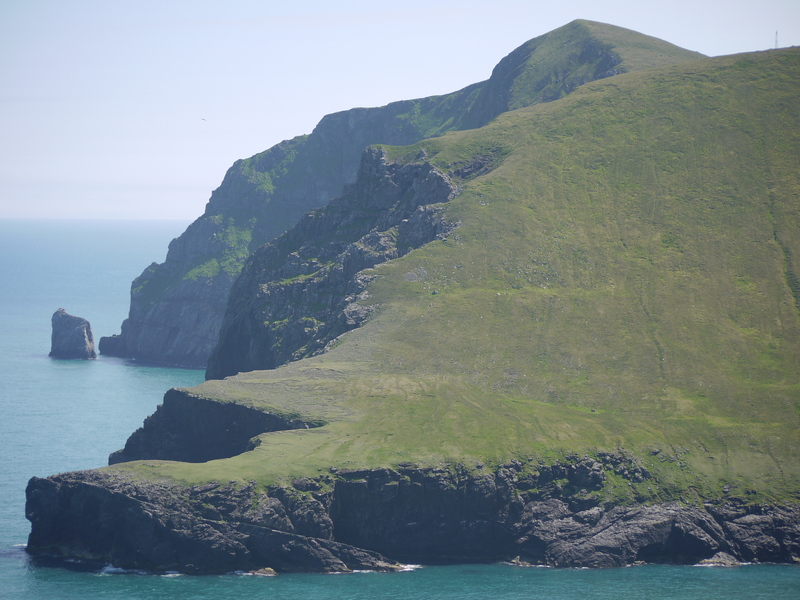 The cliffs rise to 110 metres at the highest point – impressive for such a small island. 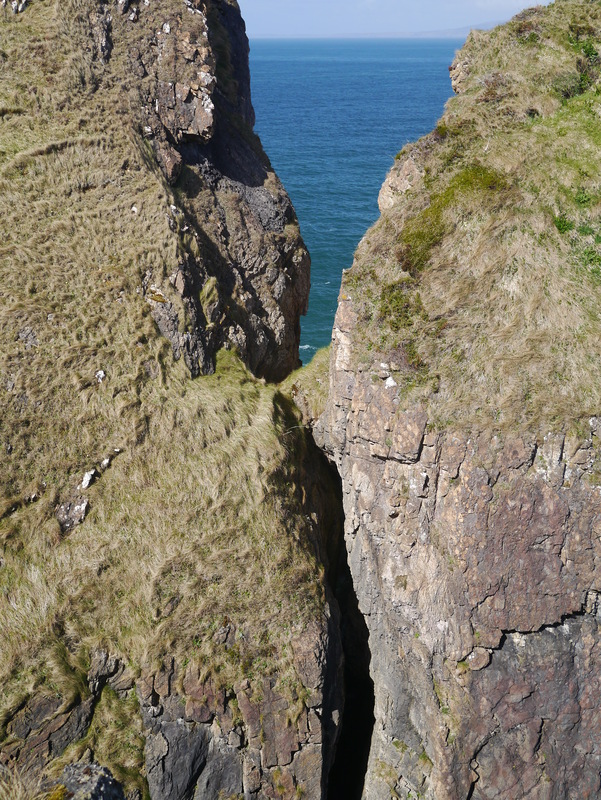 We tottered along, warning the ever-curious Dougal back from the edge. 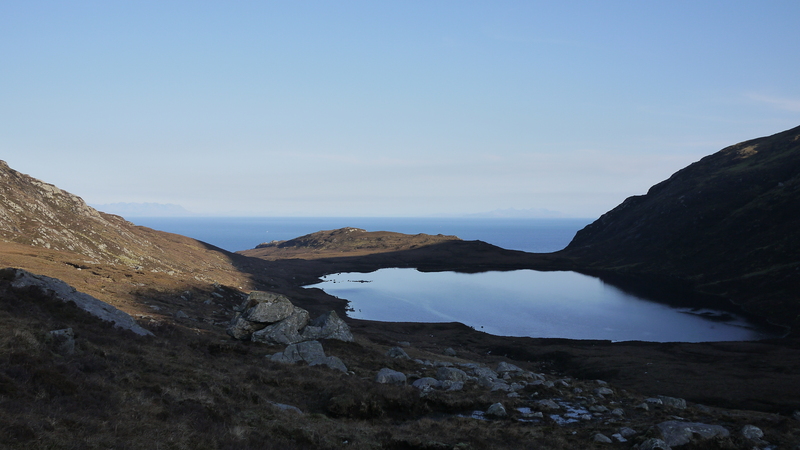 Once over the highest point, the easternmost island, Dun Chonnuill, came into view. We knew there were red deer on the island because there was plenty of poo around, but we had to wait until now to catch a first sight of around eight animals sneaking off through woods below us. The poor brutes spent the next few hours fleeing from us in a clockwise direction. We decided to drop down to the coast and attempt to work our way back around to the wee hoose as close to the shore as possible. This presented no real problems and provided an entertaining route back to base camp. 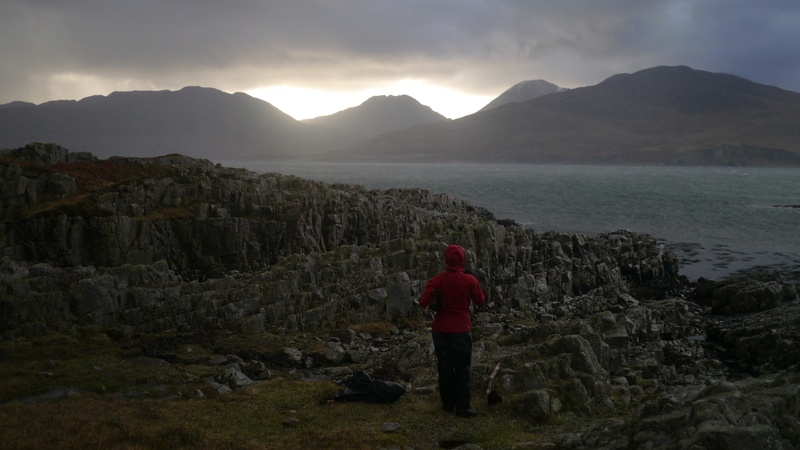 We hauled some dead wood back to camp for a fire that evening and after a cup of tea, we set off west around the coast. We were soon hopping around on the sandstone and granite rocks along the shore, staying below the dense growth of small birch trees higher up. 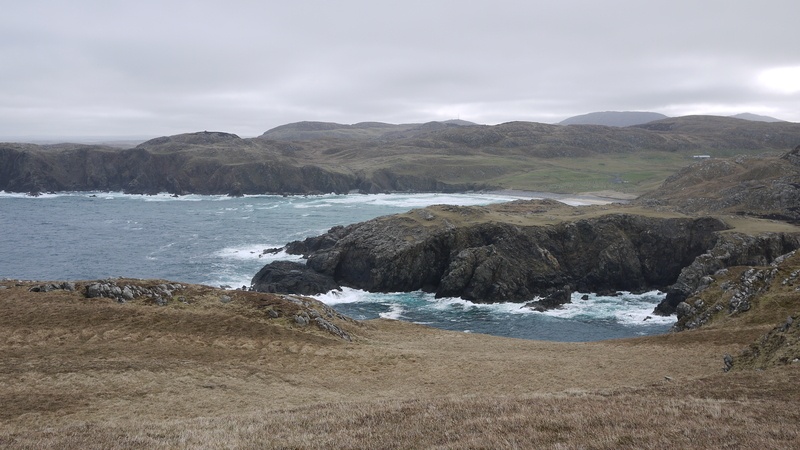 We were soon at the western tip of the island, receiving a good buffeting from the very fresh breeze; it looked like heading east along the north coast wouldn’t work so we took to the higher ground. 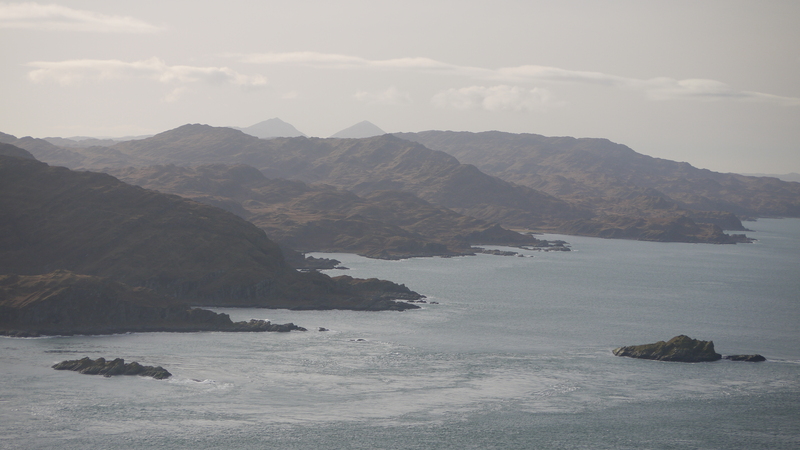 This gave us a grand view west across the islands of A’ Chuli and Eilach an Naoimh. 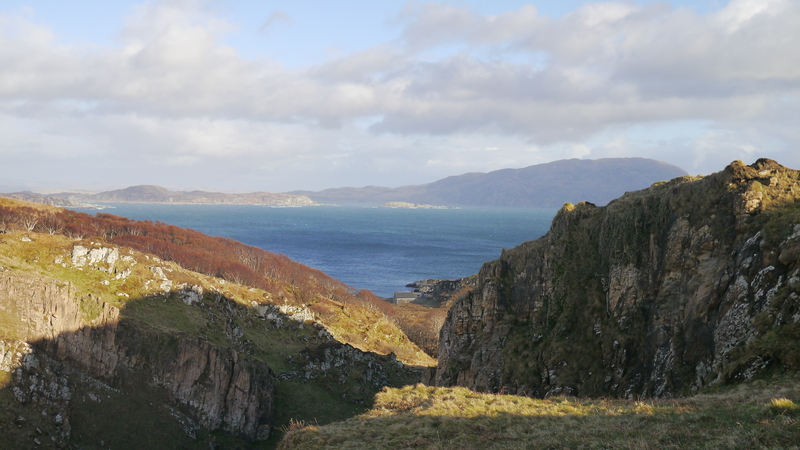 We continued along the cliff tops of the north coast until we were above the gap of the Bealach an Tarabairt once again. We started up two groups of half a dozen deer at close quarters, which was quite spectacular. The evening light was greatly enhancing the experience as well. 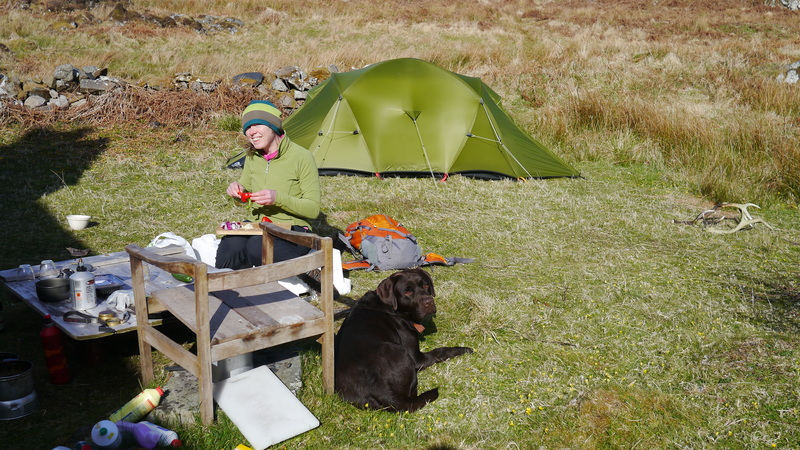 And so back to camp for elaborate birthday dinner preparations (venison burgers, rice, veg, a bottle of Chateau-Poop du Naff and a wee hip flask of Bunnahabhain in case of emergencies). Unfortunately, a late evening shower put paid to our plans to get a fire going, but Dougal at least didn’t seem to mind. I was woken by the light at quarter to six in the morning. This seemed a reasonable time to be up and at ’em in the circumstances, so I fired up the trangia (old-fashioned, slow but lovely stove) and made the first of several cups of tea. It was a crystal clear morning, but I was still a little surprised to find a light frost on and around the tent. I got a wee fire going in the handily arranged waist-level hearth on a rock in front of the house. TLF extricated herself from her sleeping bag, donned appropriate attire and joined myself and Dougal for a brew by the hearth and to watch the sun hove into view. After a gallon of tea we were ready to skip back up the high ground to the west in order to see what the world looked like in that direction this morning. The cool, buffeting wind of the day before had blown itself out and the early morning had a wonderful, soft, clear sparkly feel to it. 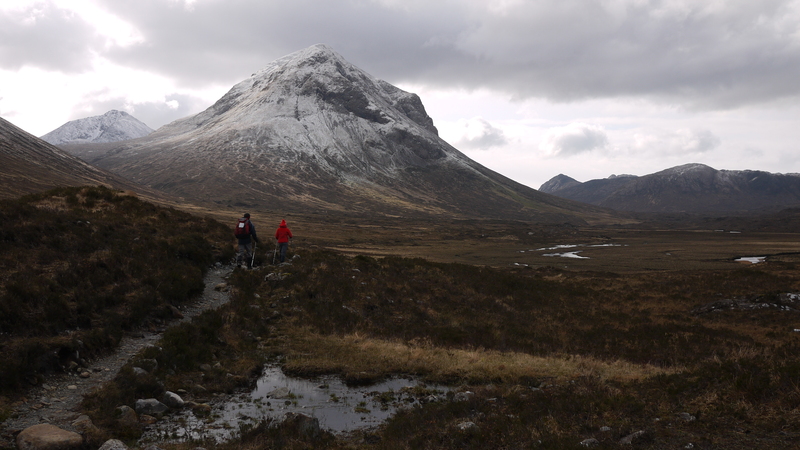 We crested the high ground and were presented with a fine view of Eilach an Naoimh and A’ Chuli once again. We hung about absorbing the views for a while before tottering off back down the hill to pack up in time for our rendezvous with Duncan who was due to pick us up at 10am. As we were breaking the tent down the thrumming sound of an engine took shape and a small boat soon appeared in the bay. A rowing boat that was being towed was brought alongside and a crewman rowed two other men and a whole load of kit ashore. I went down to the jetty to help them carry their stuff; it turns out that they were geologists come to update research one of the men had done for his phd back in the 1960s. Both chaps had a slightly crusty, ageing Oxbridge don air about them; if you’d asked Central Casting to supply a pair of actors to play geologists in a Mike Leigh film – ‘Plutons in May’, for example – then they’d look pretty much like these gentlemen. I mean no disrespect. I was interested that they were here to undertake geological research and said so. One of the chaps asked if I knew about the Snowball Earth theory, I said that I didn’t and so he began to speak to me with a slightly raised voice, clearly enunciating his words in the manner of the Brit abroad talking at Johnny Foreigner. I tried cracking a geological joke about glacio-isostatic uplift to show that, while obviously stoopid, I knew a little about geology and was interested in the subject. To no avail; the gentleman was an imparter of information and not a listener, so my feeble joke fell on stony ground. If you’ll forgive the pun. The gentlemen were staying in the wee hoose as guests of the laird; when TLF asked them whether the hoose was available as a holiday let, the slightly pompous chap scoffed at her ridiculous suggestion, making it clear that one was only afforded such a privilege by being cosy-wosy with Lord Sandys. 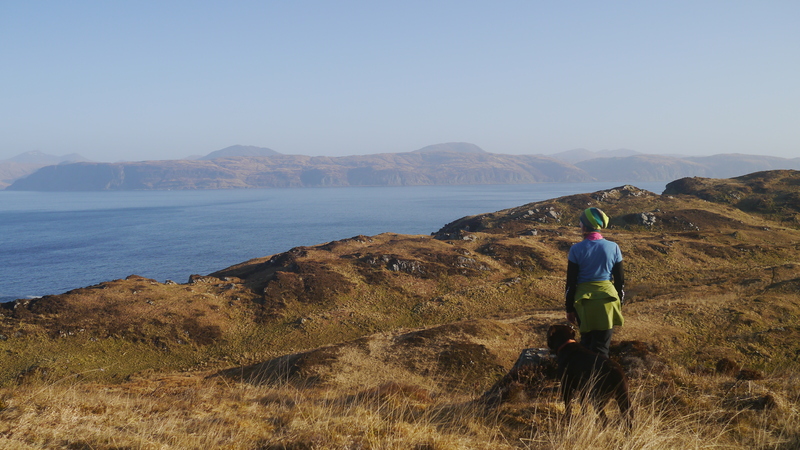 We took ourselves off for a final walk back through the bealach to the north coast, returning in time to see Duncan approaching the bay. As we headed for the jetty with our stuff, we were presented with the slightly comic scene of the venerable geologists standing by the low-lying shore, investigating the rocks while wearing rock climbing helmets. 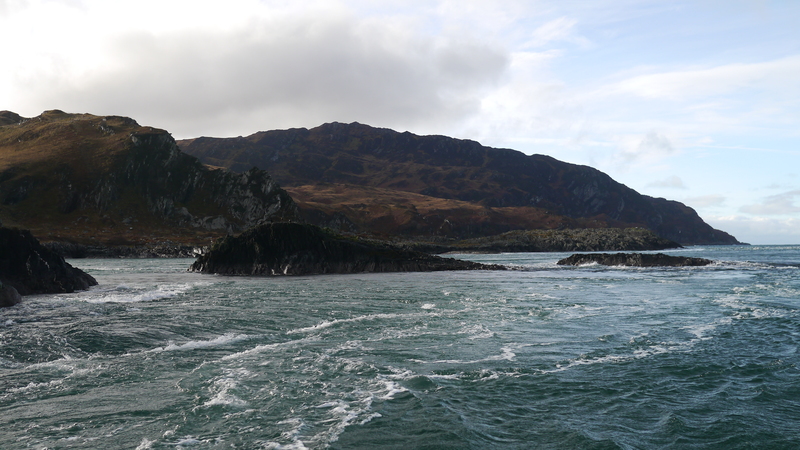 Once aboard, we chugged our way west in the lee of the islands; a much smoother ride than the previous day. 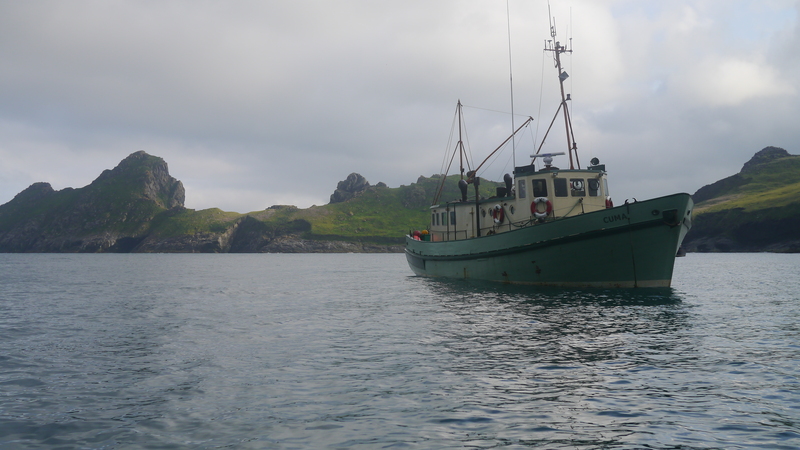 Our short cruise over, we had to jump ashore onto an outcrop of sea-smoothed basalt rock. 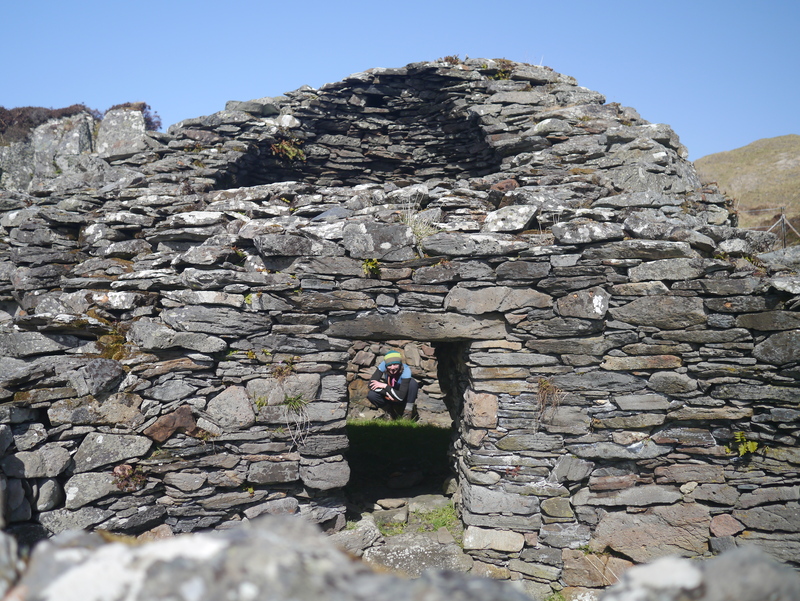 We had two hours for an exploration of the island and its remarkable ancient bee hive cell and 6th century Celtic monastery. Very impressive, I can tell you. Somewhat incongruously in this wild spot these ancient monuments have wire fences around them and information panels installed by Historic Scotland. However, HS have a tough job to maintain sites such as these in remote locales and I’m certainly not knocking them. Having completed our reverential historical tourism duties, we embarked on a brief inspection of some of the island’s nooks and crannies. Well that’s about it folks, except that the journey home was lovely. We got to see two white-tailed eagles, one perched on the branch of a Douglas fir and the other incubating on the nest. We also watched four dolphins swimming in the bow-wake of a small yacht, occasionally breaching but staying with the boat as if they were piloting it back to harbour. Beautiful. No more islands until June. Next one’s a biggy, mind. ‘Scotland in miniature’ refers of course to the lovely Isle of Arran, which – as the saying goes – contains all the fundamentals of Caledonia in one medium-sized island. 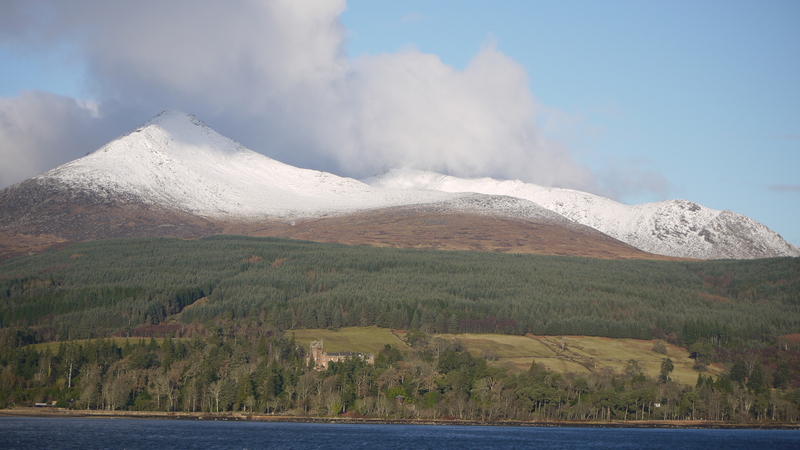 If you wanted to nit-pick you might suggest that Arran is rather short on post-industrial landscapes and windfarms, but that’s probably all for the best. 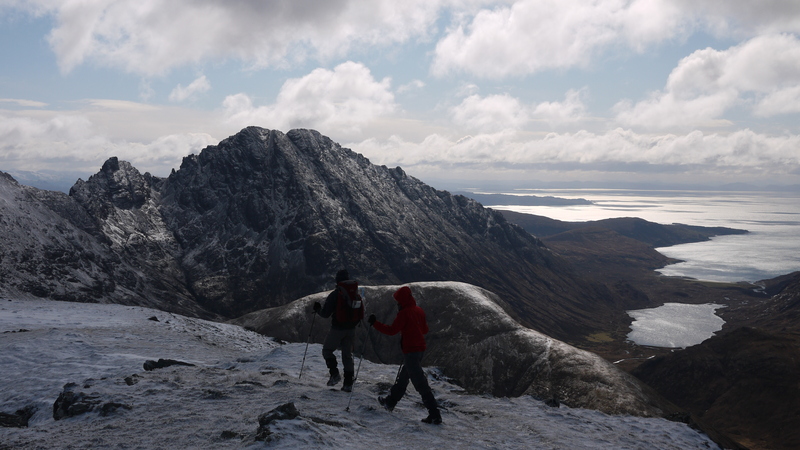 Anyway, last week I enjoyed three days of walking on Arran in the excellent company of my friends Andy and Jen. 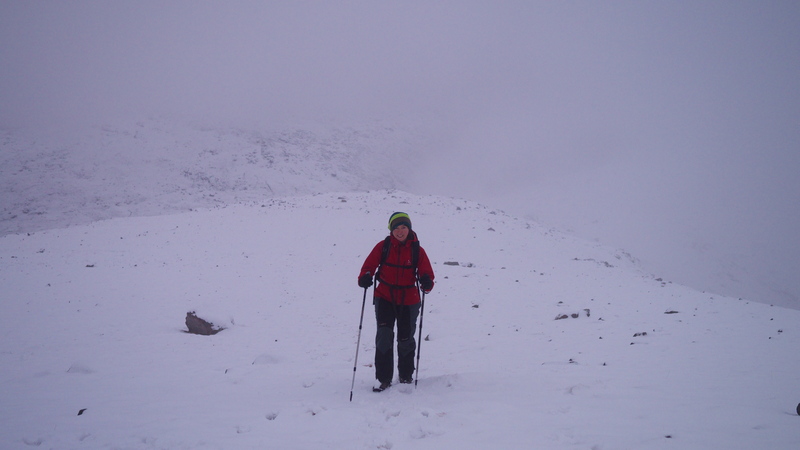 We had a few walks planned and managed to do two of the three before the weather turned shite on the last day, hence a scrambletastic assault on the Glen Sannox Horseshoe was passed over in favour of stomp around claggy moorland and forest in zero visibility. However, the day we arrived was a real beauty. From the Ardrossan-Brodick ferry, we watched the cap of cloud slowly rolling up off the tops to reveal Goatfell and North Goatfell in all their snow-plastered glory. 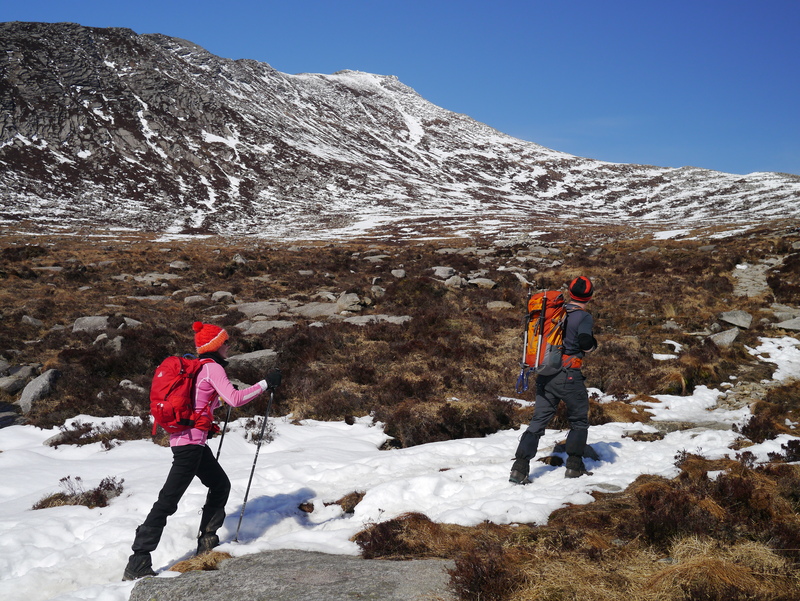 After the recent prolonged cold period it was noticeably warmer as we pulled on our packs at Clachan and strode up through the woods and out onto Goatfell’s southern flank. The lower reaches were busy with folk, many with weans, dotting around enjoying the sunshine and scenery, though inevitably there were fewer small people higher up. 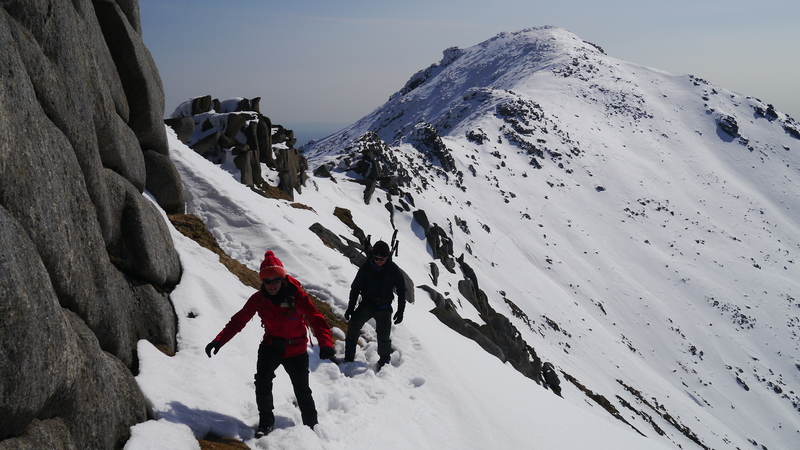 There was a fair amount of snow on the south-east ridge and it was noticeably icier as we climbed. We passed a young couple descending with a baby in a papoose-rucksack-thingumy, ‘almost made it to the top’ said the young chap; ‘cripes!’ I thought. A little higher up we passed a group of four early-thirty-somethings with another baby in a papoose-rucksack-thingumy and I wondered if perhaps it was National Climb a Mountain With Your Baby Day. 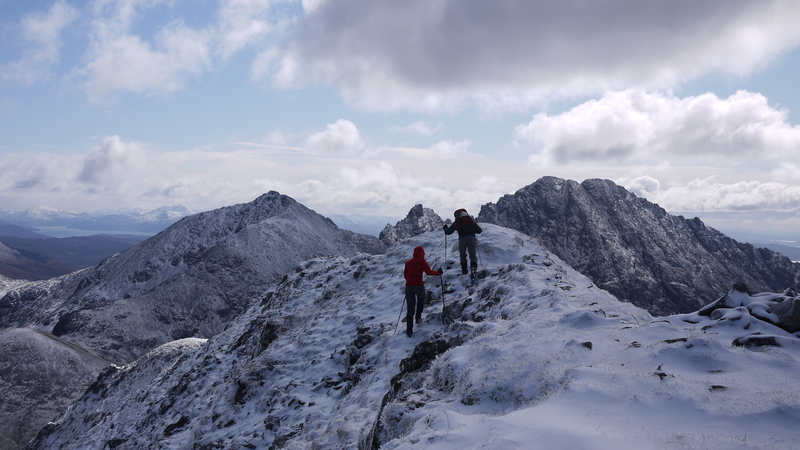 Near the summit we used our ice axes for a bit of purchase; it seemed likely that beyond the summit there’d be a bit more snow and ice along the ridge between Goatfell and North Goatfell – we had crampons in our packs in case. 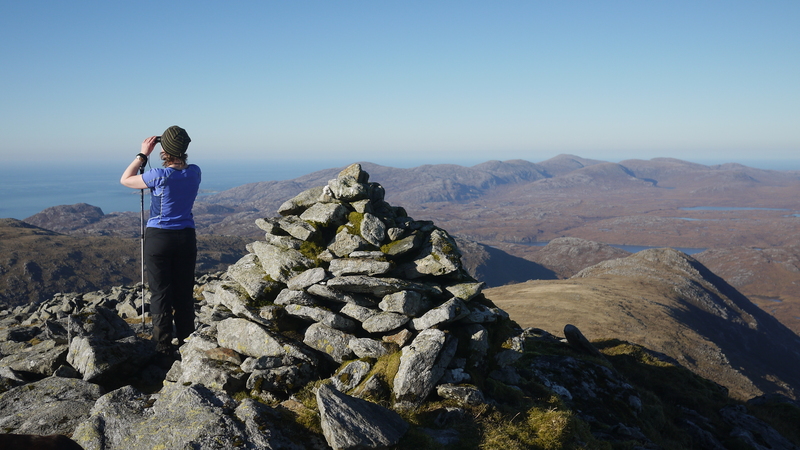 The thirty-somethings and baby made it to the summit and we all enjoyed the expansive, crystal clear view over to Cir Mhor and Caisteal Abhail. 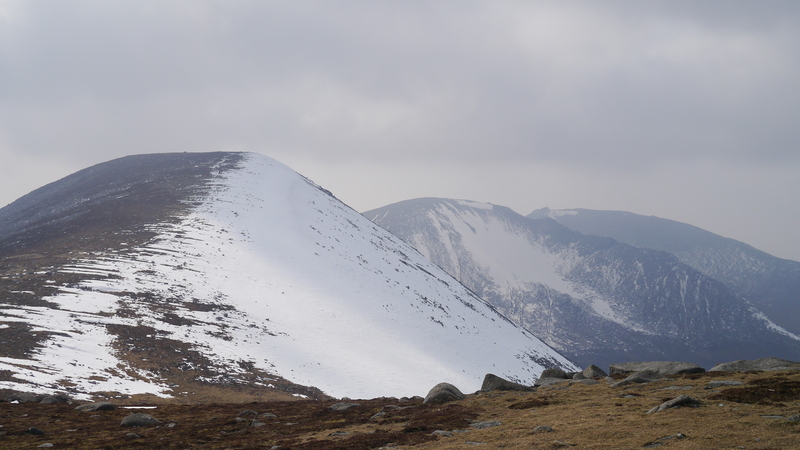 There did indeed seemed to be quite a lot of snow along the Stacach Ridge and the temperature was several degrees below in the breeze. 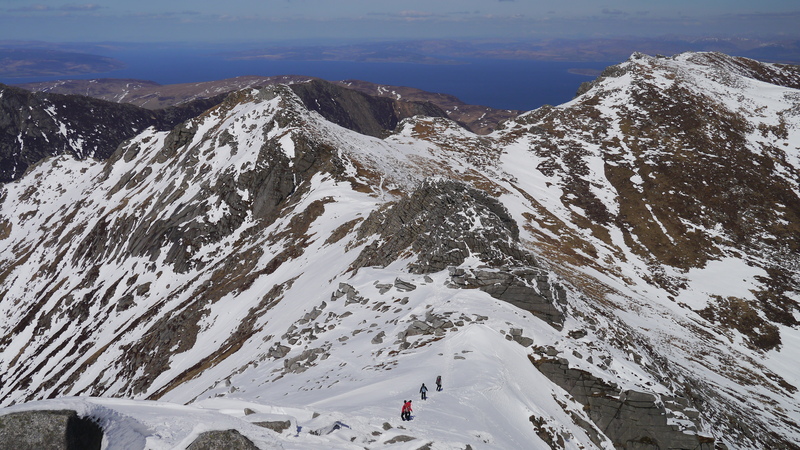 Given that they were not carrying ice-axes and crampons, I assumed that the baby-carrying party would head back down the south-east ridge, but no, on they went along the ridge towards North Goatfell with the baby bawling in his papoose; presumably the poor mite was rather cold strapped in and immobilised as he was. In this instance the weather was cold though otherwise just about perfect; it’s not that conditions were very difficult or scary either, but I reckon the MR wouldn’t have been happy with these people had they had an accident with the bairn. I have to say that they were really nice, friendly, intelligent young people, but if they’d been from a different demographic taking a similar degree of risk in a different context, someone might have phoned Social Services. 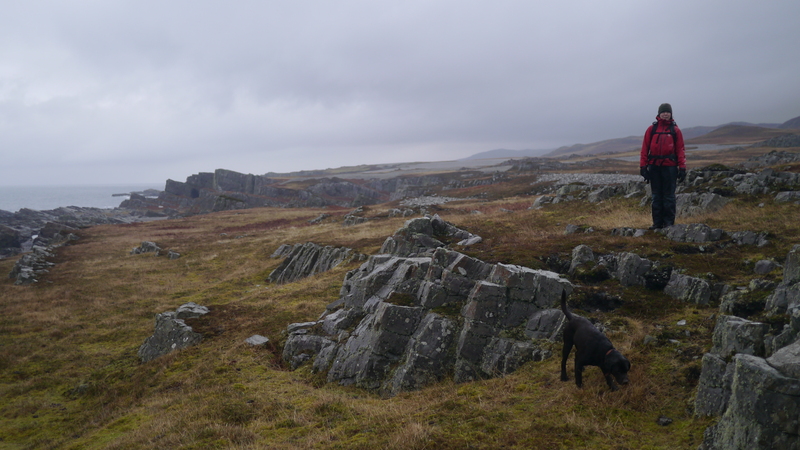 Anyway, we continued along the ridge and I have to say that the scrambling across the tors wasn’t what you’d call a piece of cake; enjoyable, but with a wee bit of an edge. I’m glad I’d decided to not bring Dougal (large broon dug) along. 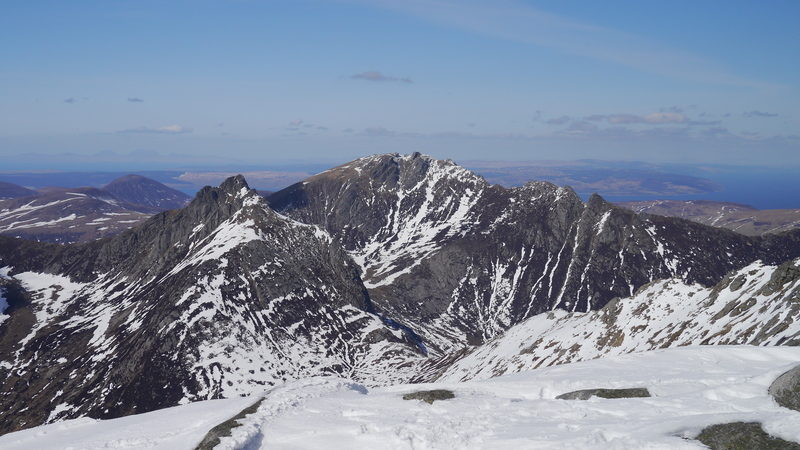 The descent from North Goat Fell down the ridge to The Saddle requires care, but the views are marvelous. I caught up with the Baby Gang and gave the bairn’s mother my ice axe as she admitted to being on the edge of her comfort zone. They got down to The Saddle safely and when we left them they were debating whether to take the easier, longer route back through Glen Rosa to their car or the shorter route with a tricky scramble down into Glen Sannox and thence to their holiday cottage. I don’t have kids, but I’d be interested to hear from any outdoors folk who do have offspring about what they think about the line between challenge and risk when it comes to children in the great outdoors. I’m happy to be illuminated! We had another dry day, with a mixture of sun and cloud; the light was very hazy hence the pics aren’t great as I’m too lazy/stoopid to make the best use of my camera’s talents. 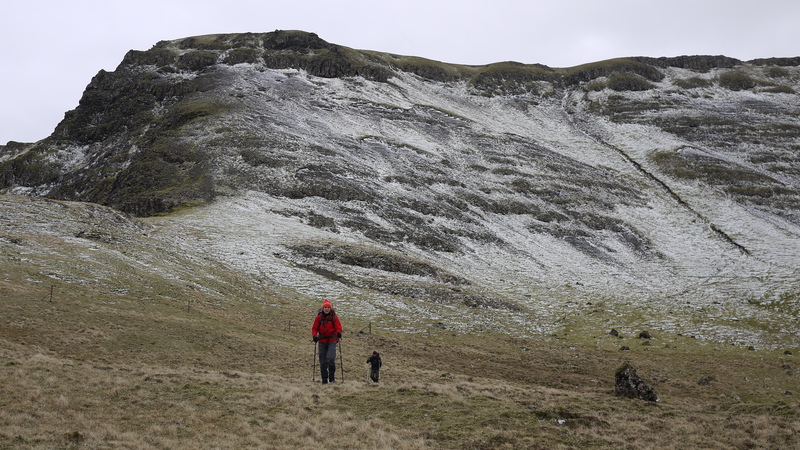 Though there was virtually no snow on the east of the ridge – as in the pic above – the western side had a fair old covering. Lower down the snow was very deep in places, evidence of the recent massive dump that shut Arran down just a few weeks ago. 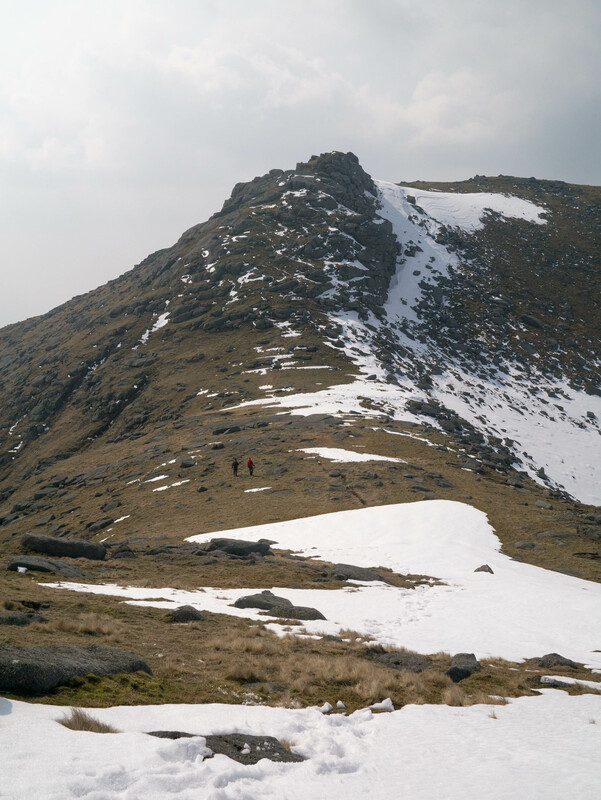 We tottered up to Coire-Fhionn Lochan along the course of the still snow-bound metalled path then climbed to the bealach between Meall Bhig and Beinn Bhreac. Looking down on the loch you could see that it was still partially frozen. Too chilly for a dip anyway. Though TLF may have had a go if she’d been with us. 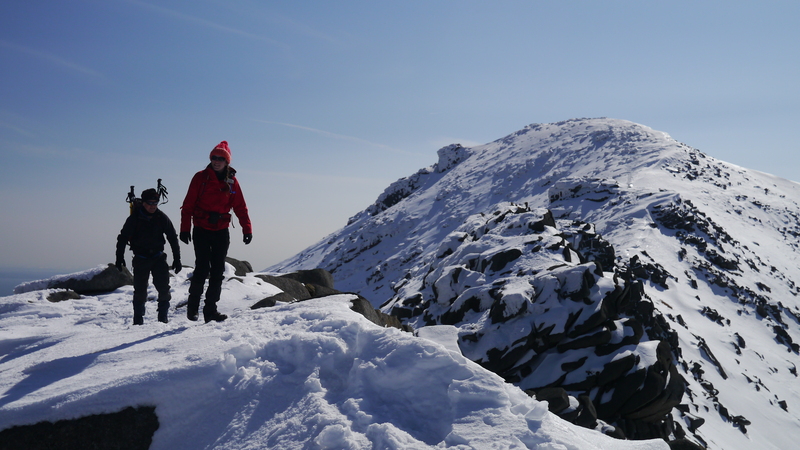 We climbed south then plodded up along the broad ridge, taking in the unnamed top at 653m before reaching the summit of Beinn Bhreac (711m). 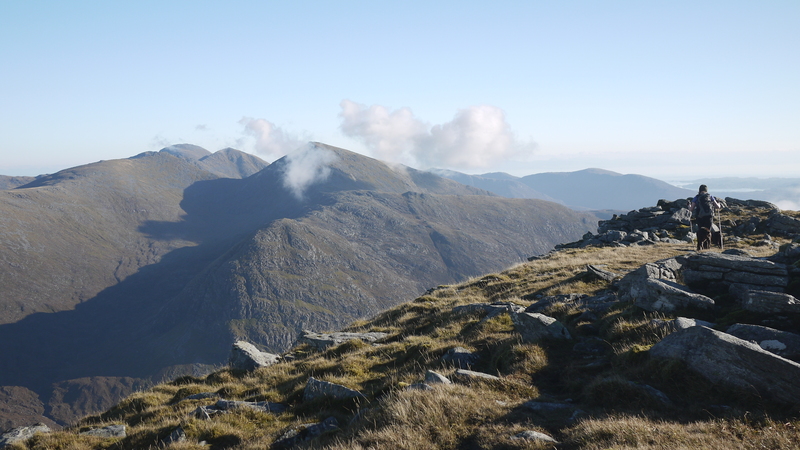 Anyway, we descended to the south-east before reaching the Bealach an Faraidh then swinging west to climb steadily up the flank of Mullach Buidhe (721m), the slightly higher, easternmost summit of Beinn Bharrain. 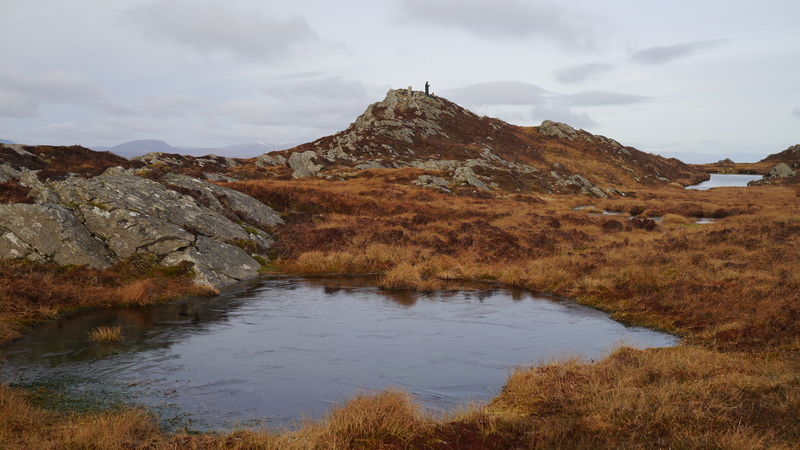 From the summit trig point we continued west along the ridge, dropping a little before climbing up the granite tor guarding the eastern flank of Beinn Bharrain’s western top, Casteal na h-Iolaire, which I believe translates as the Eagles Castle – get you! 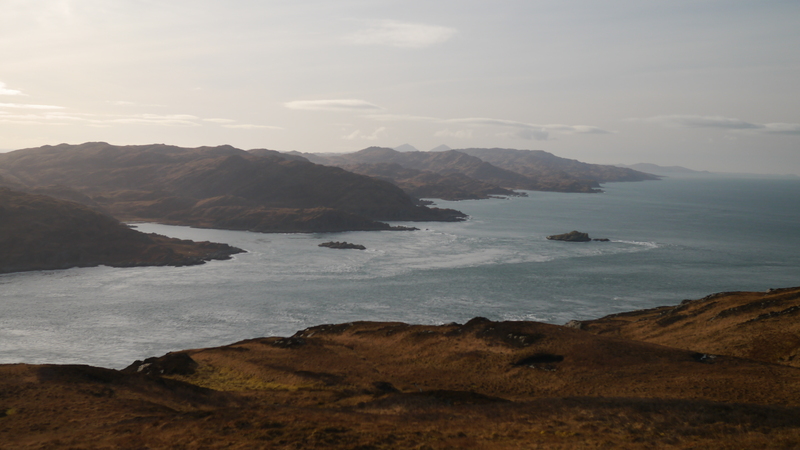 From the top (711m) there is a very long and pleasant descent down to the village of Pirnmill on the west coast. After descending the long north ridge of Beinn Bharrain we followed the gorge through which the Allt Gobhlach flows down to the sea; the gorge still held a considerable volume of snow and many of the birch and dwarf oak trees clinging to its sides had been uprooted or had limbs broken by the weight of white stuff. Arriving at Pirnmill we rested awhile on a bench by the shore and enjoyed a bottle of Arran Ale and a sarnie. Three women with young boys pootled along the shore and when one wee lad got too close to the gently lapping water, his mother bawled him out something rotten. Bit of a contrast with the previous day! The next day we’d planned to tackle the Glen Sannox Horseshoe – a big, rufty-tufty day out with mucho scrambling, but the weather was shite, so we pootled round boggy moorland and forest in deepest clag. Camera stayed in bag, obviously. Thanks for listening. February has been a bit of a bumper month in WoW world. 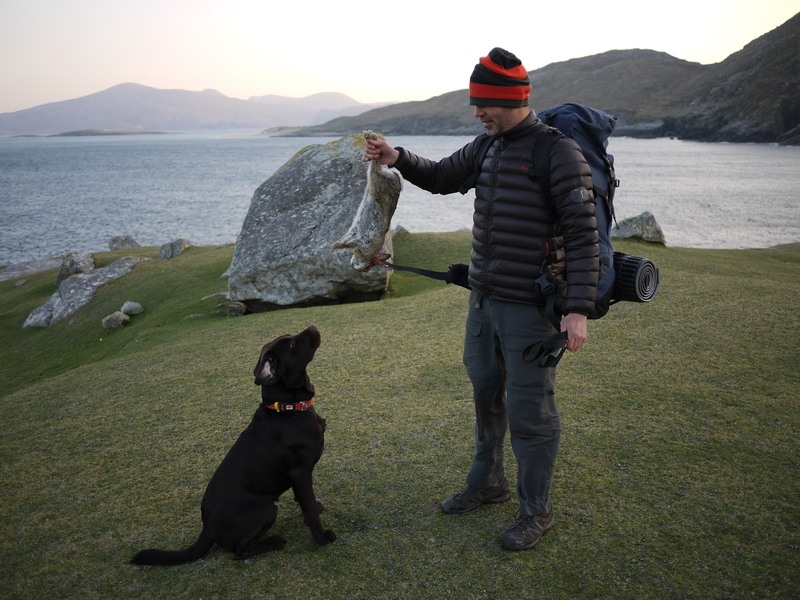 A few days after returning from James’ stag ‘do’ on the unpopulated Hebridean isle of Scarba, I set off for a week on the isle of Lewis with TLF, Dougal and a couple of friends. 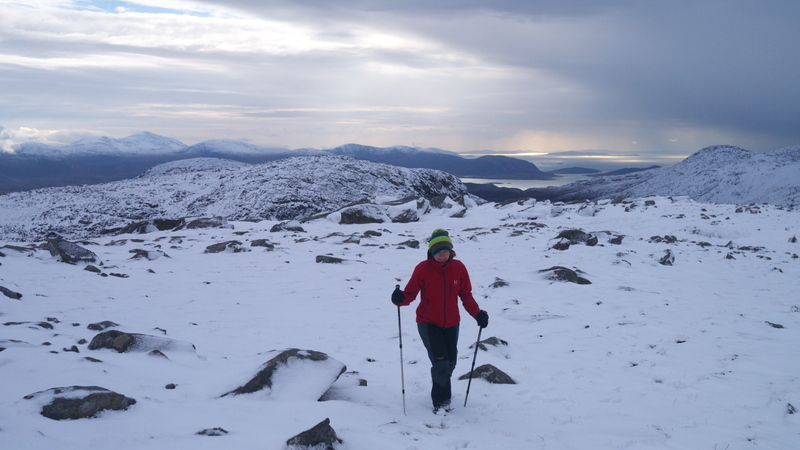 We had a few walks in mind and aimed to fit some or all of them in around the proclivities of winter weather in the Outer Hebrides. 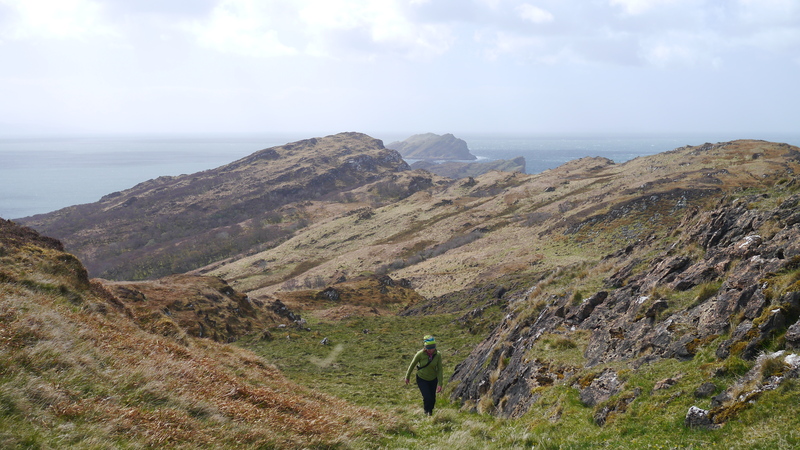 Top of my own list was a walk taking in those of the Uig Hills on the eastern side of Gleann Raonasgail. 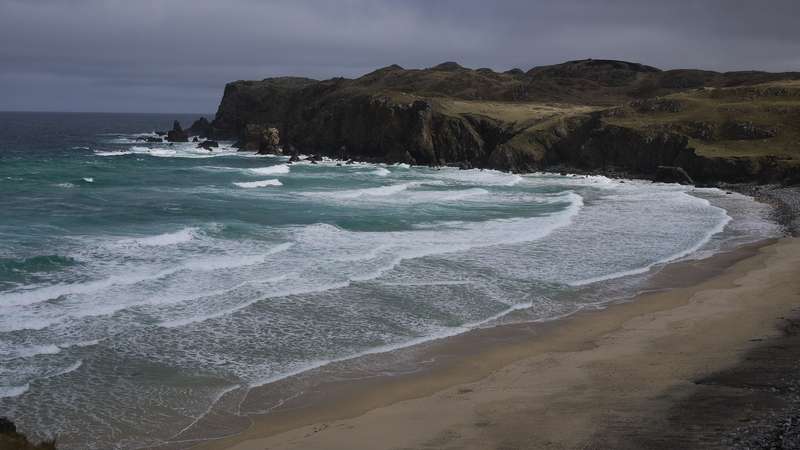 The weather was fine and very ‘fresh’ the day after we arrived and it was spent bimbling around several of the many gorgeous beaches adorning the coastline of the Uig region in the south-east of Lewis. We enjoyed grand views of the Uig Hills in beautiful afternoon light, their splendid forms enticing myself and TLF with their ‘come hither’ look. The forecast for the following day was for cloud cover clearing from the south-west through the morning. This sounded good enough to us, so the following morning we set off early, driving the few miles from Bhaltos, where we were staying, to the start of the long, metalled track that winds its serpentine way up through Gleann Raonasgail. To our delight, it seemed that the hills had received a significant dump of snow during the night, what joy! However, as we approached a thick blanket of clag was beginning to descend, smothering the pristine whiteness in a mantel of deepest grey. Boo. 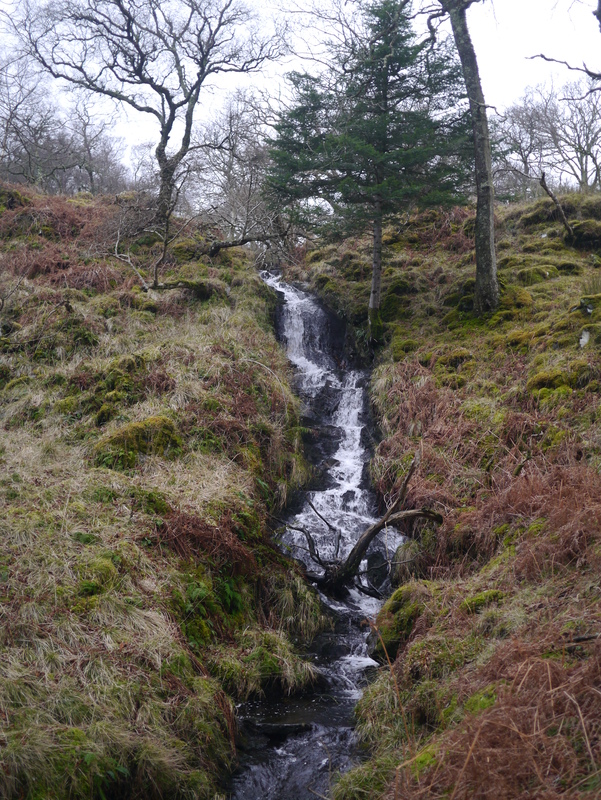 Anyway, as we progressed up the glen at length, we were feeling that the clag looked settled in. By the time we reached the bealach we decided to climb to the summit of Tamnasbhal at the southern end of the ridge and then just return back along the dreary track; there was little point in battling north along the rugged ridge in the murk, besides, the terrain is very complex, which might pose problems in poor visibility. We launched directly up to the bealach at Braigh Buidhe and thence along the north-west ridge to the cairn-marked summit. 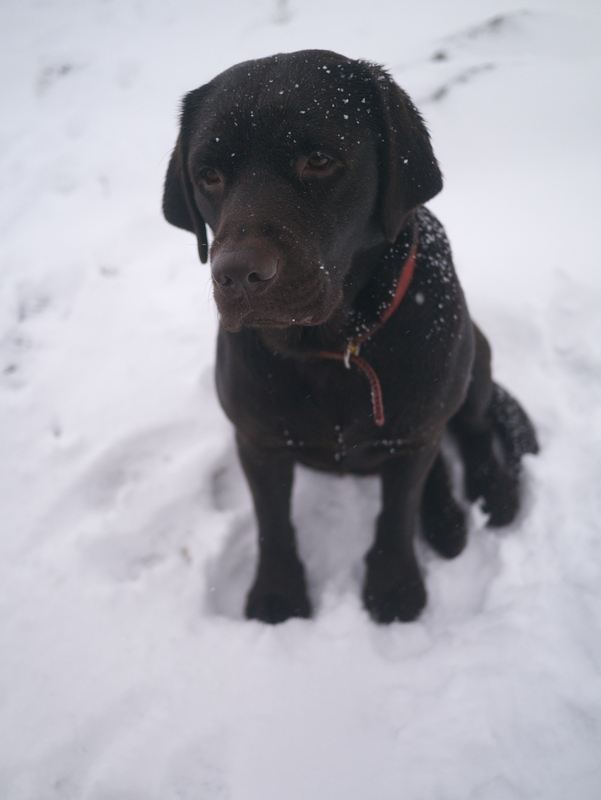 Could hardly see a sausage, but at least we could enjoy walking on squeaky new snow. 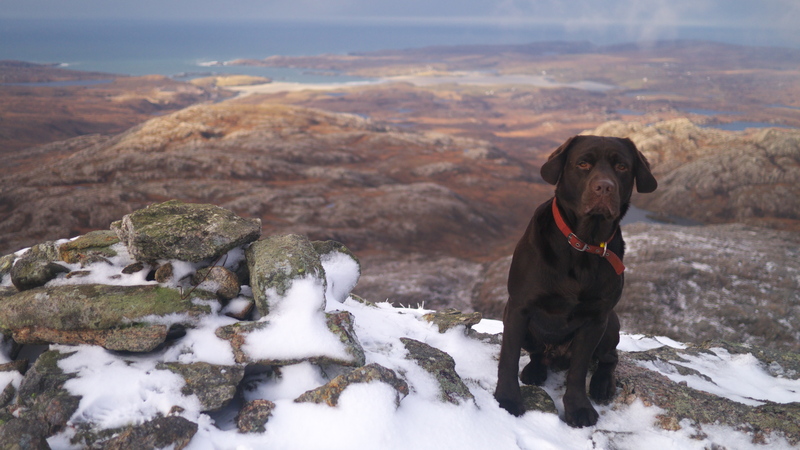 At the top we dug out our sarnies and Dougal struck his best ‘good boy’ posture in expectation rather than hope, which was not misplaced. 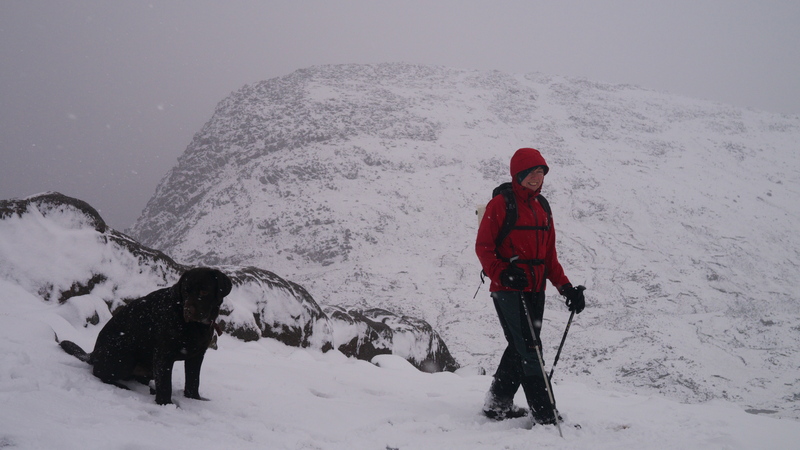 It had begun to snow again and we were enjoying being out on the hills, visibility or not. 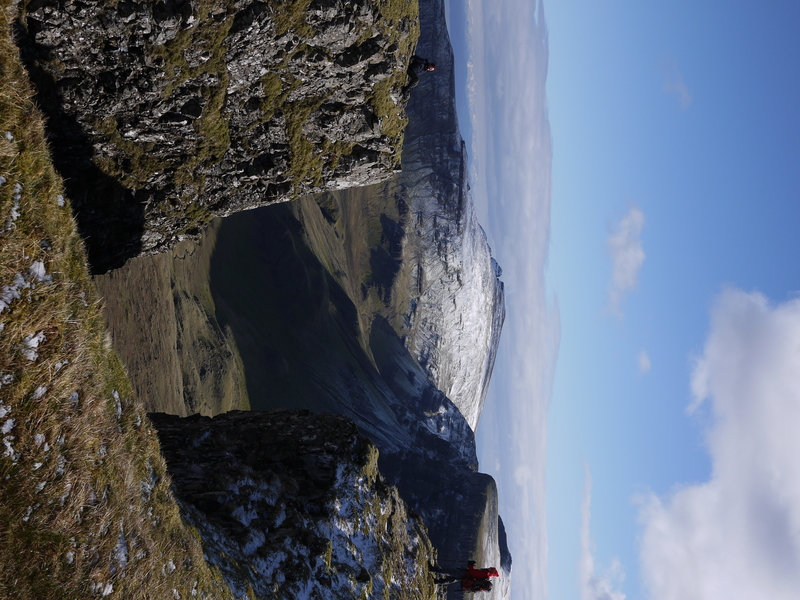 We might as well climb Teinneasabhal after returning to the bealach, no? 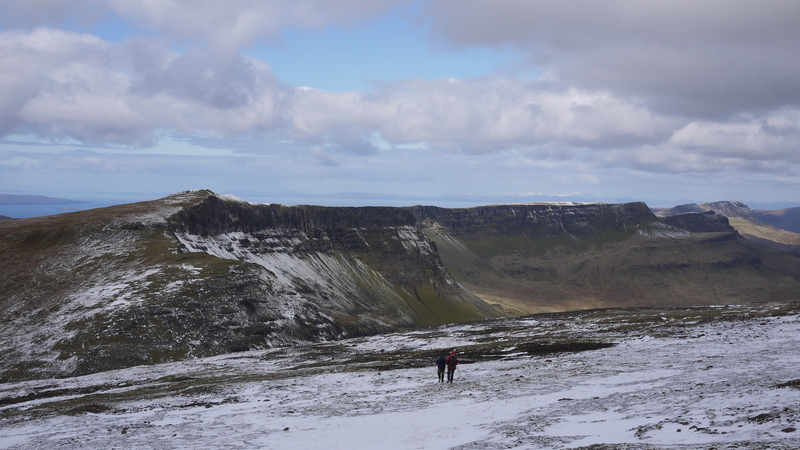 So, we retraced our steps to Braigh Buidhe and began the climb north-east along the ridge. 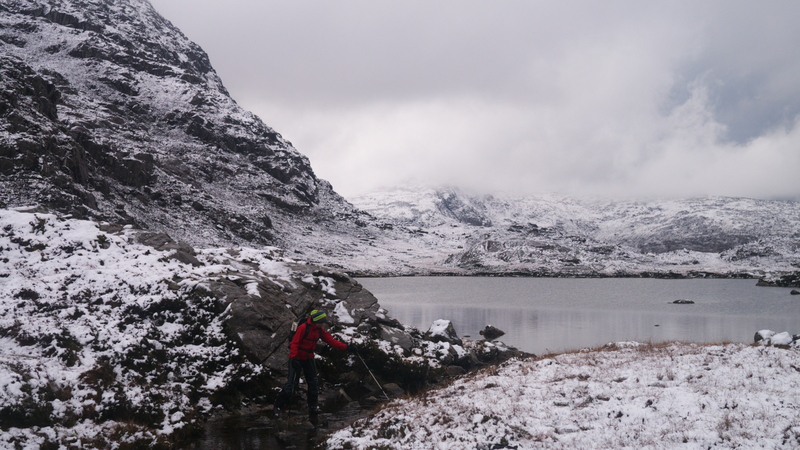 The terrain is rugged and complex, requiring a bit of attention on the route finding front as the snow teemed down. To the south, the clag lifted a little from Tamnasbhal giving us glimpses of the hill we’d just climbed. Perhaps it might continue to clear after all? 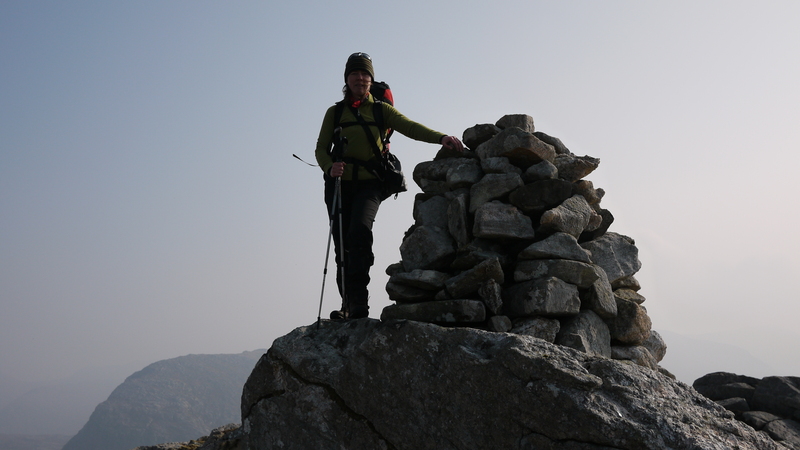 We continued to the summit, which is furnished with a cairn of pink and grey granite rocks. Looming to the north was the steep southern flank of Tathabhal – at 515m, the highest of the hills on this side of the Gleann – we could see it, so surely we should climb it? 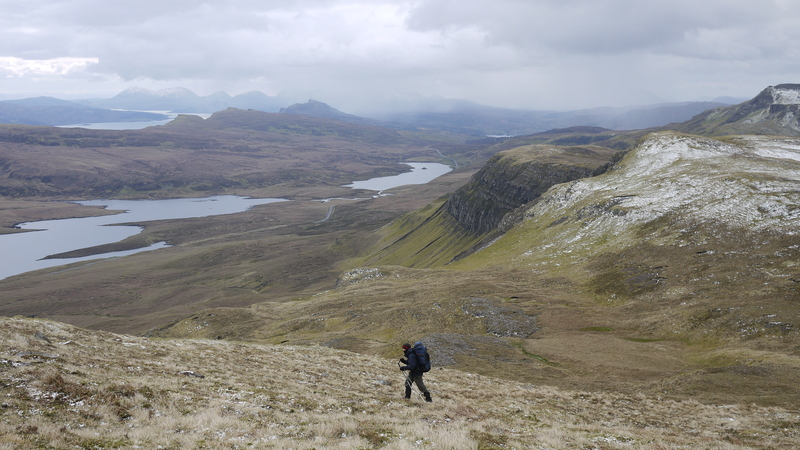 The northern flank of Teinneasabhal is steep and craggy, so we descended to the north-east before swinging back to the north west to reach the lochan-dotted bealach. 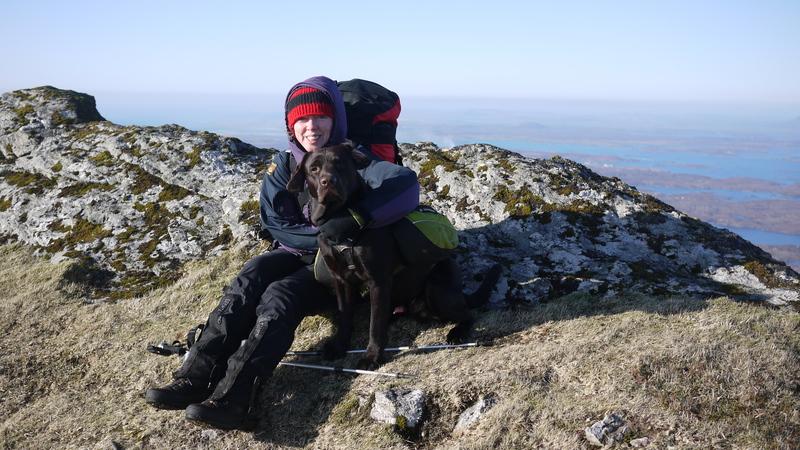 In truth it was quite tricky and we had to lift Dougal down a rocky outcrop en route – when lifting a reluctant 35-kilo Labrador from near head height, make sure that you have very firm footing! 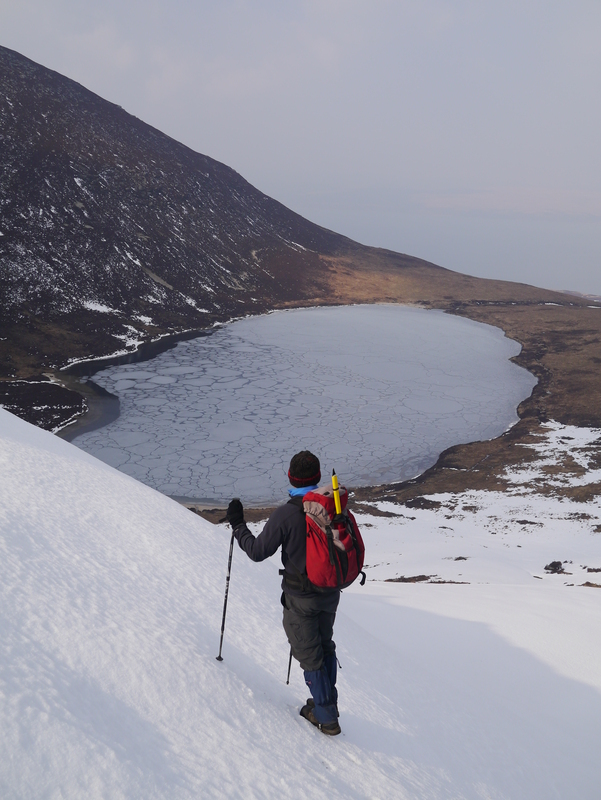 We crossed the outflow of the largest lochan and then began the steep climb up the flank of Tathabhal. A shallow, grassy gully made the going much easier through the rock-strewn terrain. As we approached the summit, we knew our luck was really in; the cloud really was lifting from the south-west and the views opened up to glorious effect. 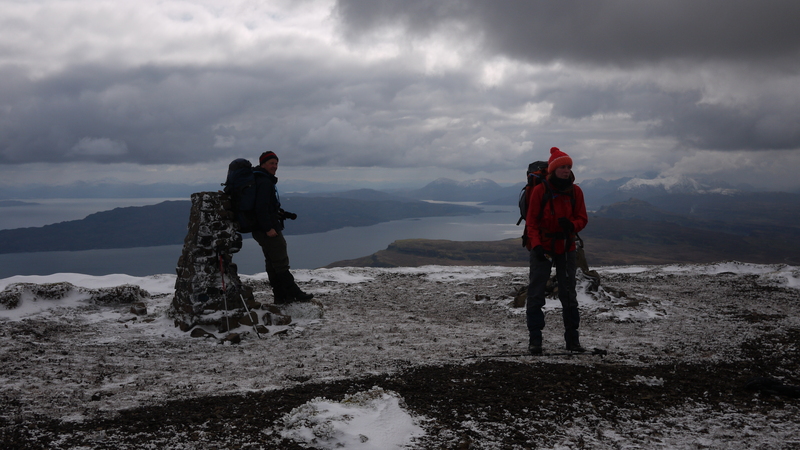 We stayed a while on the summit, drinking in the wondrous views until it was just too bloody cold to stay any longer. 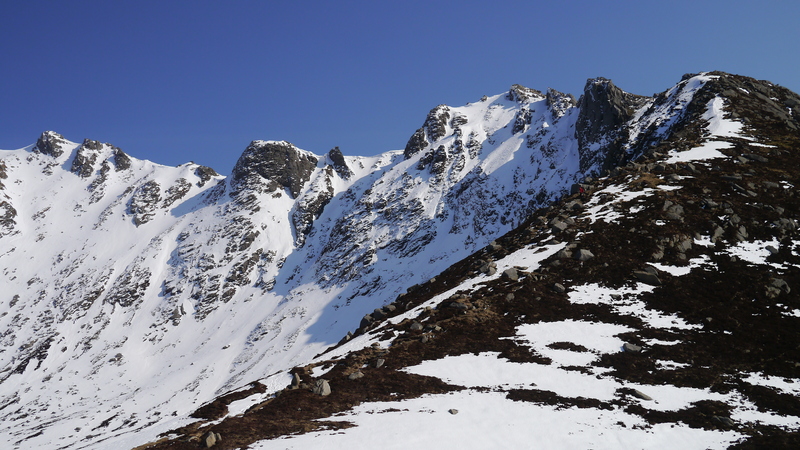 Again we descended to the north-east to avoid the steep, craggy southern flank of Tathabhal. The snow and the low winter light made Tarain – the summit to our north – appear much grander than its modest 400-metre stature. Repeating the familiar pattern, we descended to the north-east before crossing the bealach and climbing along a broad gully before reaching the summit. For the last time we descended to the north-east before swinging north-west to arrive at a lochan beneath Cleite Adhamh. From here we parted company with the diminishing ridge, descending along the Allt Uamh Mhircil then crossing the Abhainn Caslabhat, flowing north from Loch Raonasgail. Having crossed the burn we rejoined the boring track, which seemed much longer on the way out, still, better than no track at all! 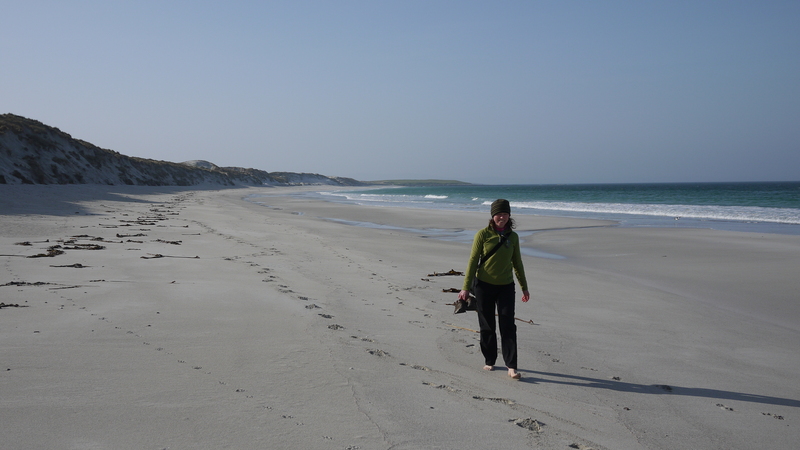 We enjoyed a couple more walks during our stay and lots of visits to the magnificent mile-long, silver strand of Reef Sands, just a short way from our cottage. Has anyone ever seen a dog adopt such a bizarre crouching posture in anticipation of a ball being wellied? 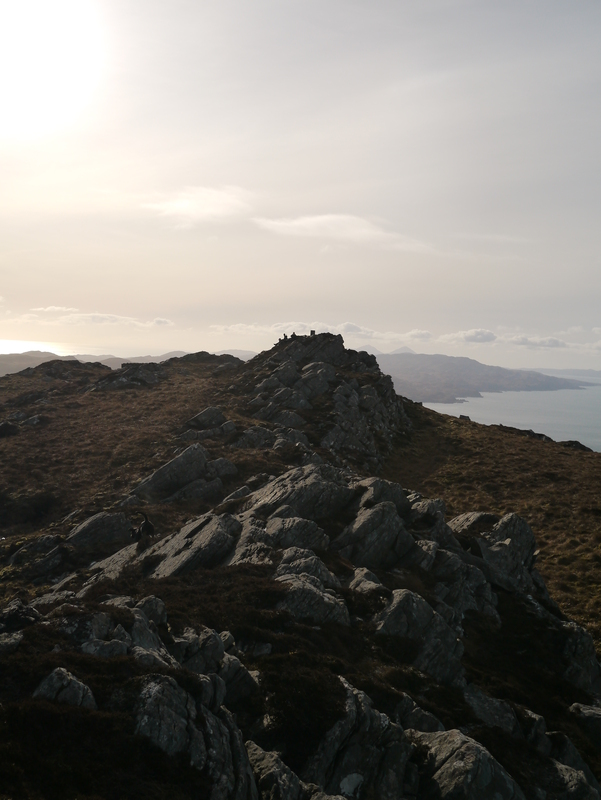 The small Hebridean isle of Scarba measures a mere 5km east to west by 4.5km south to north, its highest point is the summit of Cruach Scarba at 449 metres. 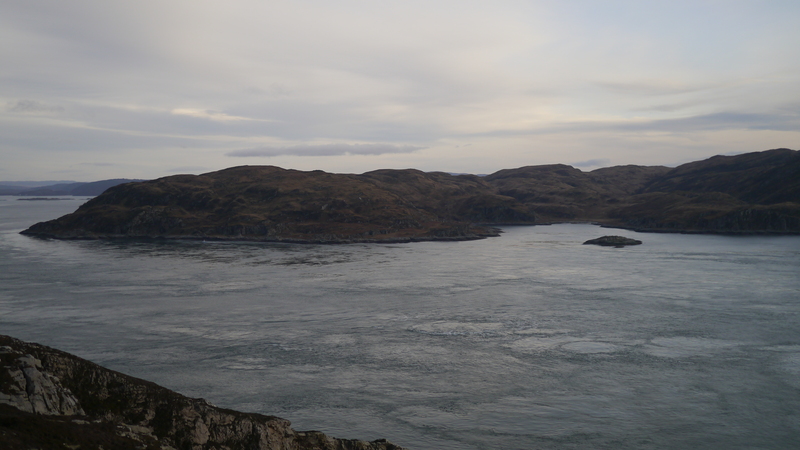 The island lies barely a kilometre to the north of Jura across the Gulf of Corryvreckan, which is home to the northern hemisphere’s second largest whirlpool after Norway’s Maelstrom. 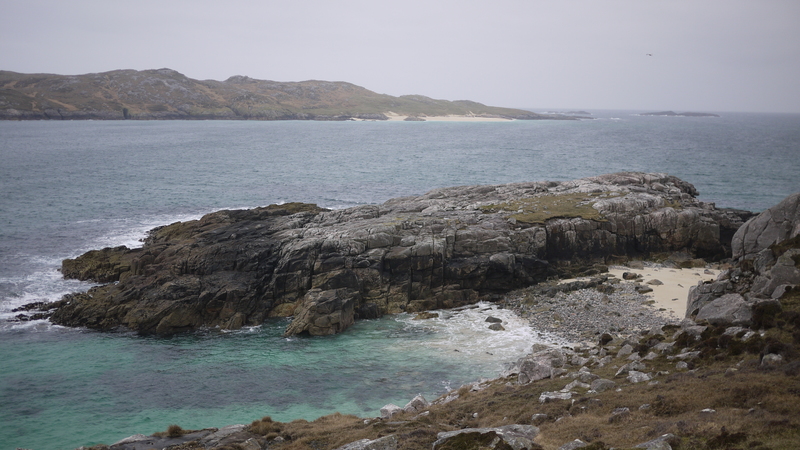 For good measure, the island is separated from Lunga, it’s northerly neighbour, by one of the most notorious tidal races in the Hebrides – the Bealach a’ Choin Ghlais, the Grey Dog. 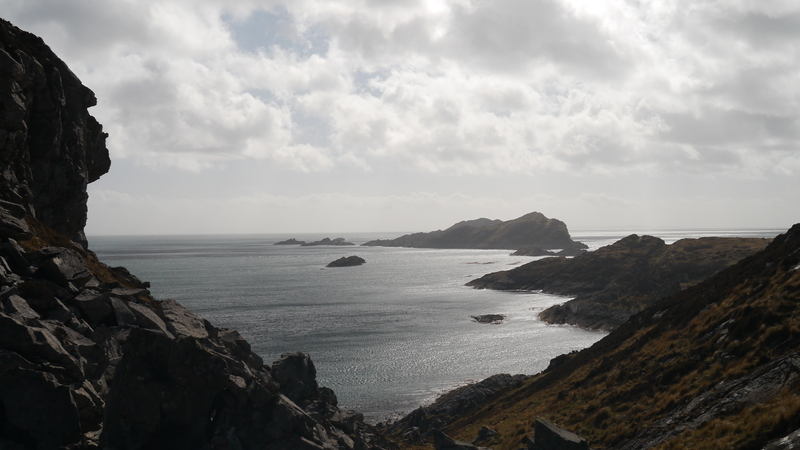 My previous visit to Scarba was just over a year ago; along with TLF and Dougal, we spent a memorable 48 hours on the island having been delivered from the mainland by the estimable Duncan Philips, skipper of the Farsain. 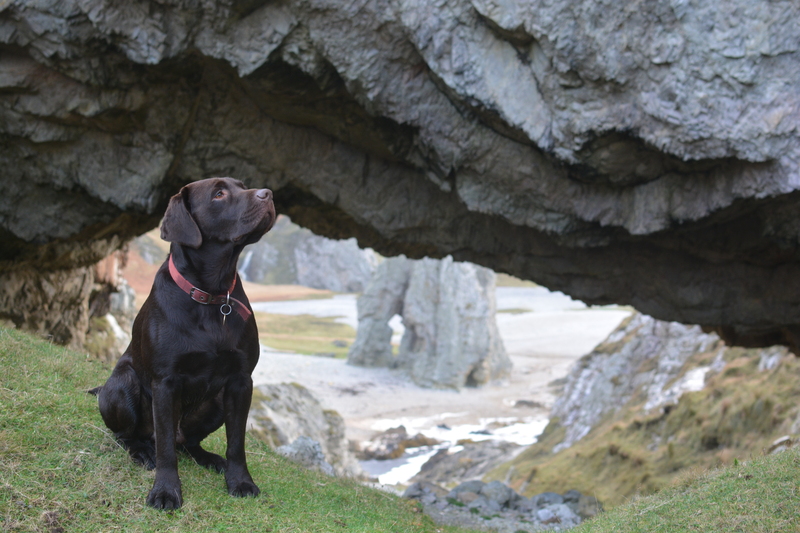 Last weekend, I returned to Scarba in the company of James, Rich and Rob along with Dougal (Labrador) and Reuben (Staffie); the premise for our trip was James’ stag do – Mr Boulter will be marrying Corrina after a 20-year courtship later this month. Having driven from Glasgow in an intermittent downpour, we were delighted to see a break in the clouds as we boarded the Farsain at Croabh Haven. Duncan is some years beyond retirement age, but he seems to have little inclination of calling time on his business of taxiing folk around the waters of the Inner Hebrides. Good job too as there are few people with Duncan’s knowledge of these waters or his capability in handling a small craft in often challenging conditions. Furthermore, Duncan is a real mine of information on island life and he has a deep knowledge of and keen eye for the sea creatures and birds encountered on his patch. 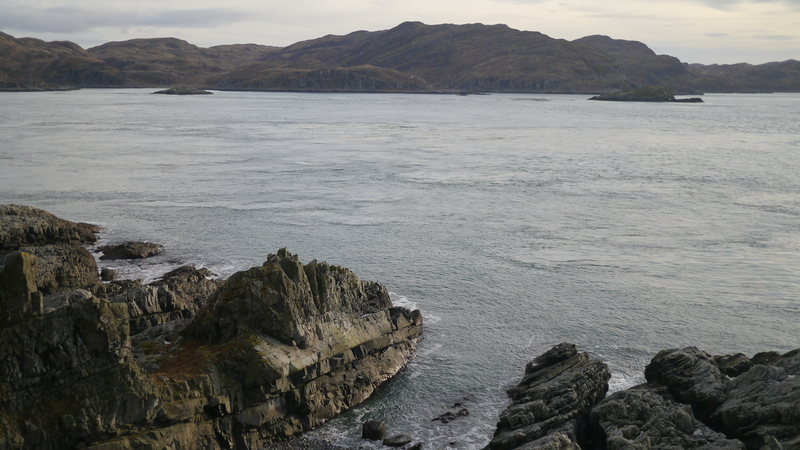 En route to the small jetty below Kilmory, Duncan pointed out the nest of a pair of white-tailed eagles; we trained our binoculars, but no-one was home. Duncan had obviously fallen out of bed the right side that morning as he then took us on a jolly through the Grey Dog. 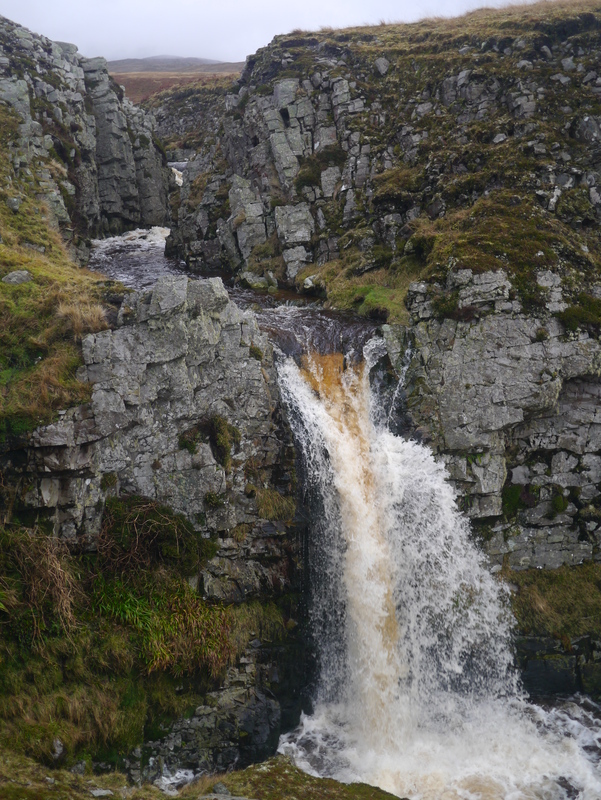 This was really quite exciting and of course the picture below doesn’t capture the sinuous, twisting currents and overfalls racing through the narrow gap. Duncan is adept at throwing the Farsain around such bodies of water like a teenage joyrider executing handbrake turns in a car park; I wouldn’t have wanted to be in the Grey dog with anyone else. Eventually, we made for the jetty; I had to hold firmly onto Dougal as he looked like he was thinking of bailing out and swimming the last few hundred metres. 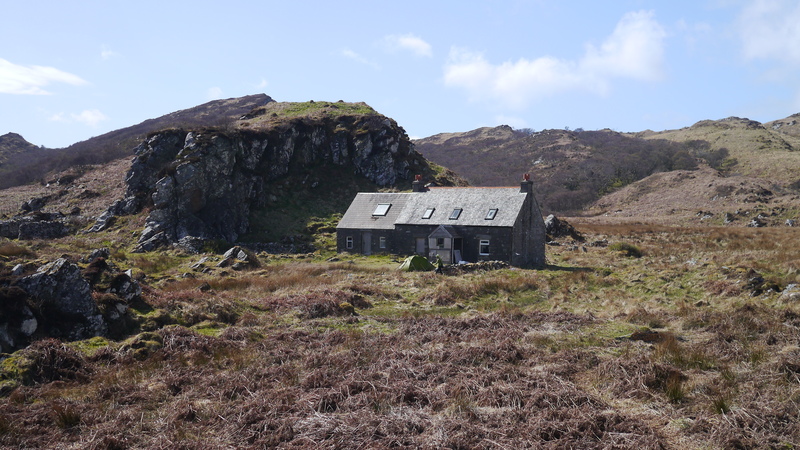 Once ashore we hoisted our extra heavy rucksacks (lots of food, some booze) and walked up along the track, past Kilmory Lodge (mostly used during the stalking season) and thence above the east coast before descending into Gleann a’ Mhaoil to arrive at the bothy. 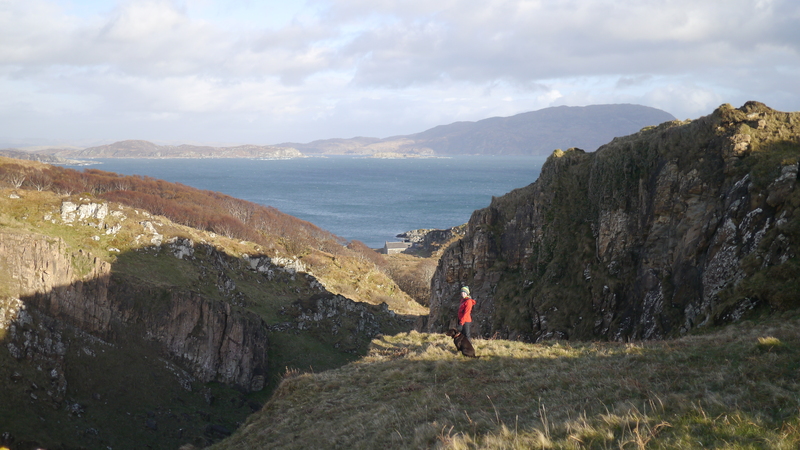 After having a bite to eat then pitching our tents on the only flattish dryish patch of ground near the bothy, we set off for a walk/scramble westwards along the coast, looking onto the Corryvreckan. 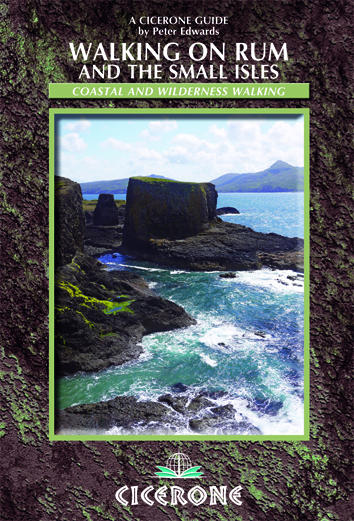 This is a fine coastal landscape adorned with caves, natural arches and basalt dikes. The evening sun further enhanced our outing. 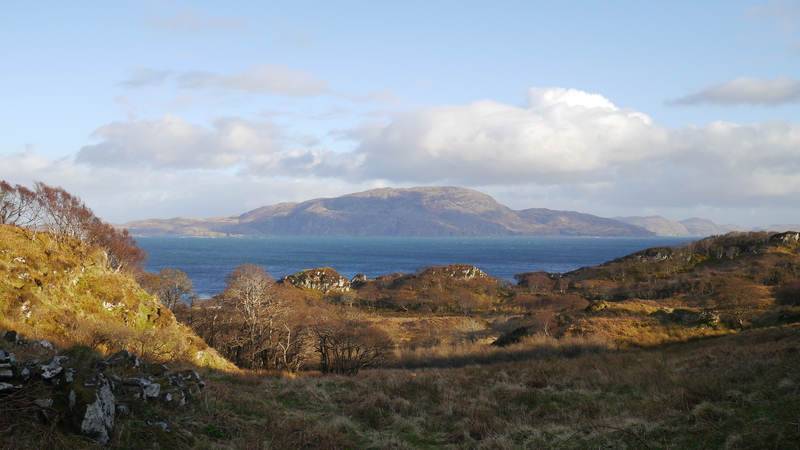 Across the narrow strait, the wild west coast of Jura went about its business. 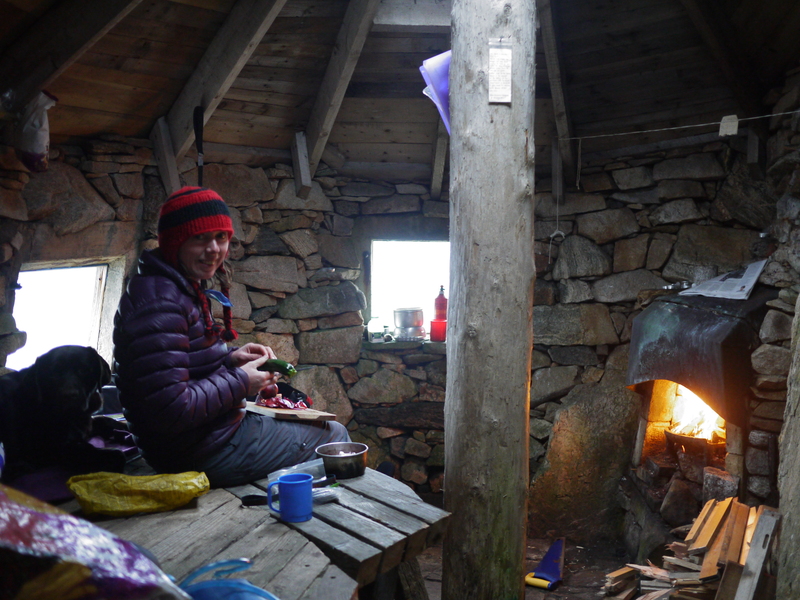 We returned to the bothy to cook dinner, get a fire going and have a wee dram/rum tea, before retiring to our tents. The night sky was clear and enclosed us under a canopy of stars; it was also brass monkeys. In such circumstances a warm Labrador is almost as good as a warm wife. Next morning dawned dry and fine, so we set off reasonably early to climb Cruach Scarba. 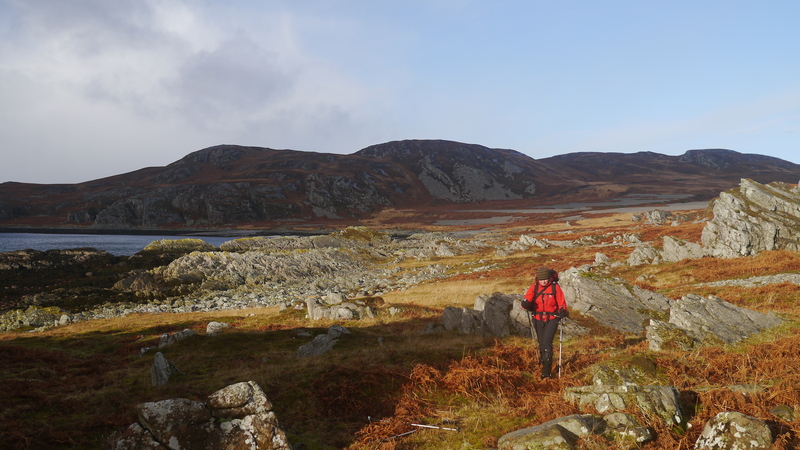 A fairly taxing cross country yomp from the bothy brought us to the head of Loch Airigh a’ Chruidh where we picked up the old pony path which loops around two thirds of the island between 100m-300m. 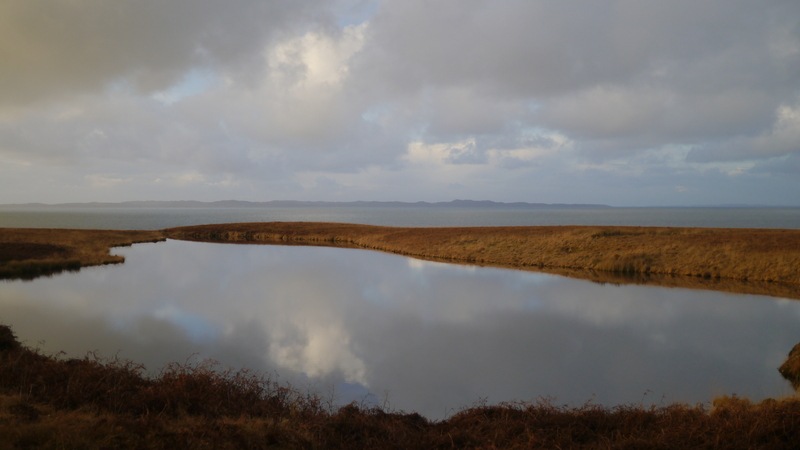 A few hundred metres along the path beyond the outflow of the loch, the view opened up onto the north of Jura. 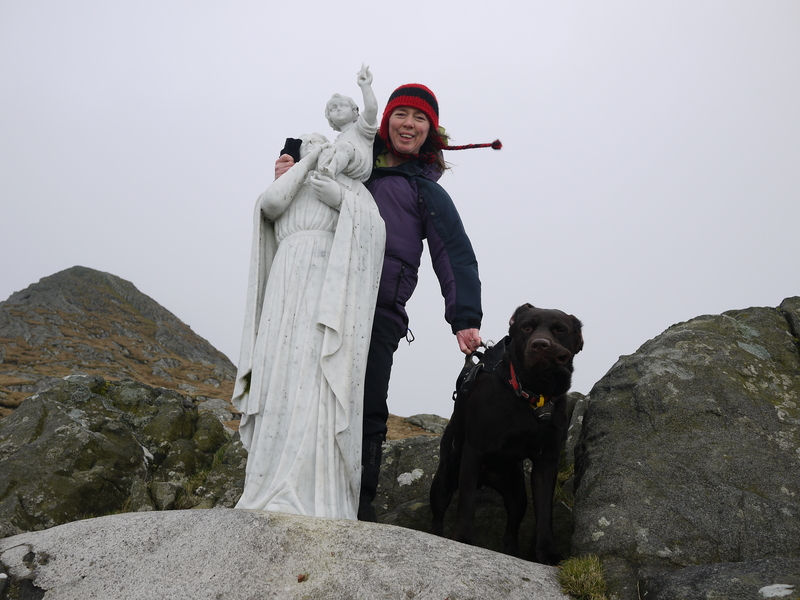 …and then continued more steeply northwards along rocky ridges to gain the summit, which is a Marilyn. This particular Marilyn is furnished with a Vanessa OS triangulation pillar. 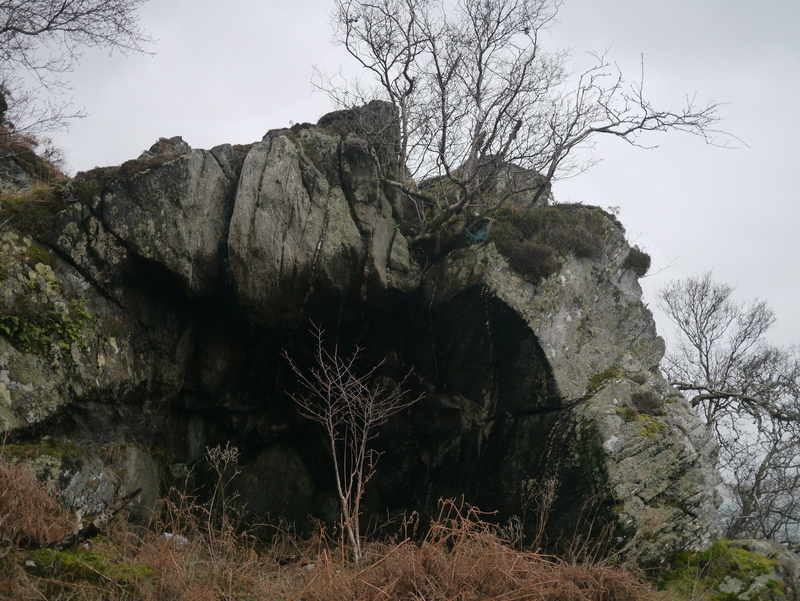 Near the summit, there is a large-ish roofless structure with two dry-stone walls built against a low rock face (sorry no pic); perhaps it was once used as a shelter for man and/or beasts. 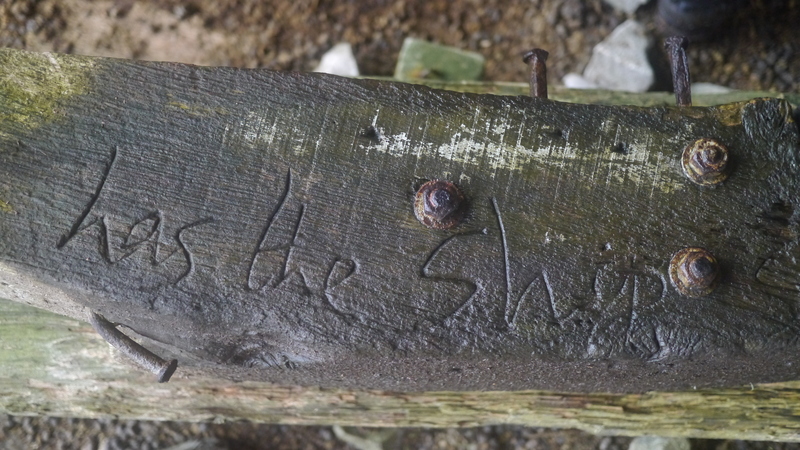 I wondered if the neat graffiti cut into the rock at the summit was left by the shelter’s builders. 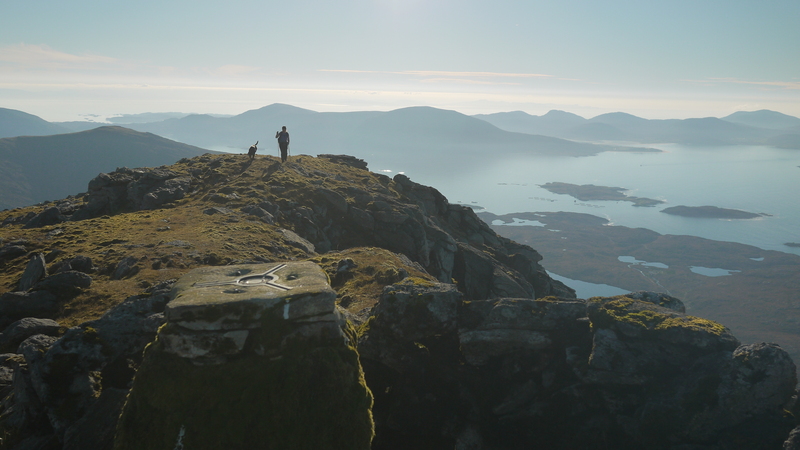 Sitting atop the summit, we ate our sandwiches and enjoyed the spectacle of three golden eagles and a solitary white-tailed eagle circling lazily to the north-west with the Garvellachs and Mull as a backdrop. Lunch over, we split into two parties; Rob, James and Reuben would descend to the north then continue back round to the bothy on the track, while myself, Rich and Dougal would attempt to descend to the west coast to see if it would then be possible to return to the bothy following the coastline around to the south along the Gulf of Corryvreckan. 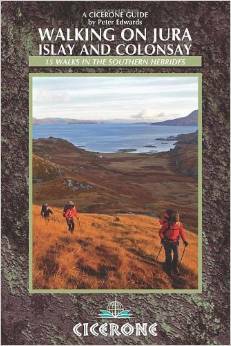 We retraced our steps to the bealach and then descended steeply west across marshy and heather-clad ground. 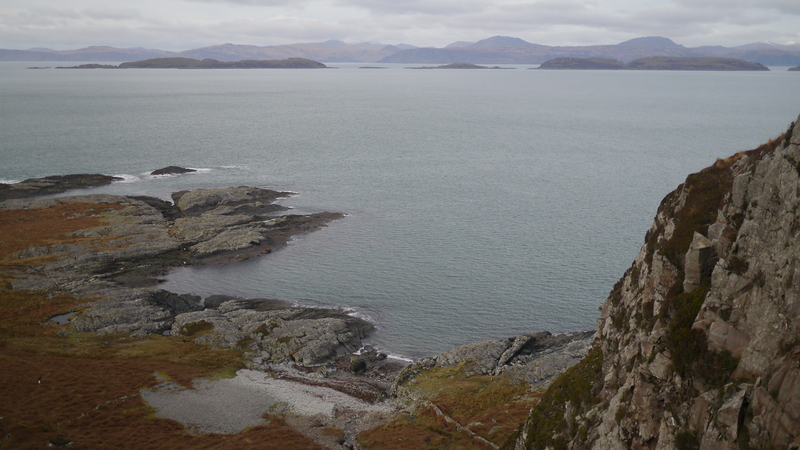 After reaching a small plateau we descended again and came to the edge of an impressive steep-sided gorge; there were grand views north-west onto the Garvellachs and Mull. It looked like it would be possible to descend to the coast alongside the gorge and so it proved, but it was a little hairy. 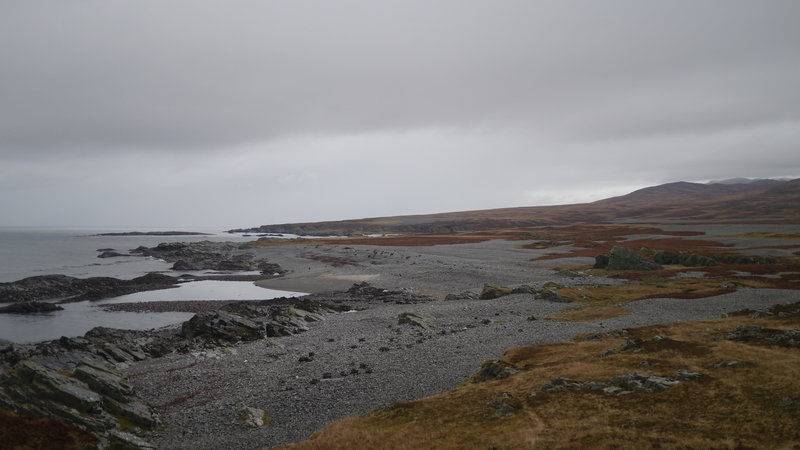 I was a little elated at the prospect of tackling a new piece of Hebridean coastline; would we be able to get around to the bothy along the shore or would the terrain force us back up to higher ground? Arriving on the rock platform beneath the west coast’s cliffs, this small island presented us with a landscape too grand in scale to capture in a single image. 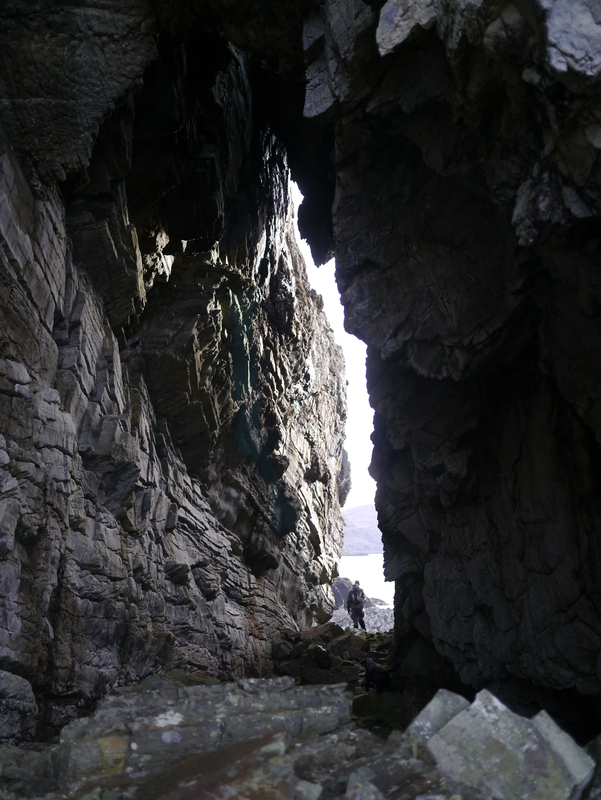 Initially, our progress southwards was relatively easy along the raised shore platform beneath the glacial cliffs, however, we were soon scrambling along narrow ledges between oblique shelves of rock. 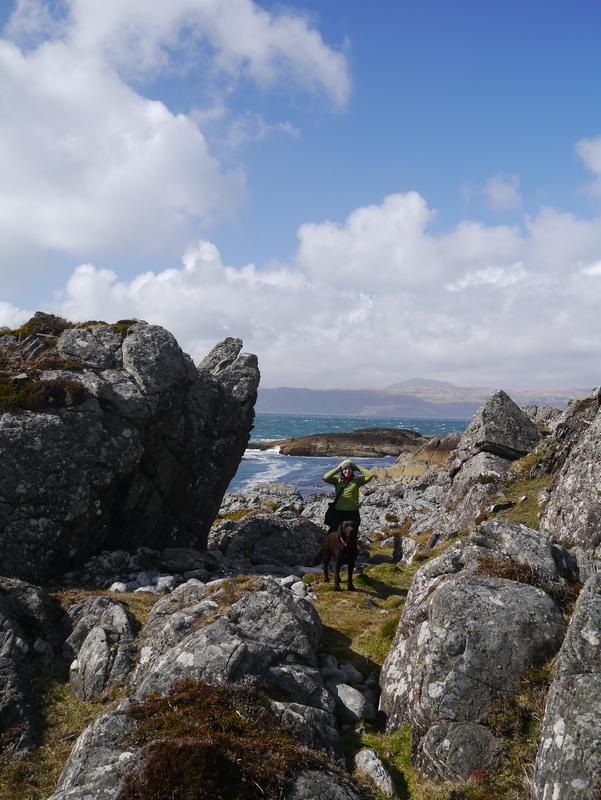 As we turned the corner, so to speak, to gain Scarba’s south coast, we scrambled over a field of boulders before reaching another broad section of raised shore platform where the going became somewhat easier. Briefly. 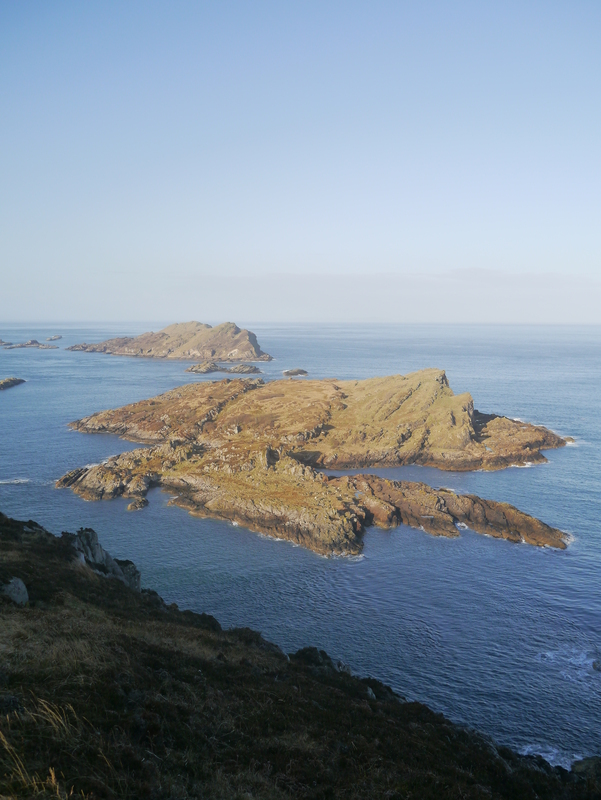 It was now 3pm; we had a good two and a half hours daylight to tackle the remaining 5km of coastline back to Bagh Gleann a’Mhaoil and the bothy. 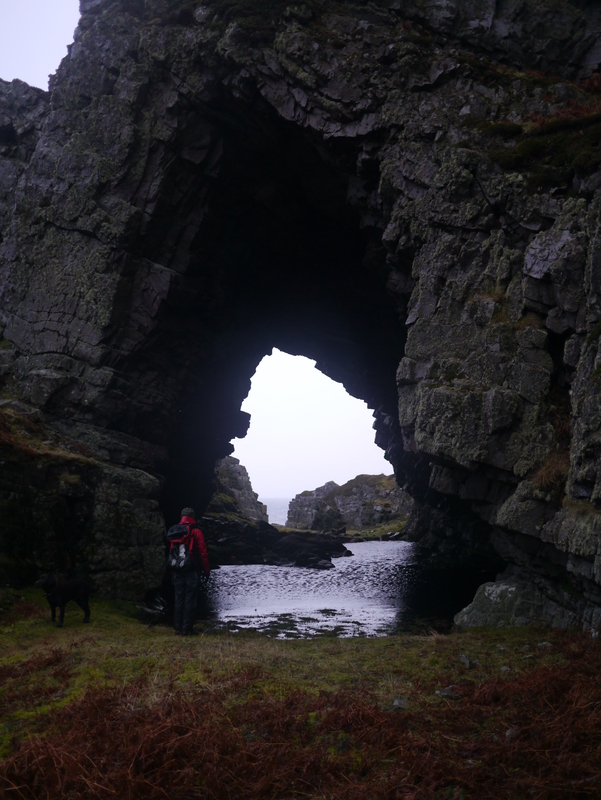 A fabulous natural arch seemed to be a portal providing access to the Gulf of Corryvreckan. 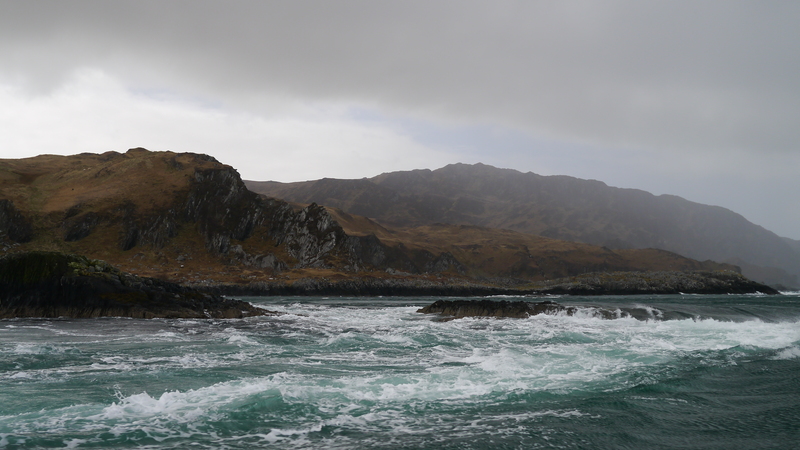 The views opened up across the narrow strait to the rugged west coast of Jura; offshore the catalysed currents of the Corryvreckan – Breacan’s Cauldron – roiled around the submarine pinnacle known as the Caillach – or Hag . 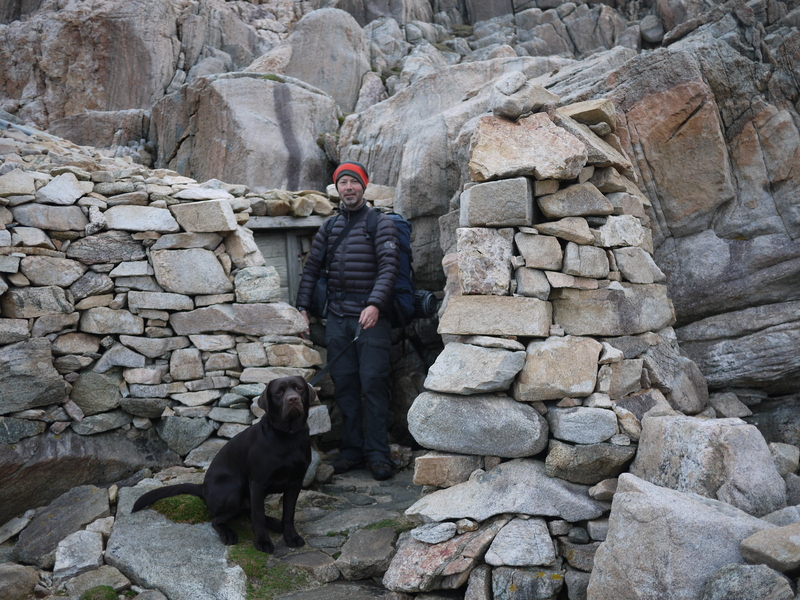 There now began a pattern where we would scramble over obliquely shelved rocks into a bay then clamber along narrow rock ledges before hauling ourselves – and a 35kg Labrador – up through gaps or chimneys in huge dikes walling-in the next bay. It has to be said that this was mostly very entertaining, but we soon realised that our progress along the coast was very slow. 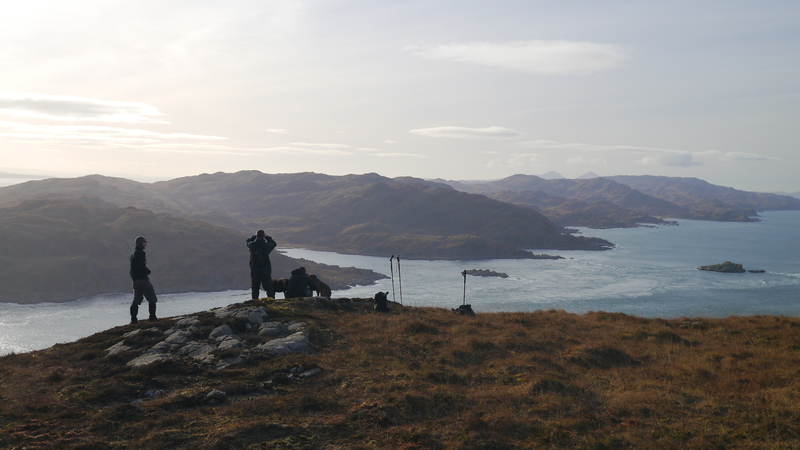 Judging by our position in relation to Eilean Mor off Jura’s north coast, we still had a long way to go. 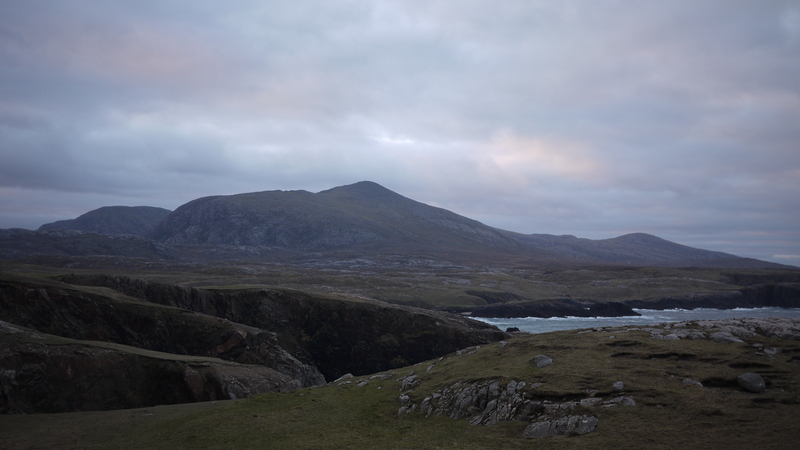 I began to wonder if we would in fact make it around to the bothy in daylight; a waxing quarter moon and gathering clouds meant we’d likely struggle to see our way on the difficult terrain in the dark. 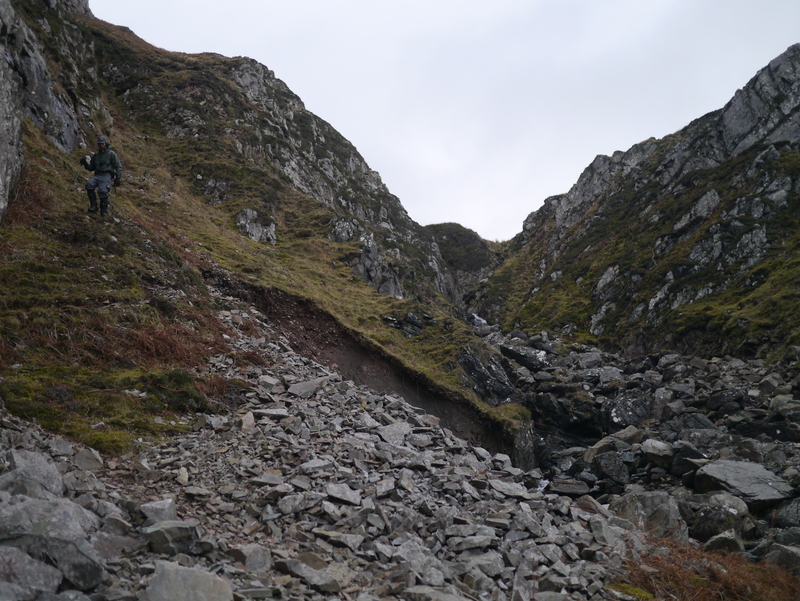 Eventually we reached a dike that we may have been able to scramble over from a narrow ledge maybe 10 metres above the large-pebbled bay, but there was no way we were going to heave Dougal over the same; a slip and it would be a helicopter back to Glasgow. Furthermore, we couldn’t know if we’d be able to descend the other side. Our decision made for us, we climbed steeply to higher ground. At around 100m we found a deer path that contoured nicely along and afforded us fine views. My phone rang: it was Duncan warning us that the weather was going to deteriorate from the following afternoon; he could still pick us up Monday as planned, but we were in for gale force winds on Sunday night and he thought we might want to bale out. 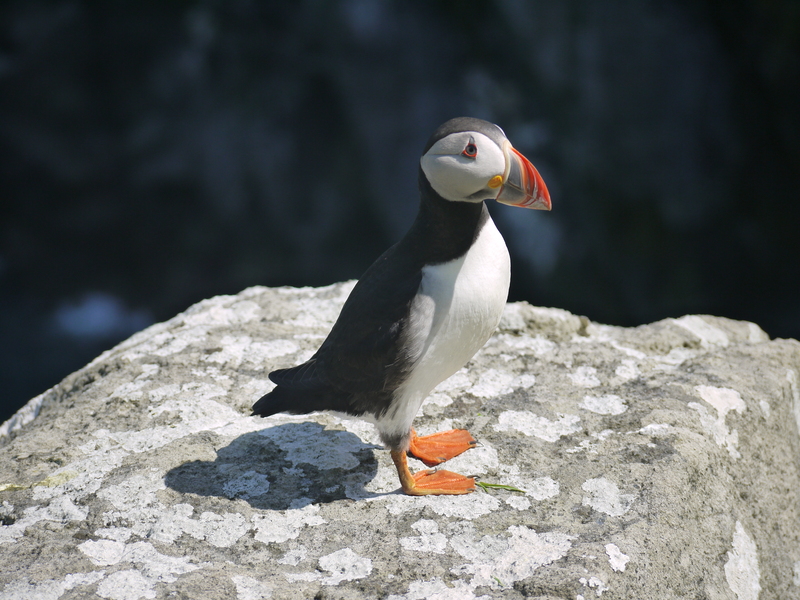 It turns out he’d been down the Corryvreckan that morning and had seen our tents perched above the shore – he obviously didn’t fancy our chances! Progress was good along the higher ground so when we looked down to a large bay that seemed familiar from the previous afternoon’s sortie, we decided to descend steeply back to the shore. It soon became apparent that we weren’t where we thought we were but, hey-ho, we carried on regardless, resuming the pattern of scrambling and clambering once again. Progress was slow and time was running out; the light had begun to fade and I began to feel a wee bit concerned. Helpfully, Rich was very pragmatic about our situation; there’s nothing like a nervous companion to increase your own anxiety. 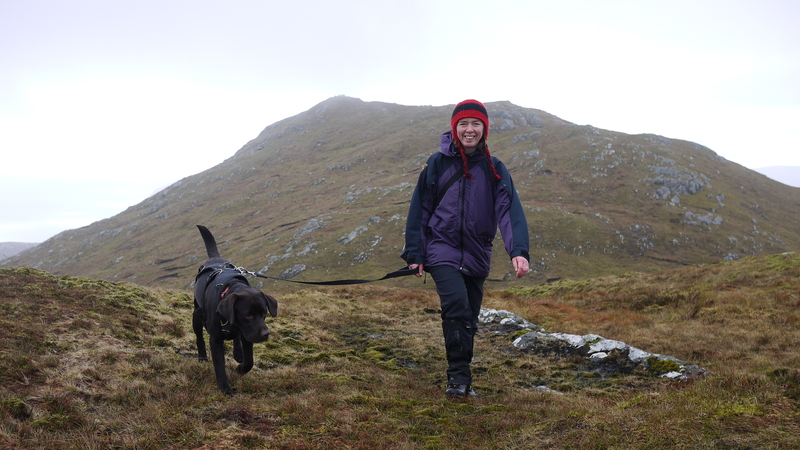 Dougal, however, was tiring and I felt a bit bad about having hauled the poor mite over rugged terrain all day. 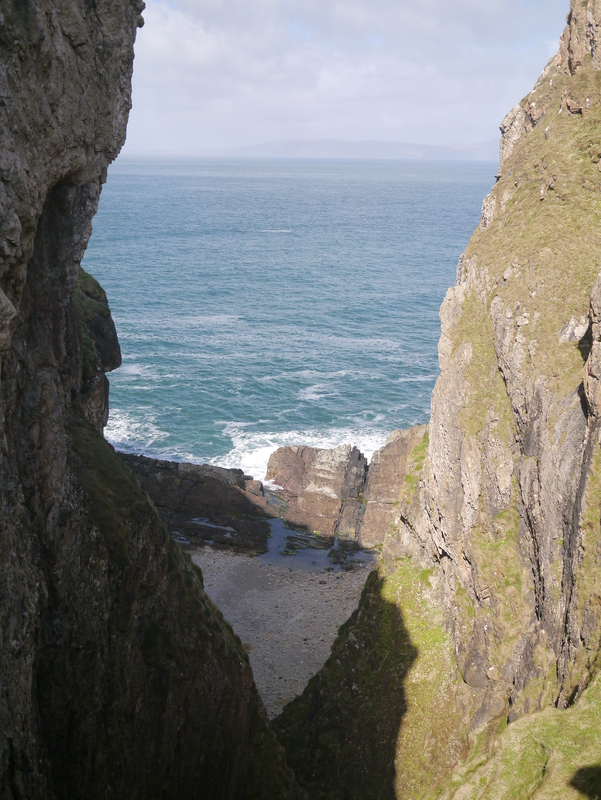 Somewhere in there I slipped and seemed to be about to plummet headlong down a rocky chute into a narrow inlet. Somehow I contrived to swing round and bang into the rocks beside me, clinging on like a good ‘un. We began to see how this could all go wrong. 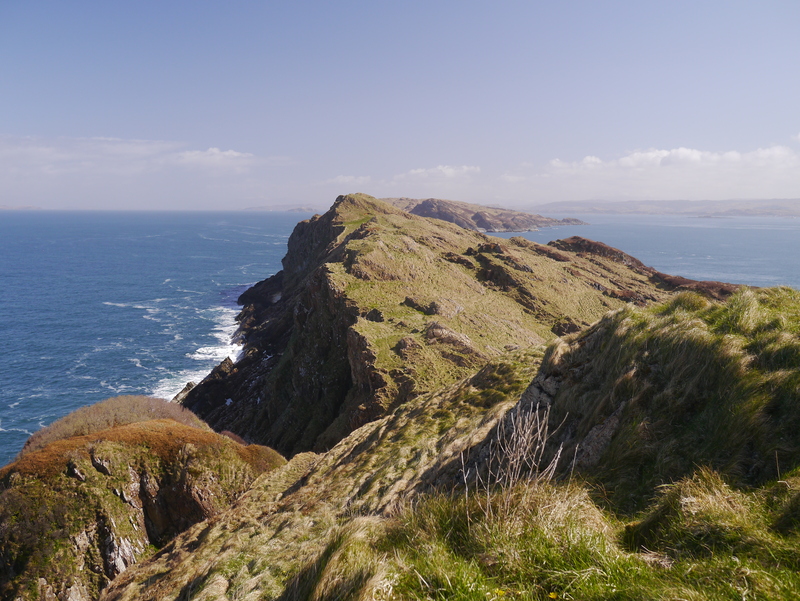 On we soldiered, startling up deer and feral goats along the way – they had every right to be entirely surprised by our presence as I don’t think this stretch of coast gets too many visitors. Still we’d not reached familiar ground; we turned into another bay on the far side of which a huge dike blocked the way. This was a bit dispiriting. In the failing light we could make out a vertical chimney that looked to be around 4 metres high between a ledge and a notch in the dike; could we do it? 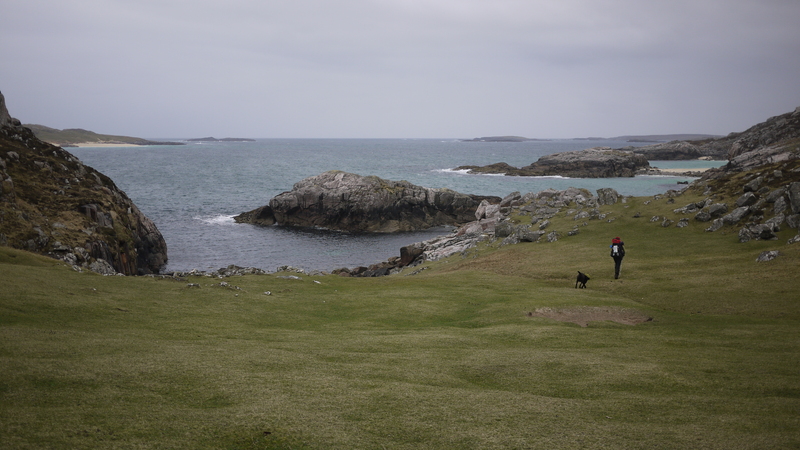 We scurried around the bay and edged along the ledge, coaxing Dougal along. Rich jammed his way up the chimney then hung his arms down to receive Dougal – who’d managed the first 2 metres but was now stuck. I wedged myself beneath the poor dug, pushing him upwards as Rich grasped his collar, and we heaved and hauled him up through the notch. We all stood at the top wagging our tails in relief. 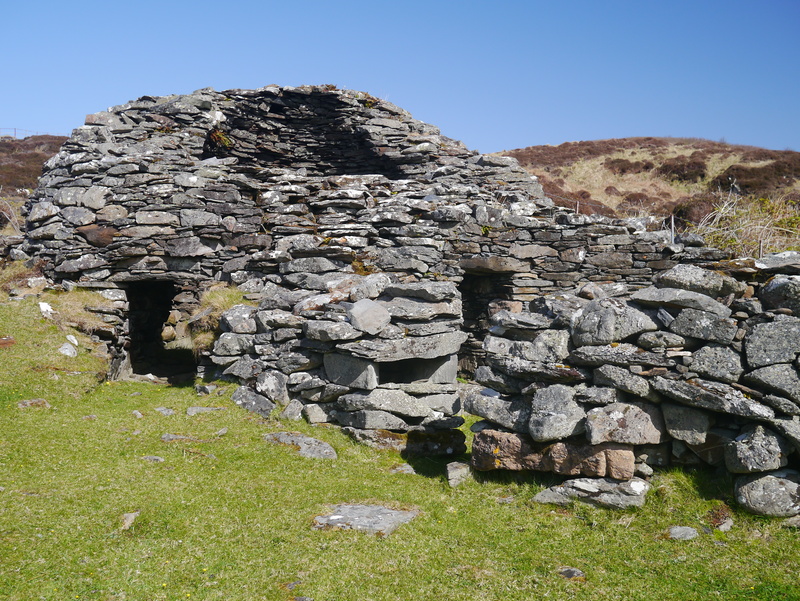 Candle light and wood smoke issued from the bothy as we emerged into Bagh Gleann a’ Mhaoil – a very welcome prospect. Next morning we all managed to wake up without a hangover between us for the second morning in a row – some stag weekend this was proving to be! 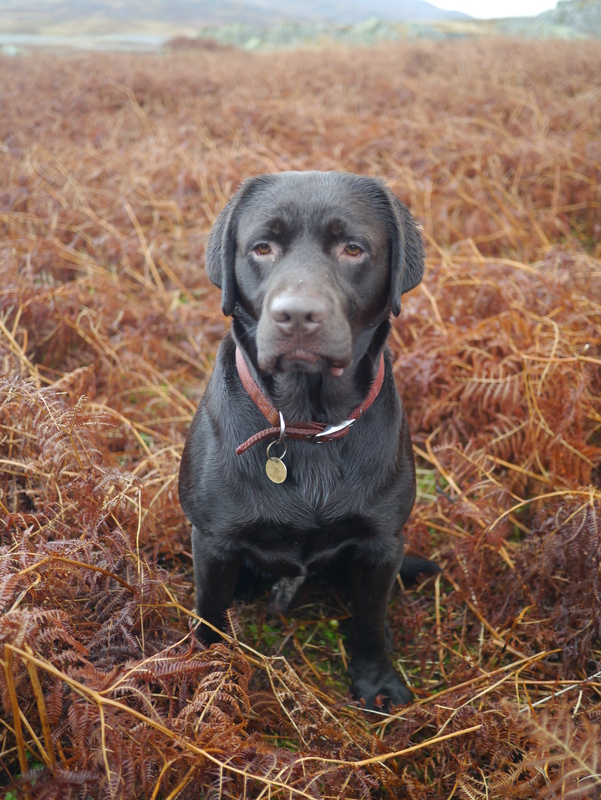 I set off early to walk around the gentler east coast with just Dougal for company. The day was overcast and the route along the eastern shore was unremarkable, though this was fine with us after the previous day’s scrambl-a-thon. 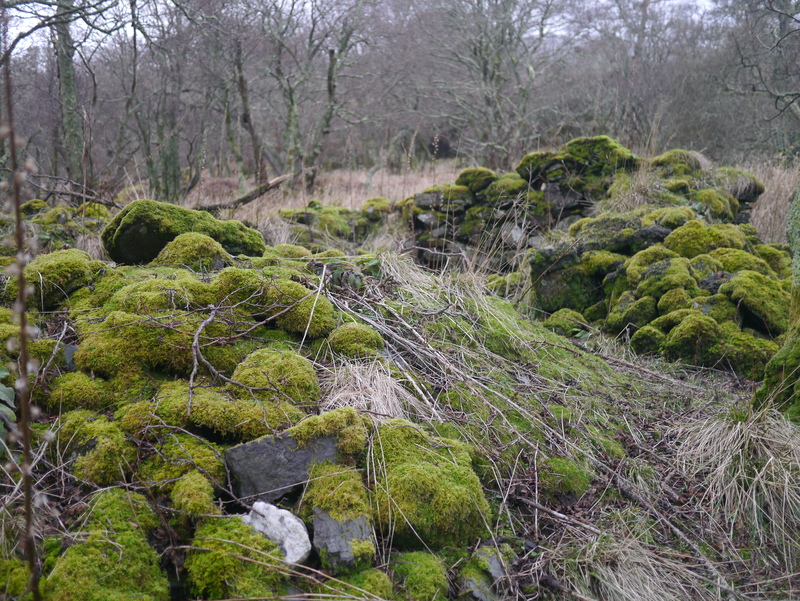 Feral goats and fallow deer scooted off at our approach as we sauntered along, crossing marshy ground and weaving through lichen-festooned birch woods. 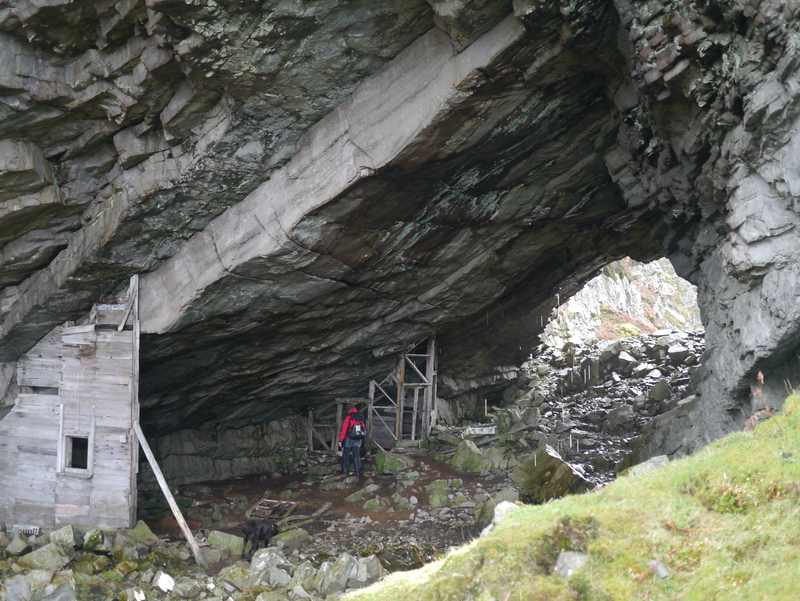 A cave formed from what appeared to be a buckled dike had a rather man-made look about it. We passed through a level area of open ground with a few mature trees and a burn running through; this would make a good campsite. A waterfall added to the charm. We soon found what we’d been looking for: the scant remnants of the ancient chapel of Cille Mhoire an Caibel – the Virgin Mary’s chapel of the burial ground. 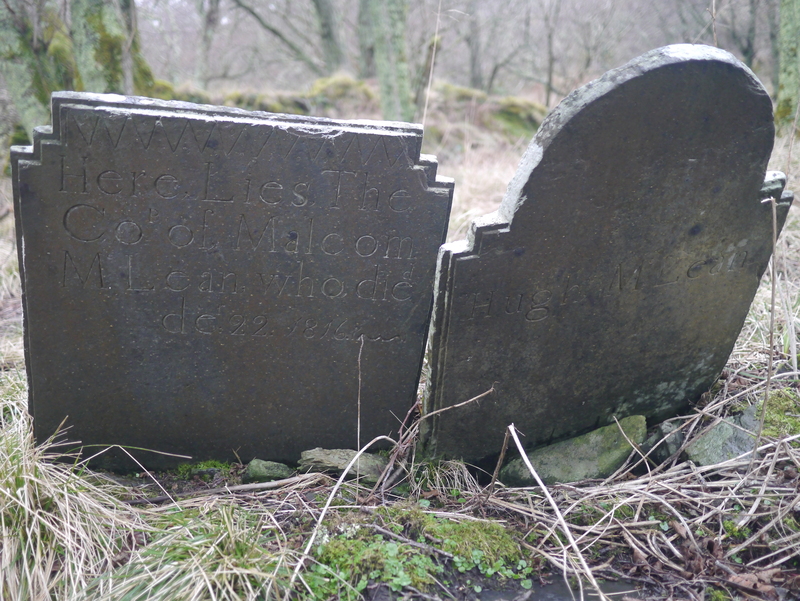 There is indeed a burial ground by the ruins, the few headstones dating from the late 18th and early 19th centuries. 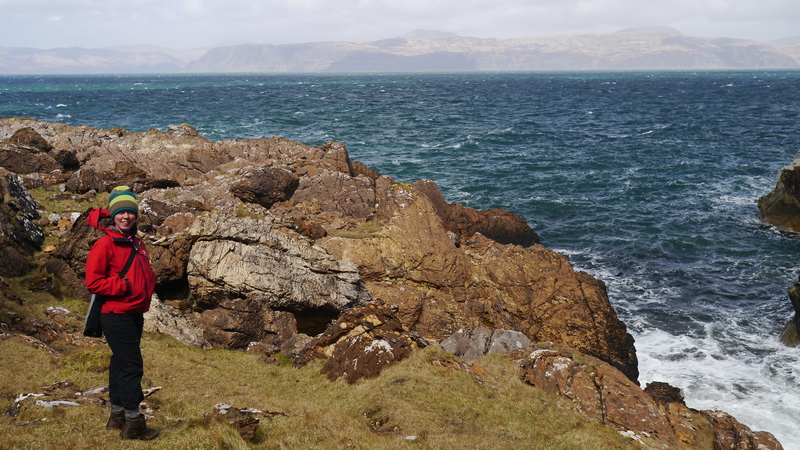 At its peak the population of Scarba amounted to some 14 families around the turn of the 18th and 19th centuries. There are no permanent inhabitants today, which in a way is part of the appeal of visiting such a place. But therein is the price paid for the ‘wild’ places that many of us love to visit these days, to get away from the noise, hassle and stresses of our urban existences. 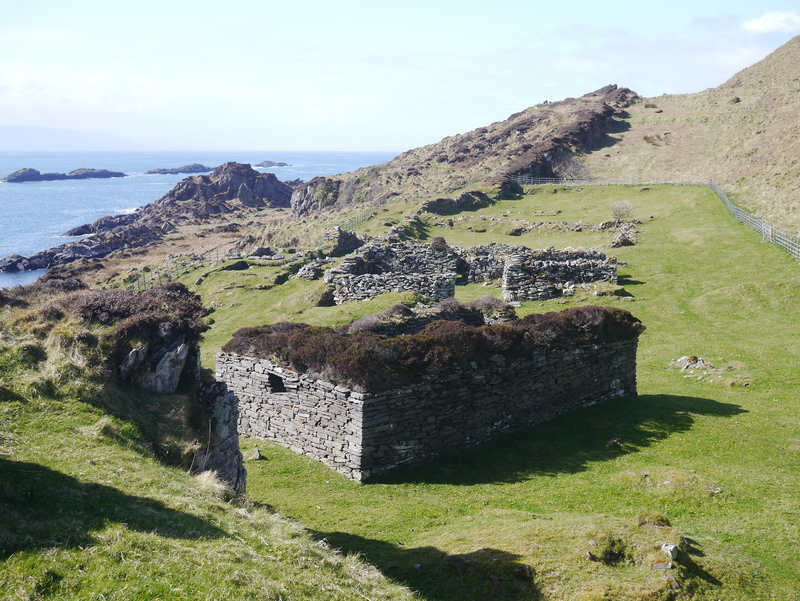 Places such as Scarba were once populated; people went about the business of ekeing a living from the land and sea in many parts of Scotland that are now depopulated – by and large the legacy of the Clearances and industrialisation. I happened to be reading Kathleen Jamie’s excellent book Findings during this trip and in one essay she takes issue with the too-frequent references that are thrown around about Scotland’s ‘wild’ places and ‘wilderness’ – something I do all the time; to do so, she says, is to pay a disservice to the people who once lived and worked on the land, the traces of whose existence are there for us to see should we seek them out. 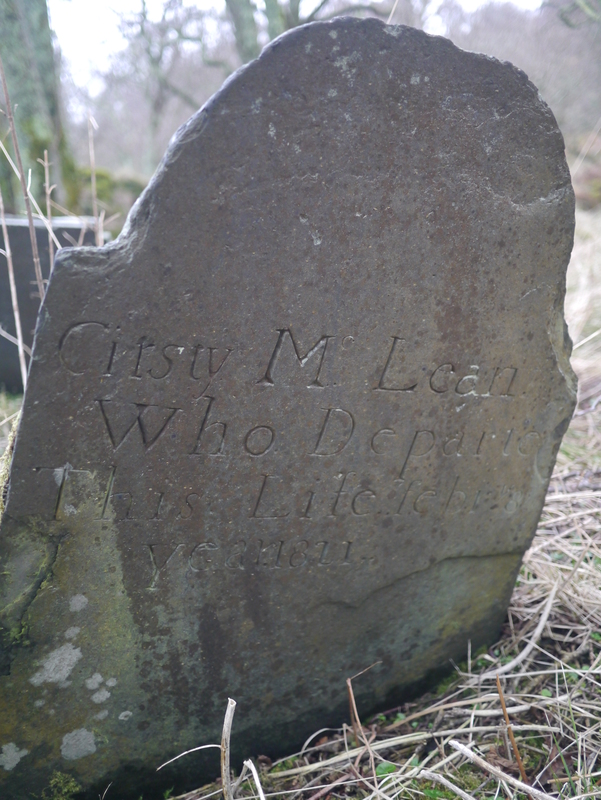 And here they were, the former inhabitants of Scarba interred here in this hidden, seldom-visited burial ground. In the next few days you’ll be able to read far more interesting accounts of this trip written by Jamesand Rich; I’ll update the links once they enter the blogosphere. 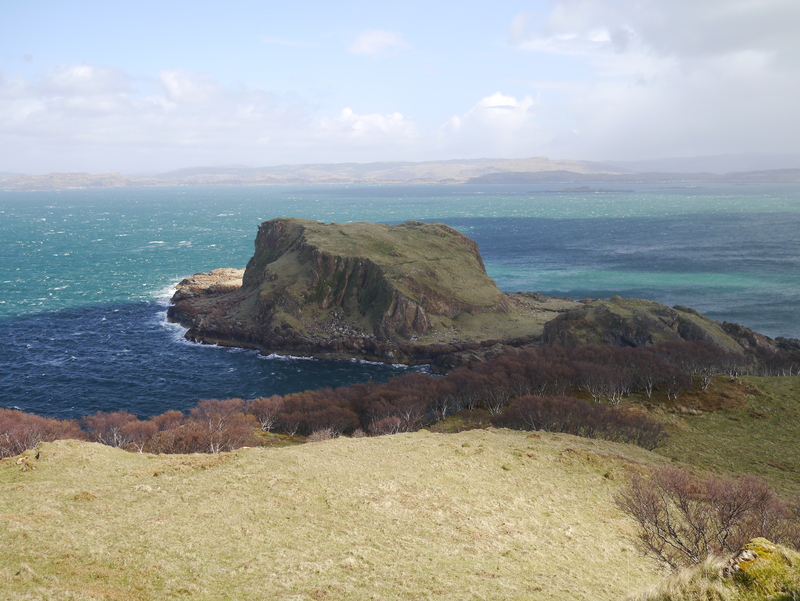 You want to go to Scarba too? There is no ferry link to the island so unless you sail or kayak yourself, private boat charter is the only means of getting to Scarba. 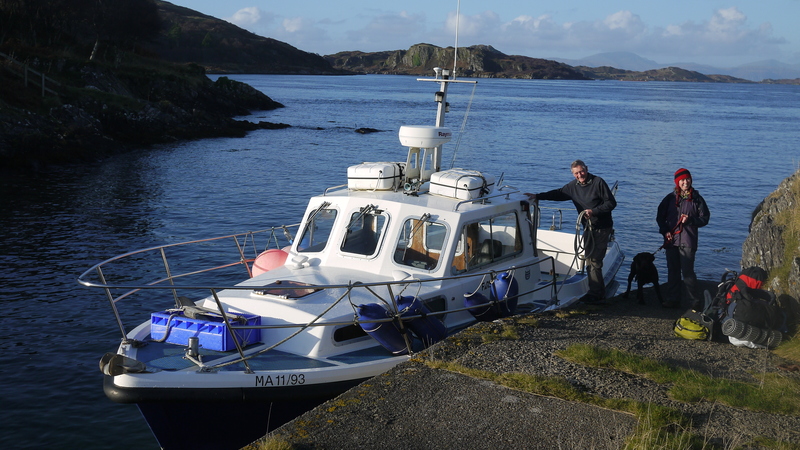 Duncan Philips operates Farsain Cruises out of Craobh Haven Marina, north of Lochgilphead on the Argyll coast ; the crossing takes 45 minutes and at the time of writing (2013) costs £60 one-way regardless of the size of the group (up to 12 people). Contact Farsain Cruises on 07880 714165. 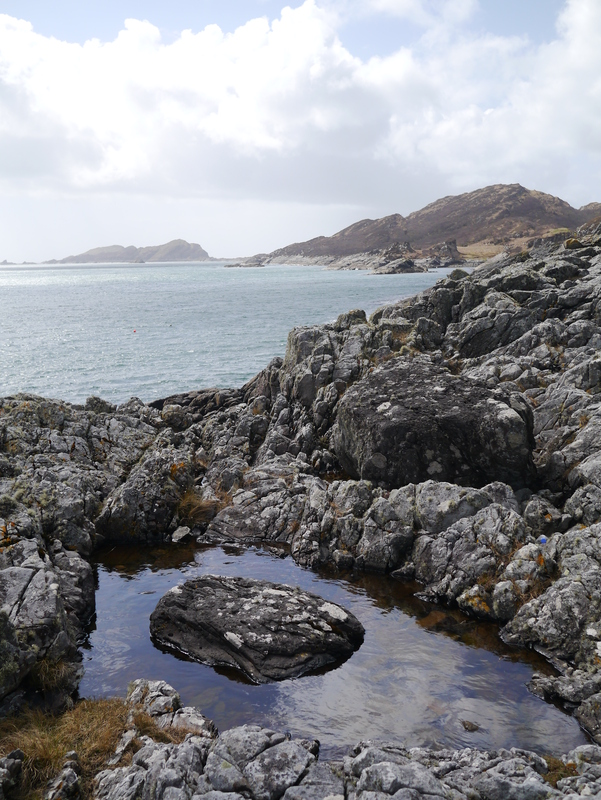 Lots of info about Scarba, including its history, geology, flora and fauna, as well as a cracking route around the island, taking in Cruach Scarba, will be included in the second edition of Walking on Jura, Islay and Colonsay to be published by Cicerone Press in August 2013. 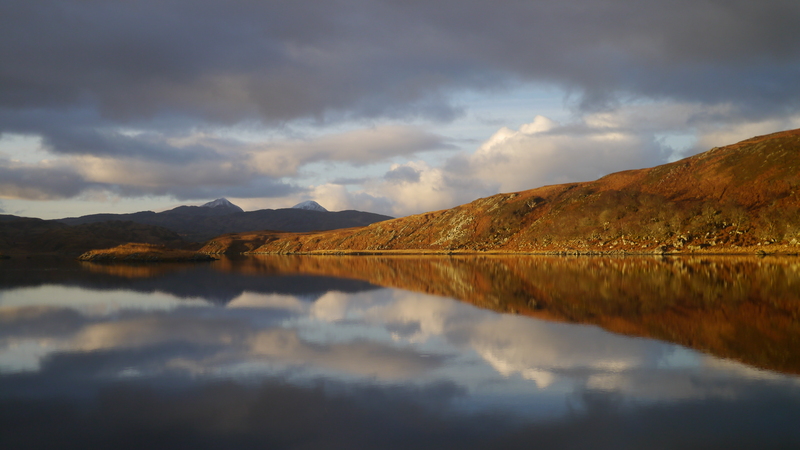 At the beginning of April last year, after two weeks or so on the Outer Hebs (see previous post), we took the ferry back to Skye and TLF dropped me off at the Portree campsite – I was the very first happy camper of the season – before driving back to Glasgow. Our friends Andy and Jen arrived from the Deep South later that afternoon and we set up camp together. That evening was spent planning the next days’ expedition over a couple of drams. 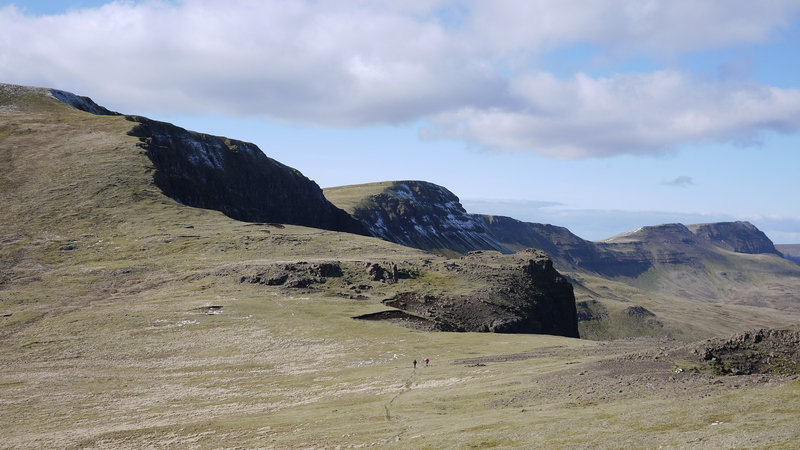 The idea was to walk the Trotternish Ridge from just north of the campsite at Torvaig to Meall na Suiramach at the northern end of the ridge, before swinging around to the west and following the tail of the ridge down to the port of Uig on the west coast. As this elongated version of the route clocks in at a bit under 30 miles, with 2670m of ascent, we would of course need to camp on the ridge along the way. That night the weather changed. 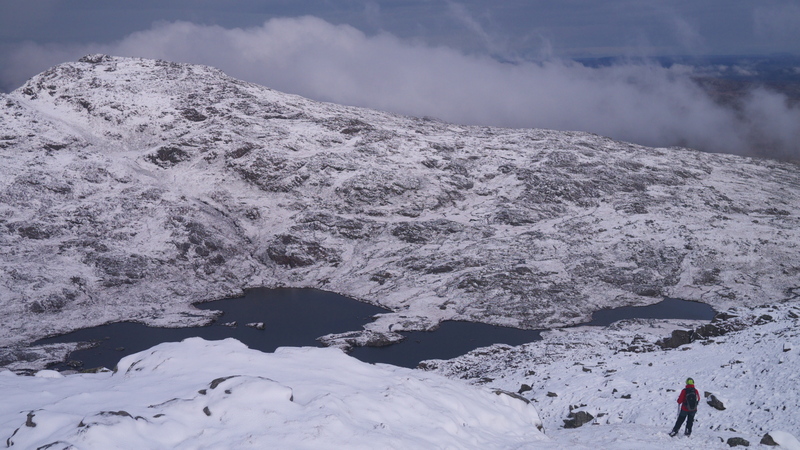 From having been unseasonably mild over the last fortnight with hazy sunshine forming the overall meteorological picture, a building wind blew in from the east with freezing temperatures and a fair amount of snow. The early morning was still a bit wild and once we’d reassembled Andy and Jen’s ‘base camp’ tent, which had taken a good kicking, we re-calibrated our expectations. We decided to put the Grand Ridge Traverse back a day. So… what to do? The Red Cuillin peak, Marsco, seemed to present a handy alternative for a day trip, so we motored down to Sligachan and set off along the Loch Coruisk/Elgol path. 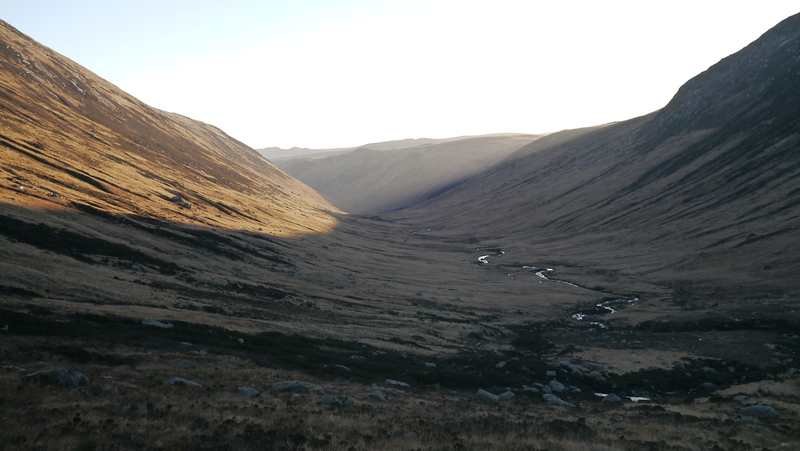 The distinctive summit with its elegant sweeping lines dominates the view ahead as you progress along the glen. 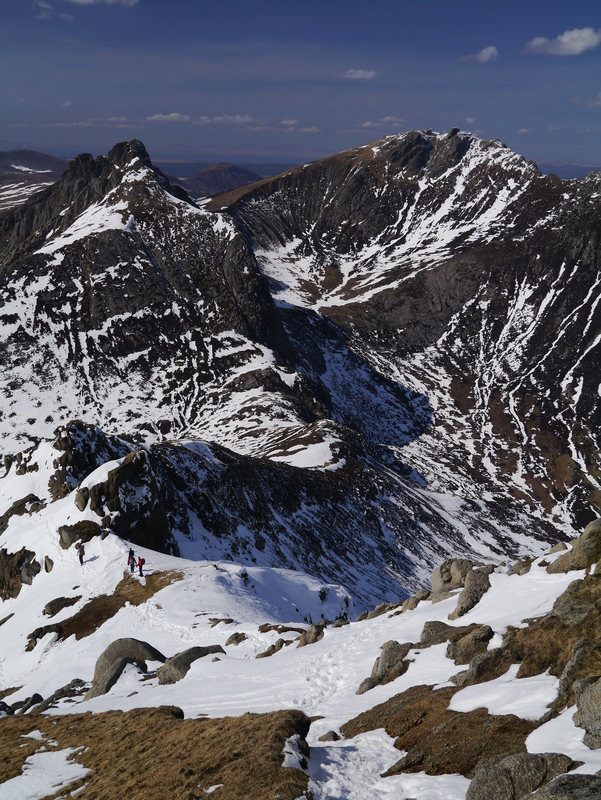 The ‘normal’ ascent of Marsco usually involves climbing along the Allt na Measarroch to the Mam a’ Phobuill bealach then launching up to the summit ridge via the steep slopes of the Coire nan Laoigh; from the summit the outward route is retraced. We had other ideas. 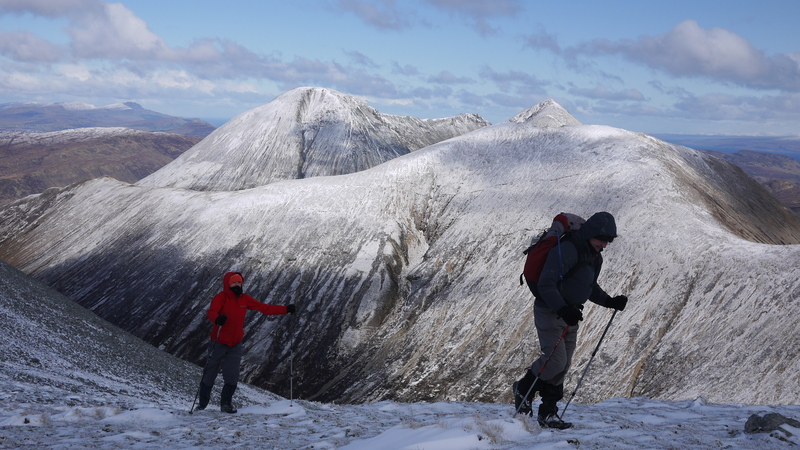 The north ridge of Marsco is so compellingly steep that it seemed on this bright, crisp and absolutely bloody freezing morning, to say ‘come and have a go if you think you’re hard enough’. If I hadn’t been with Andy and Jen I’d probably have run away screaming, but they’re made of sterner stuff , so we duly launched ourselves up the unrelentingly steep incline with thighs a-burning. To make matters worse, much of the ridge has a soft, springy vegetative cladding, so it was a bit like walking up a near vertical bouncy castle. 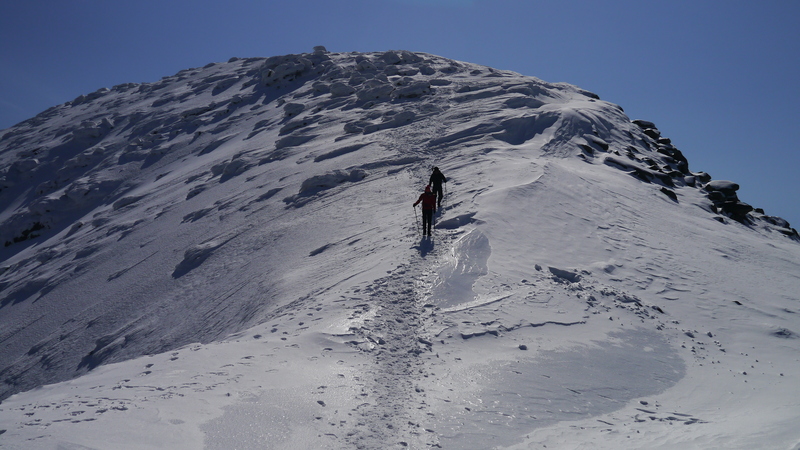 Eventually the gradient eased and we soon gained the summit ridge. Out of the lee of the north ridge the freezing wind was ferocious and bright sunshine coruscated off the frozen snow. 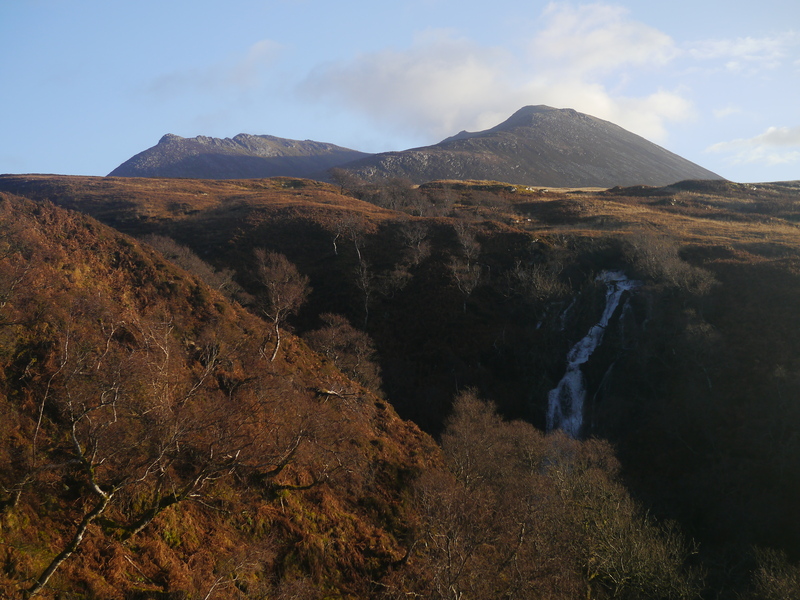 The Beinn Deargs and Glamaig formed the backdrop to the ascent. Then, at the summit, the views were extraordinary. 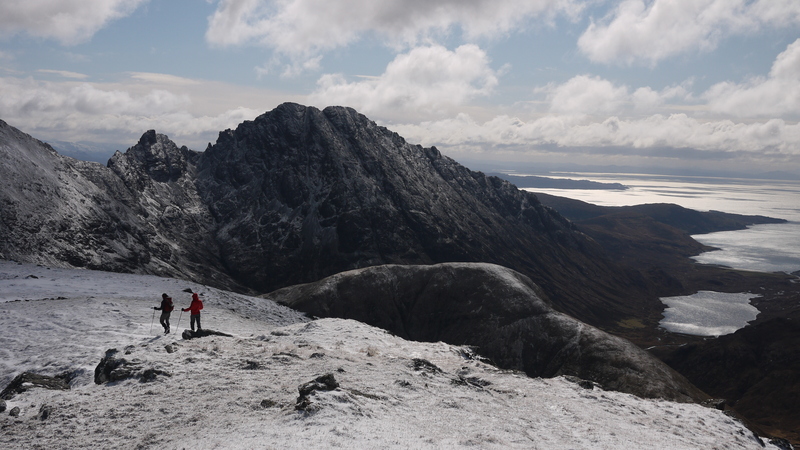 We could see just about every snow-dusted summit along the western seaboard of Scotland and the views closer to hand weren’t bad either. 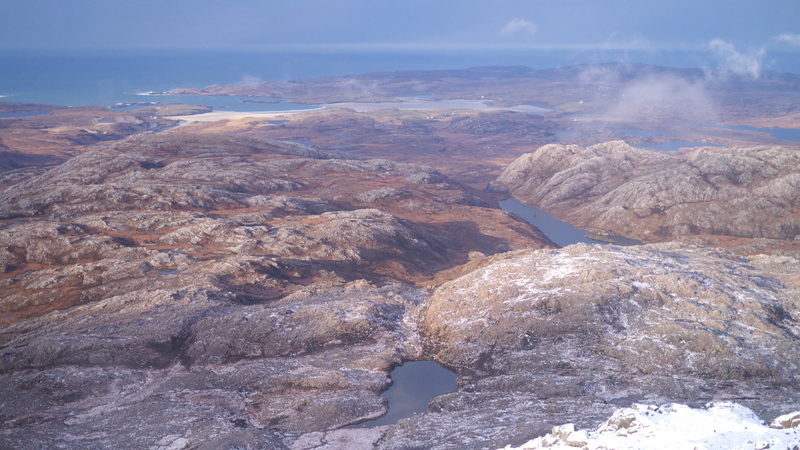 Blaven dominated our immediate horizon and the view down to Camasunary with the Small Isles beyond was tremendous. 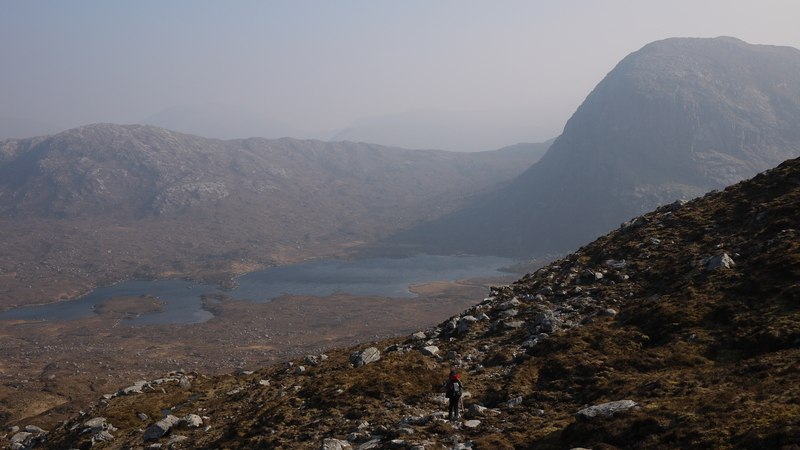 Wee tottered down the Coire nan Laoigh to the bealach and followed the burn back to Glen Sligachan. It had been a good leg stretcher. The next morning was a bit overcast, but the wind had died down and a light dusting of snow remained to give a bit of relief to the flat light. ‘From humble beginnings’ would seem to sum up the southern terminus of the ridge, which isn’t wildly exciting, if truth be told. Mind you, if the modest summits of Peinn a’ Chleibh, A’ Chorra-Bheinn and Beinn Dearg were in the Southern Uplands, they’d not look out of place. 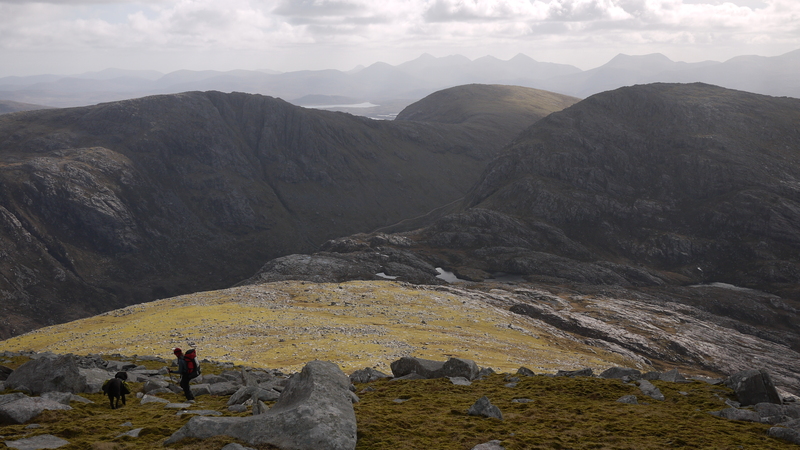 As we approached the summit of Ben Dearg (552m), we got our first glimpse of what lay in store. 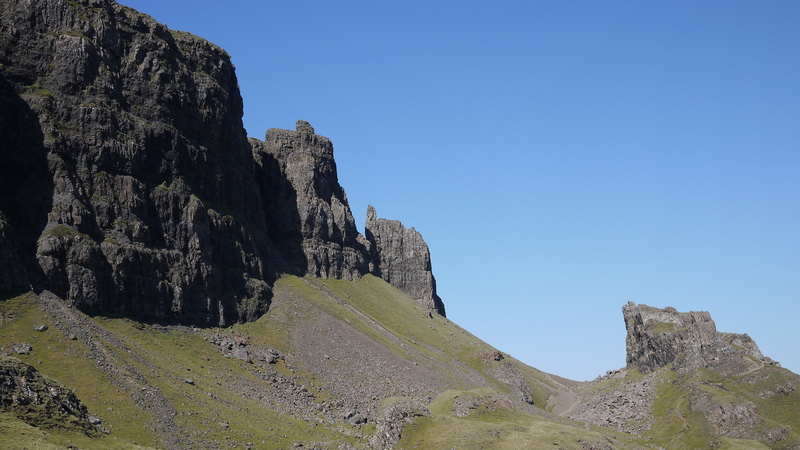 In fact we could plainly see that it was actually The Storr lying in store… (sorry). 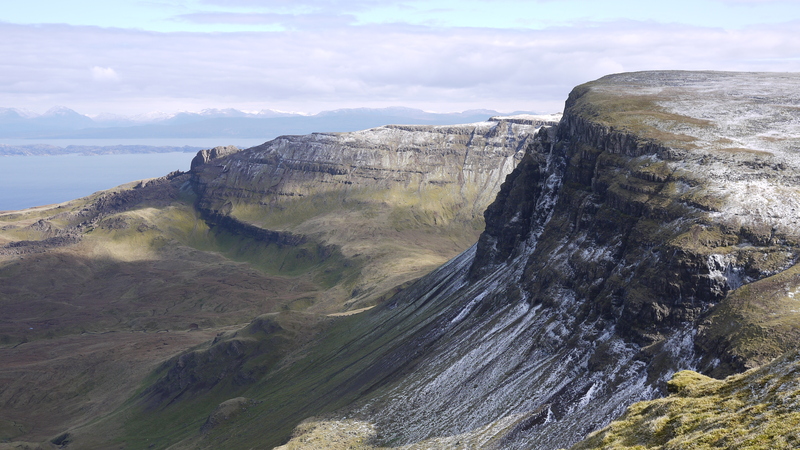 The next few miles of our route unfurled along the ridge before us; a vague path cleaves to the edge of the east scarp before climbing to the summit of the Storr. 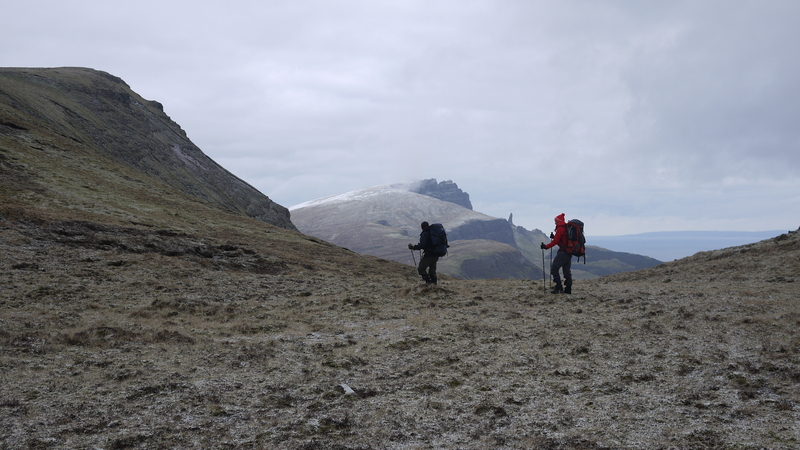 Our main concern was that conditions would remain clear; navigation wouldn’t be too big a problem in the murk, but it was becoming very apparent that this was one walk where missing out on the views would be a great big, fat shame. 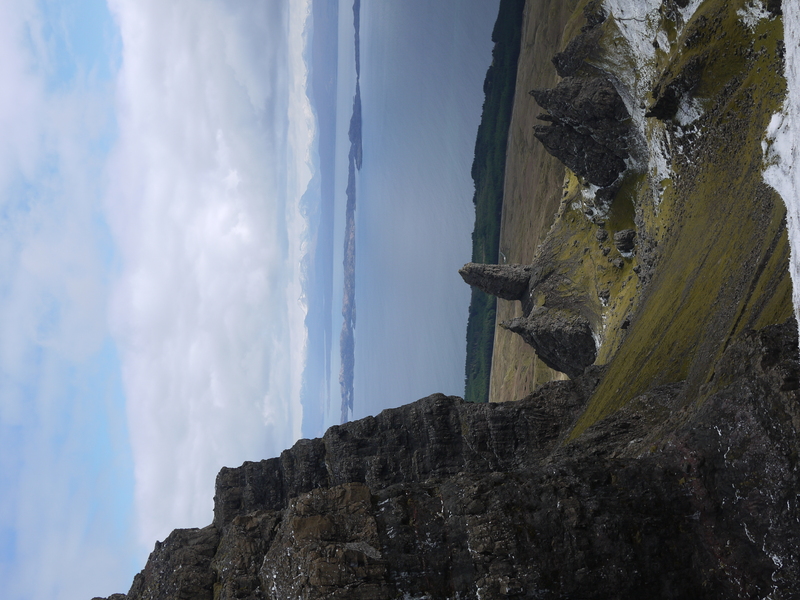 …before beginning the reasonably stiff climb along the flank of The Storr. 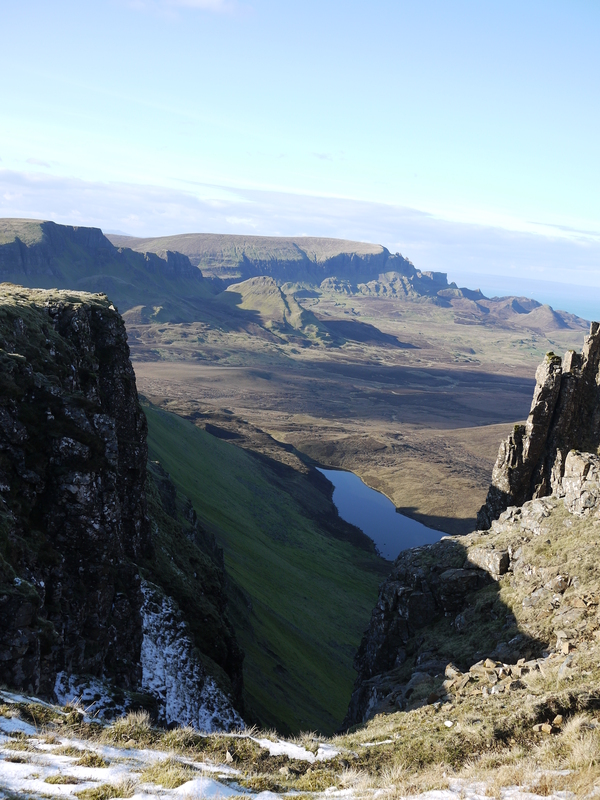 The rim of the cliffs along the vertical east face of The Storr provided grandstand views of the Storr Sanctuary, with its array of rock pinnacles including the renowned Old Man of Storr. 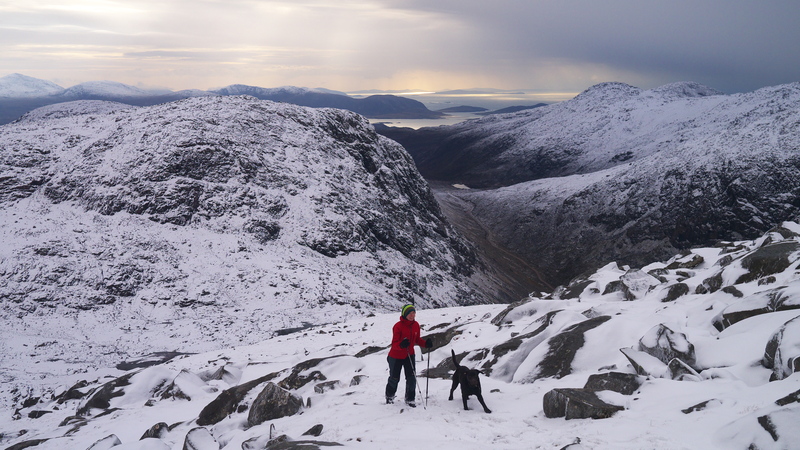 The summit (779m) provided opportunity for a pause-ette, a quick snack and the chance to take in the view west to the snow-covered Harris Hills. 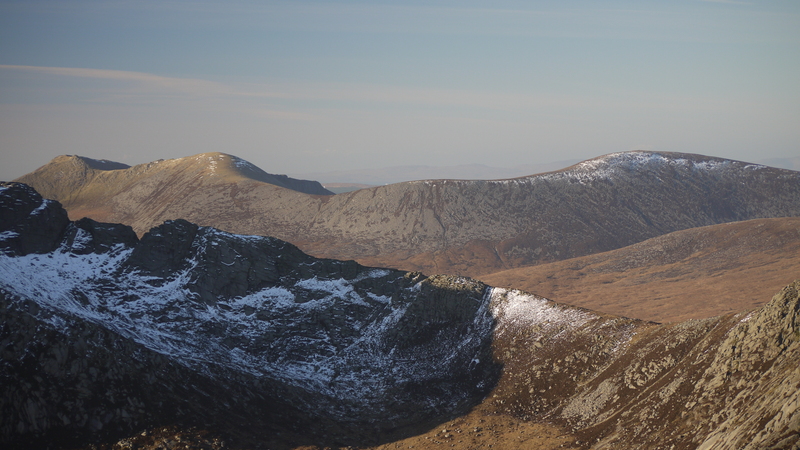 We set off again with views along the next few miles of the sinuous ridge enticing us along. …then up again. Our packs laden with camping gear, we were beginning to feel the up-down effort; still, it did seem to be brightening up a bit as we approached the top of Hartaval (668m). Our outing was fast becoming a classic day in the hills; the serpentine ridge looked absolutely sublime in the burgeoning light. 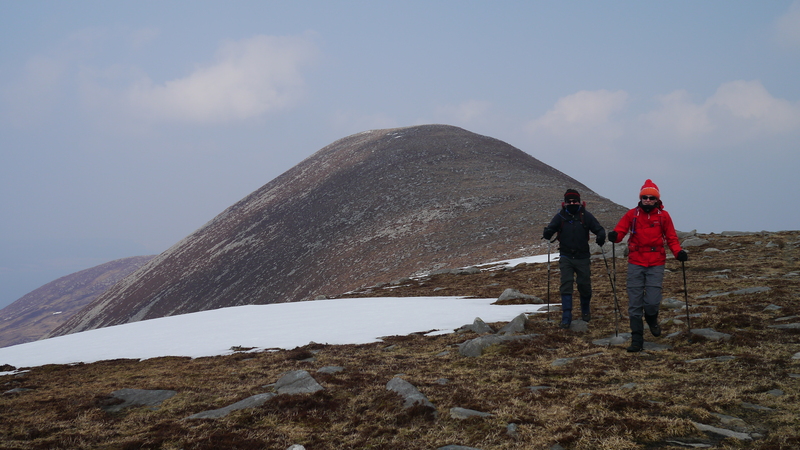 We made good progress along the undulating ridge, taking in a series of tops and bealachs; our spirits in good order, in no small part due to the weather. 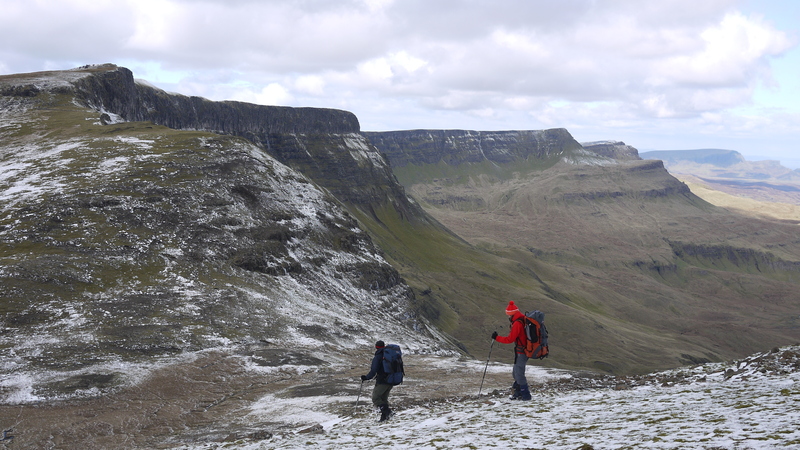 We then encountered the only people we would see on the ridge that day, three handsome German lads who were walking from Staffin to the Storr in a day, with little to encumber them; that did make our packs feel a bit heavier! A sheer-sided cleft in the escarpment provided an obvious opportunity for a photo. Andy is sitting not because he’s tired, but actually because that’s one very exposed perch; much more so than it looks. He’s not usually given to failures of nerve, but this was definitely squeaky-bum time. 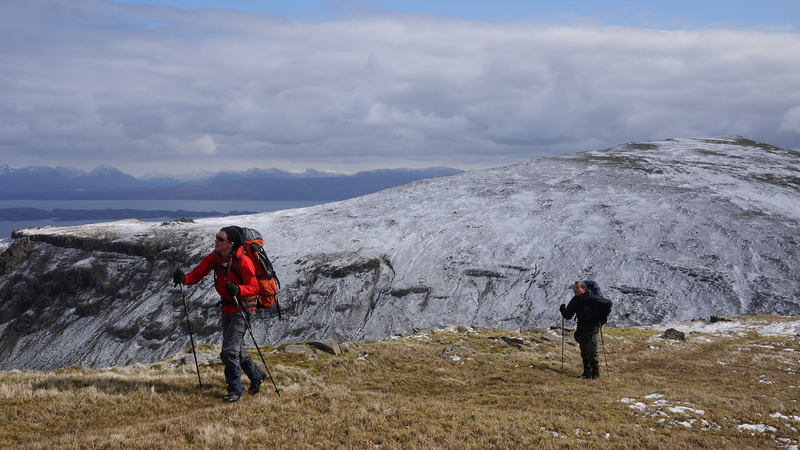 Continuing on our way, Beinn Edra loomed ahead; we were aiming for the Bealach Uige, just beyond this whale-backed summit, for that night’s camp. 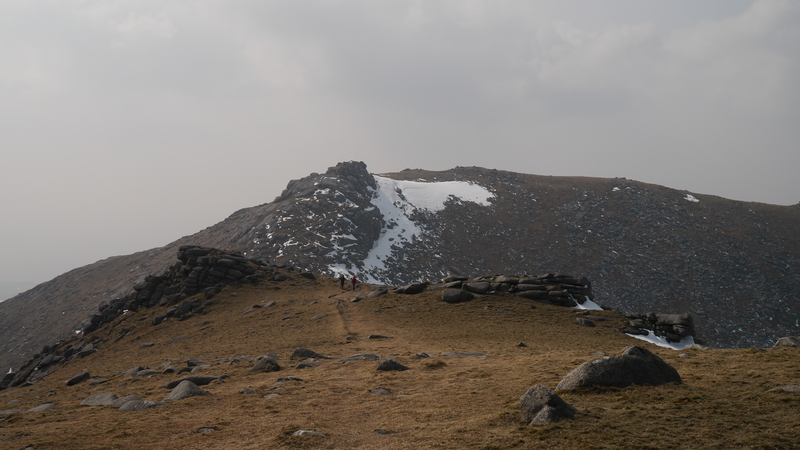 The Bealach Uige is one of the few places along the ridge where running water is available. We continued over the next couple of top/bealach combos then at the foot of Beinn Edra Andy and Jen decided that they would skirt around the flank of the hill and would meet me on the Bealach Uige. 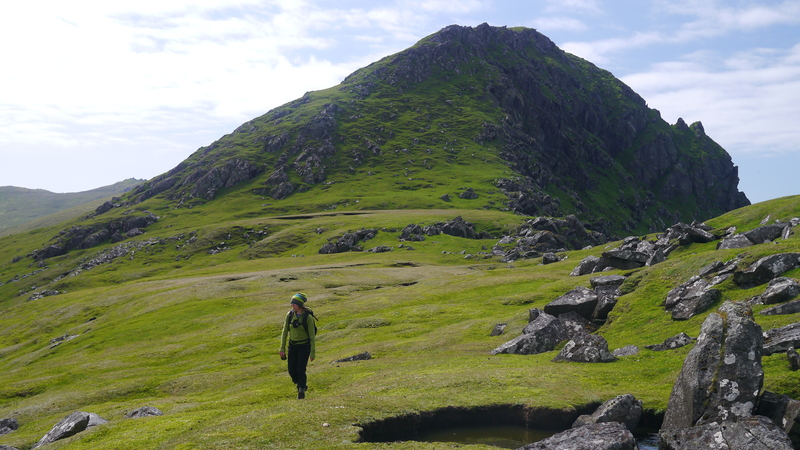 We were all a bit knackered after nine hours of committed walking, but missing Beinn Edra out wasn’t an option for me as I was’ contractually obliged’ to walk every step along the ridge as the route is going in The Big Book of the Hebrides. 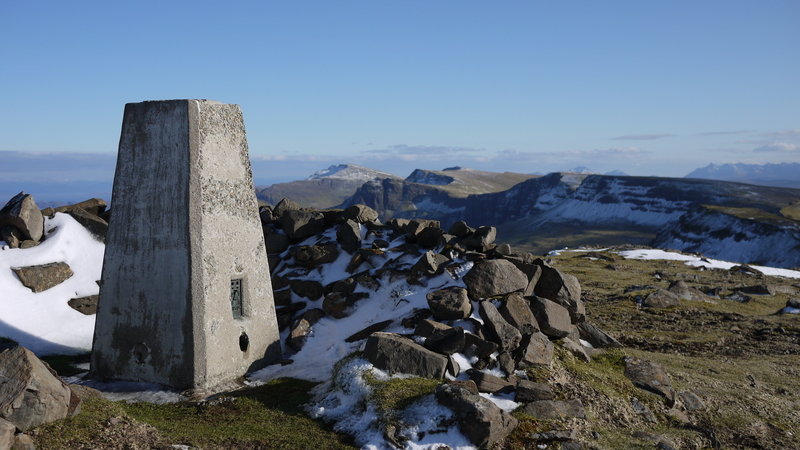 From the summit (611m) trig point the view back to The Storr was as clear as a bell. 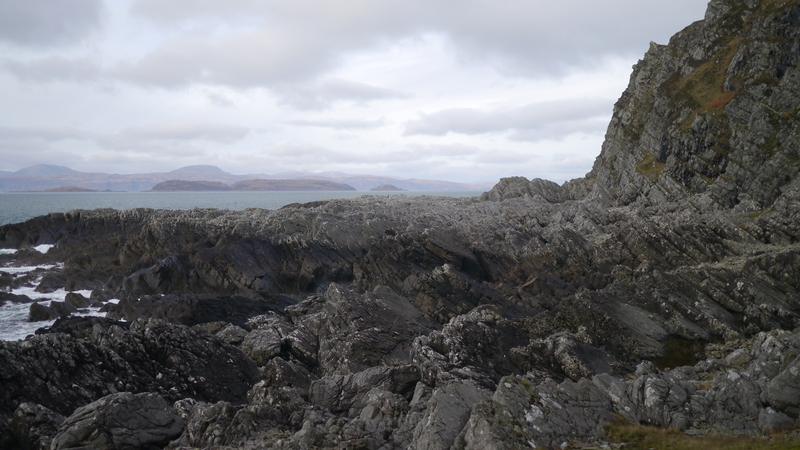 The Cuillin are visible on the extreme right of the picture. 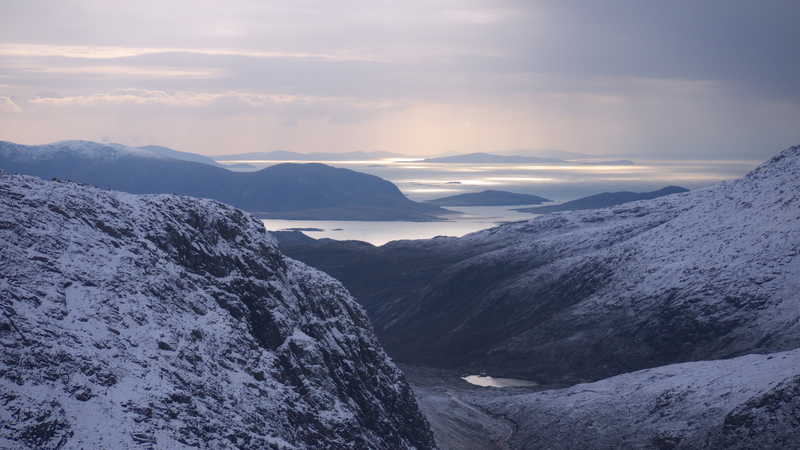 I trotted down the hill near the escarpment edge and eventually arrived at the bealach. 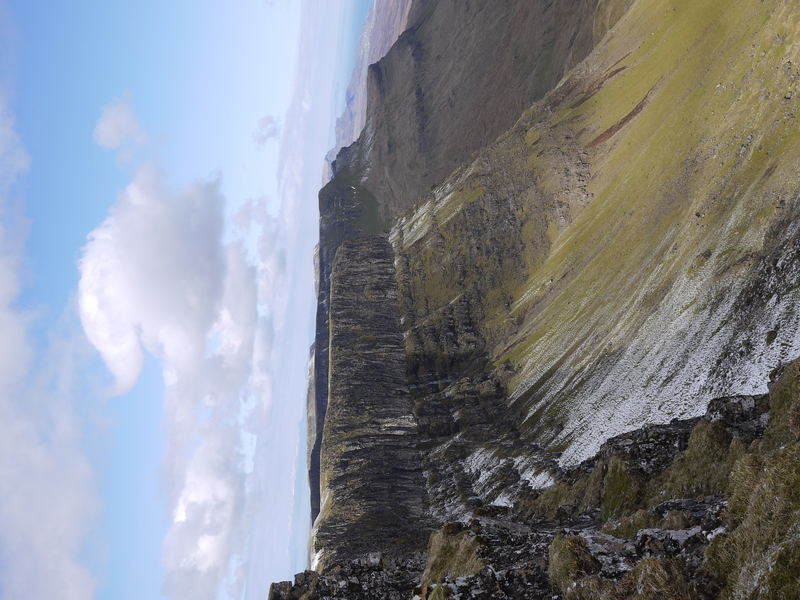 The view north to the Quiraing presented a tantalising prospect for the next day’s walk. 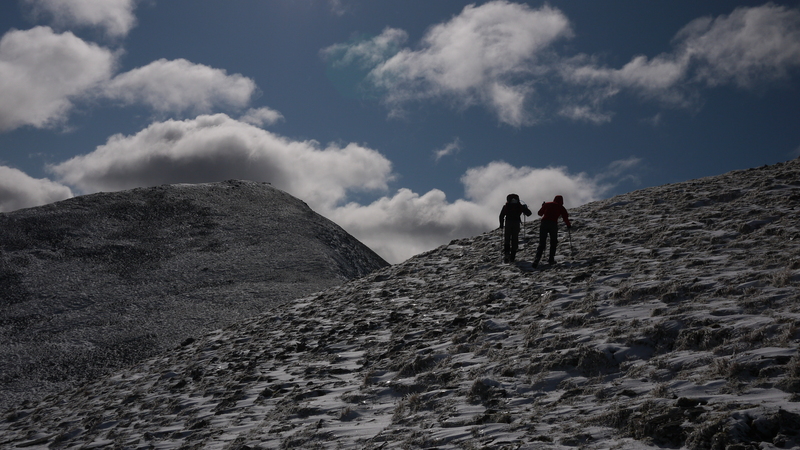 I could see Andy and Jen still a way back along the western flank of Beinn Edra. When they arrived they were a bit done in as the going had proved to be really rough underfoot, so the ‘short-cut’ had proved to be a bit of a false economy. We found the only dry-ish few square metres on the bealach and pitched up. After a water-gathering sortie we cooked our dinner and had a wee ‘whisky-nail’ (copyright: Andy Dodd 2010) – this is a sassenach interpretation on the theme of the famous ‘rusty nail’ – a combo of Drambuie and whisky, though I can’t remember what went into this particular incarnation. 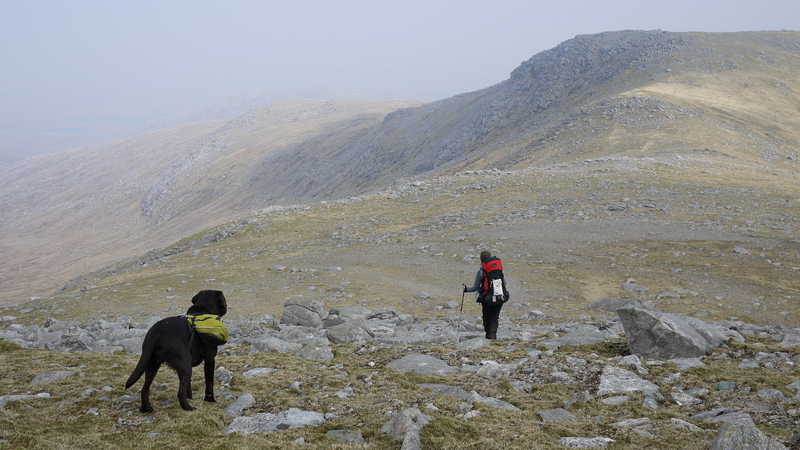 The breeze had picked up a little and in truth our pitch on the bealach near the edge of the escarpment was a little exposed. However, aside from a little rustling of rip-stop nylon a peaceful night was passed. By morning, however, a turgid fug of perma-clag had descended on the ridge and we could hardly see a sausage beyond five metres. Hey-ho, we could hardly complain after the glories of the previous day. We packed up and continued on our way. Within a kilometre we had espied a tiny ‘tent’ on the Bealach Coisichean; this was the kind of bijou ‘shelter’ beloved of those versed in the dark art of ‘bivvying’. It didn’t look very comfy, but then its owner probably wasn’t hauling 15 kilos along the ridge. 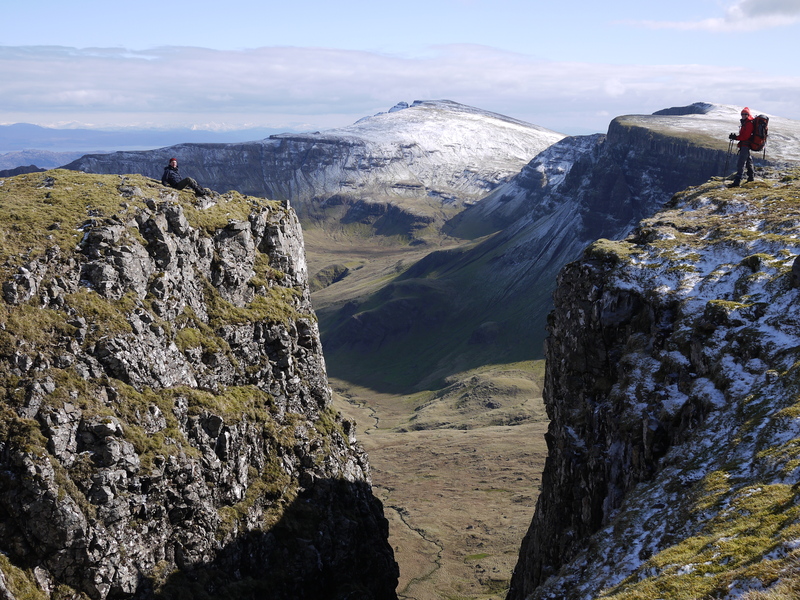 We greeted the occupant who was firing up a brew – a chap well into his sixties who was tackling the ridge from Uig to Portree. We supplied him with the requested intelligence on what to expect on his route ahead and I felt a pang that he’d miss out on the grand views we’d enjoyed the day before. 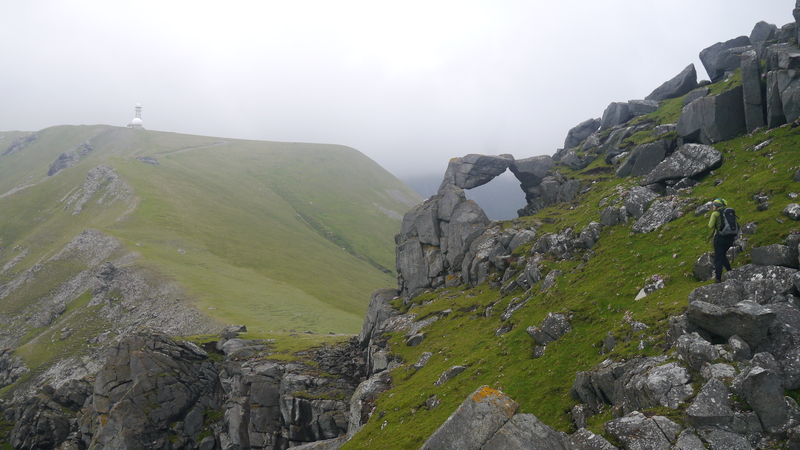 We crossed the road and picked up a fairly obscure path climbing along the flank of Meall na Suiramach (543m). 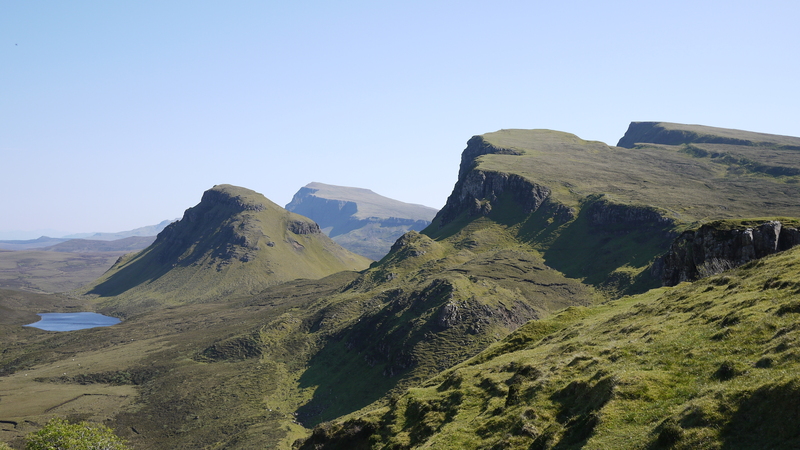 Apparently, from the edge of the escarpment the views down onto the phantasmagorical collection of rock pinnacles, castellations and crenellations comprising the Quiraing is somewhat awe-inspiring; though for all we could see there may have been a giant Tesco superstore down there. From the summit we followed compass bearings due west to descend towards the lower top of Beinn a’ Sga. 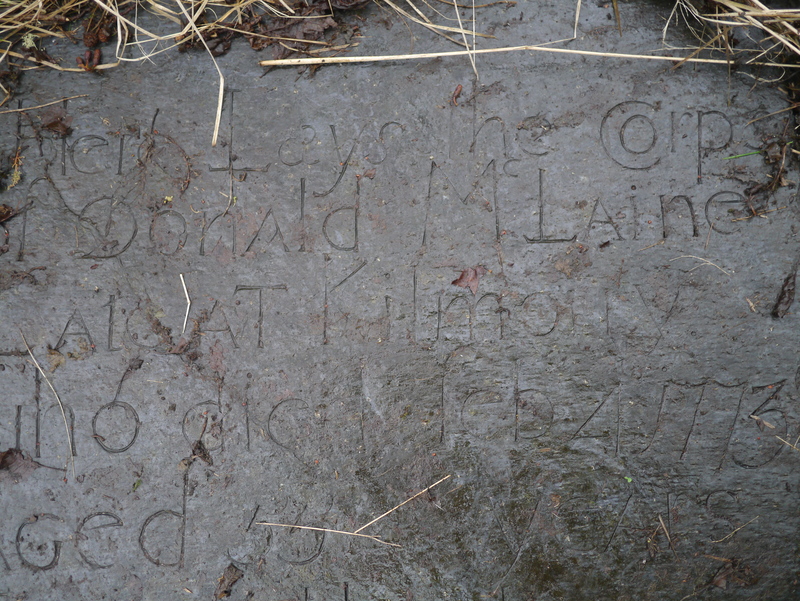 On paper (the OS 1:25,000 map) this looked pretty straightforward even in dense perma-clag. However, on the ground the ground was one huge tract of sodden peat hags and deep run-off channels. This made for hard work, but eventually we were able to drop south-westwards down the flank of beinn a’ Sga and emerge from beneath the murky lid that sat along the ridge. 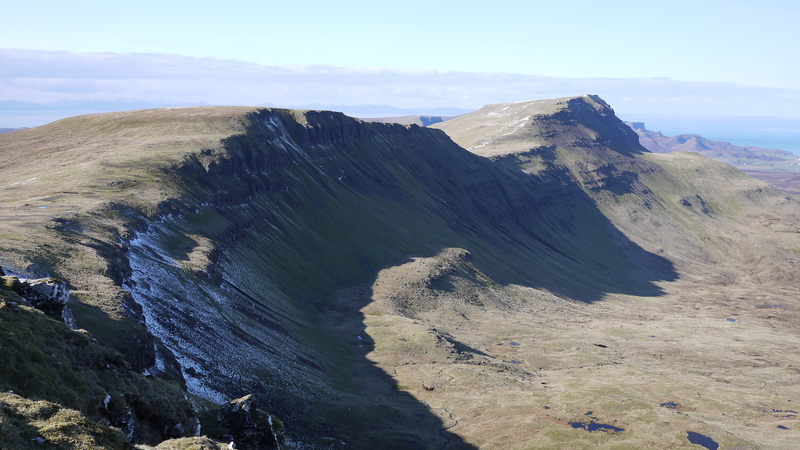 We crossed a deep gorge and climbed steeply west along the edge of Creag Sneosdal to the summit of Suidh a’ Mhinn (350m). From here we descended south along the escarpment edge before climbing steadily once again along Creag Colluscard and thence to the summit of Reieval (299m), the very last top along the ridge. 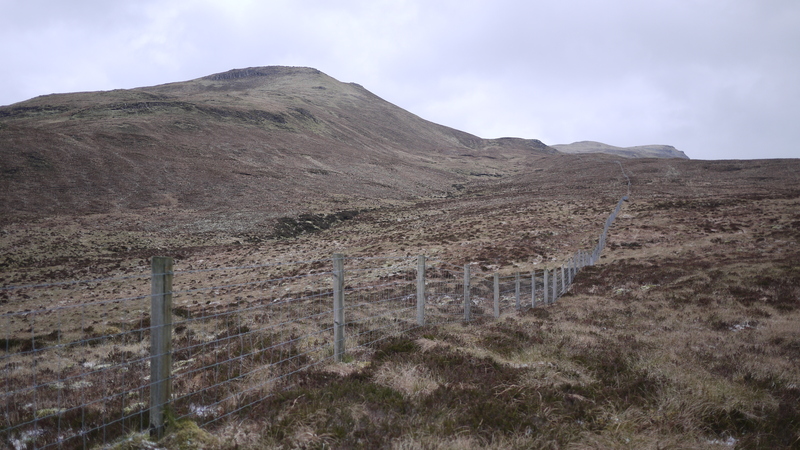 There followed an unglamorous descent, crossing several user-unfriendly stock fences, to reach the minor Uig – Staffin road. We staggered the final couple of miles to the bus stop by the Calmac office in Uig only to find that the Uig – Portree bus actually stopped a mile up the road. This news was not welcome. However, we just about overcame this final hurdle and we were soon back at the Torvaig campsite, showered and fed with a ‘whisky nail’ in hand. 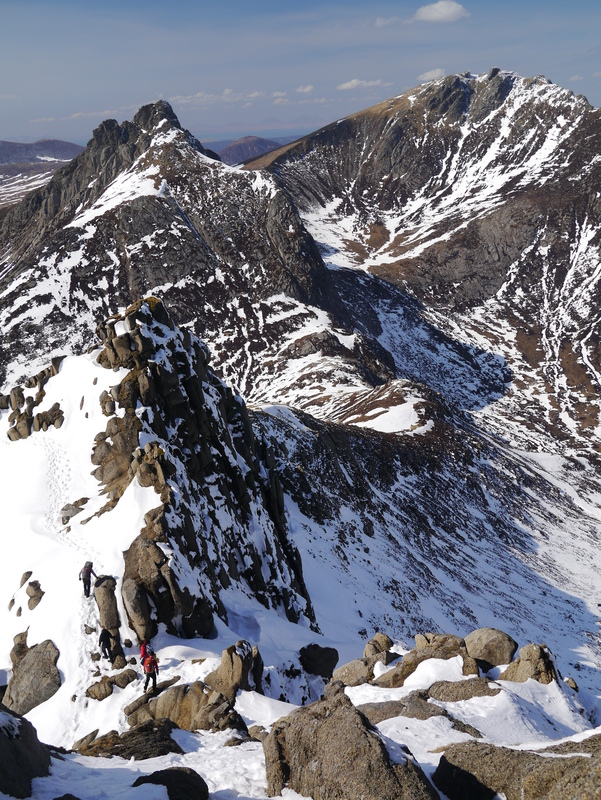 Obviously the ridge can be walked in either direction and where you start and finish is up to you. 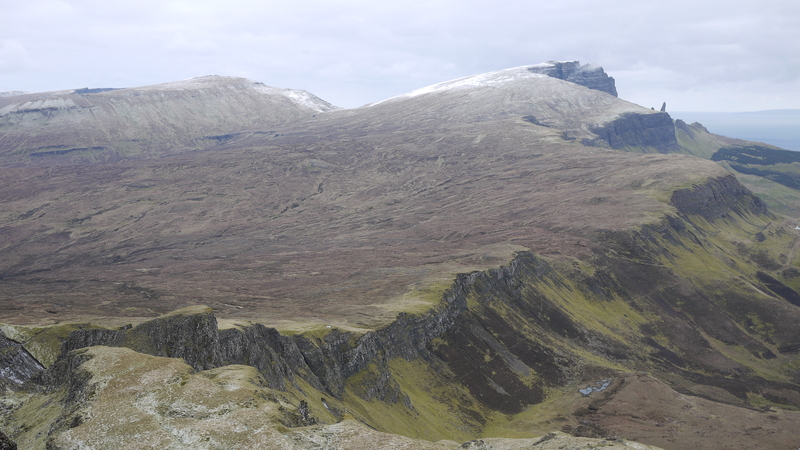 A day walk alternative is to gain the ridge at The Storr and walk north to Staffin or Flodigarry, or vise versa. 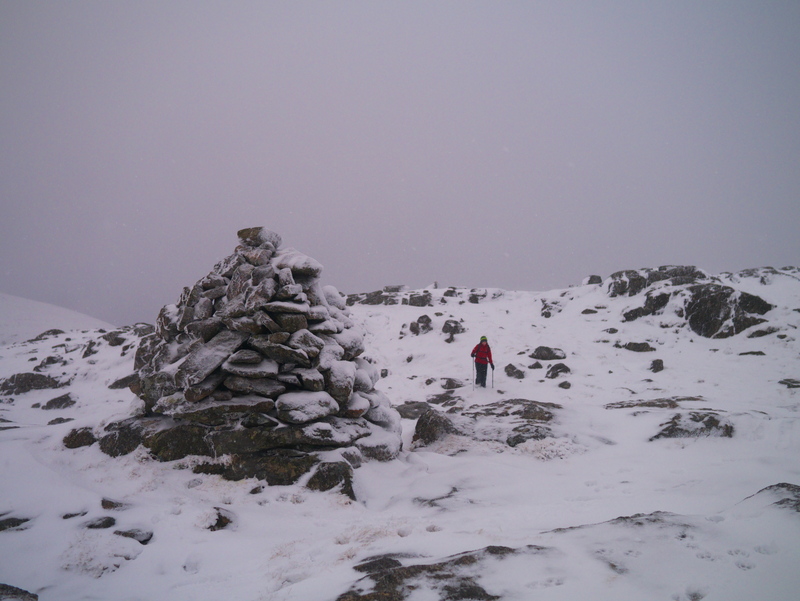 It’s a cracking walk, but one to save for clear conditions if you possibly can. TLF and Quasimo-dog with friends on windy Sheabhal. 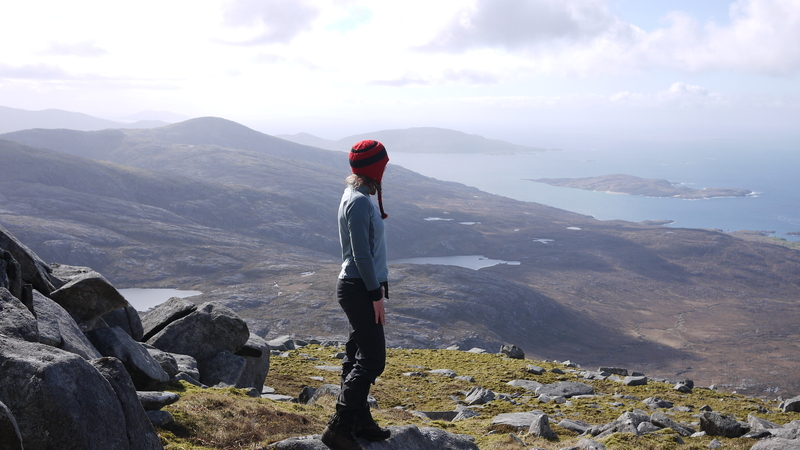 The following day, we headed north by ferry to Eriskay and thence over the causeway to South Uist where we embarked on an epic two day backpack taking in the summits of Hecla, Beinn Corradail and Beinn Mhor on the island’s east by way of the wee bothy at Uisinis. 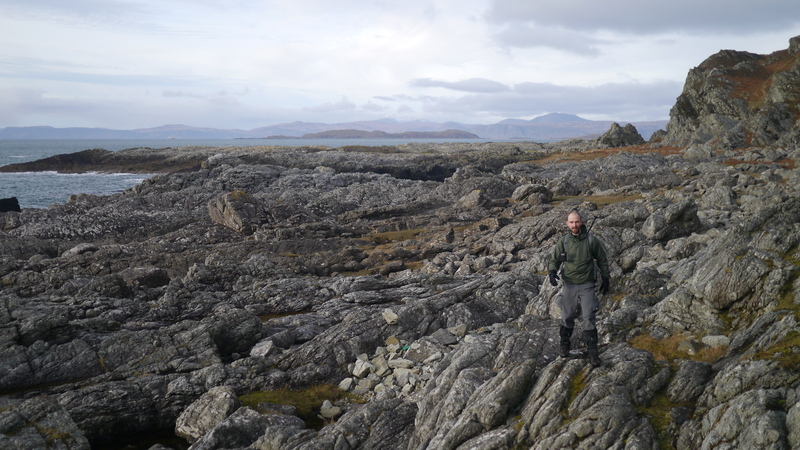 It was a tough walk on some rough and boggy terrain, but the pay-off was a real sense of sublime isolation in a surprisingly wild and remote corner of South Uist only a few miles from the road. 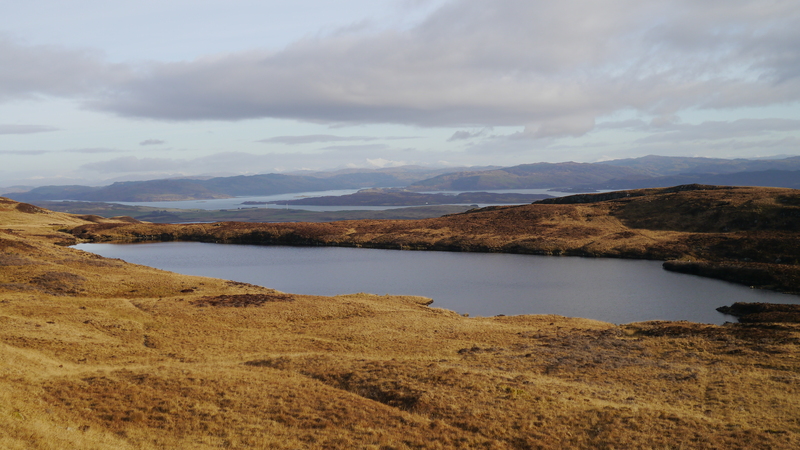 We started our walk from a small parking area by Loch Druidibeag (an RSPB reserve). A long tramp along a single track road was followed by a couple of miles of waymarked path above the shore of Loch Skipport. 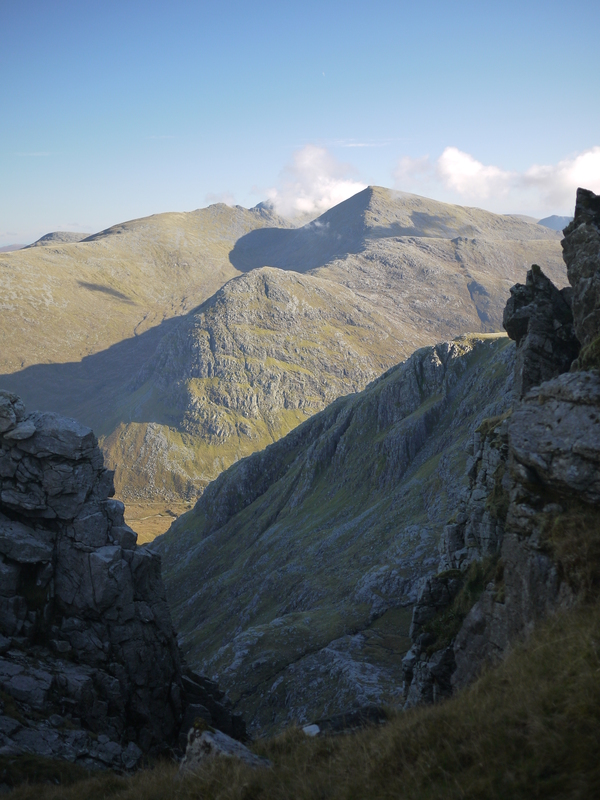 This faded away, leaving us to forge a muddlesome route between lochans to gain the long ridge that climbs gradually along the tail then up onto the spine of sleeping Hecla – a mountain I can’t but think of as a dragon lying supine by the island’s eastern coast. 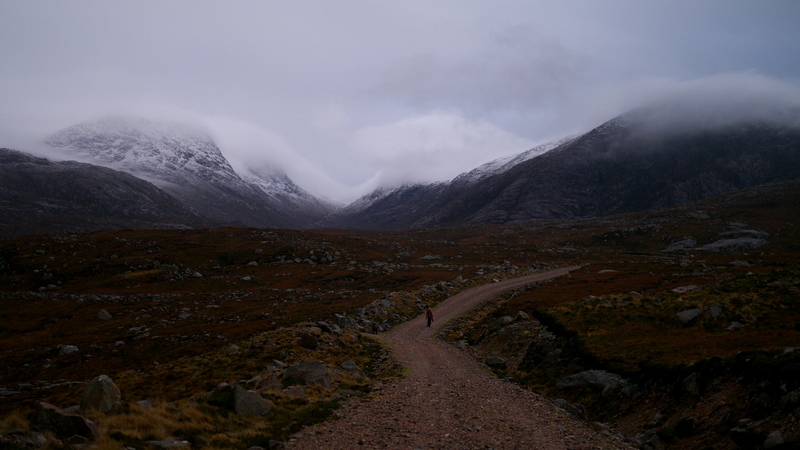 There followed a slightly tricky descent to the bealach between Hecla and Beinn Corradail – it’s possible to bivvy here, but we preferred to descend through Gleann Uisinis, past the eponymous loch to shelter at the bothy for the night. 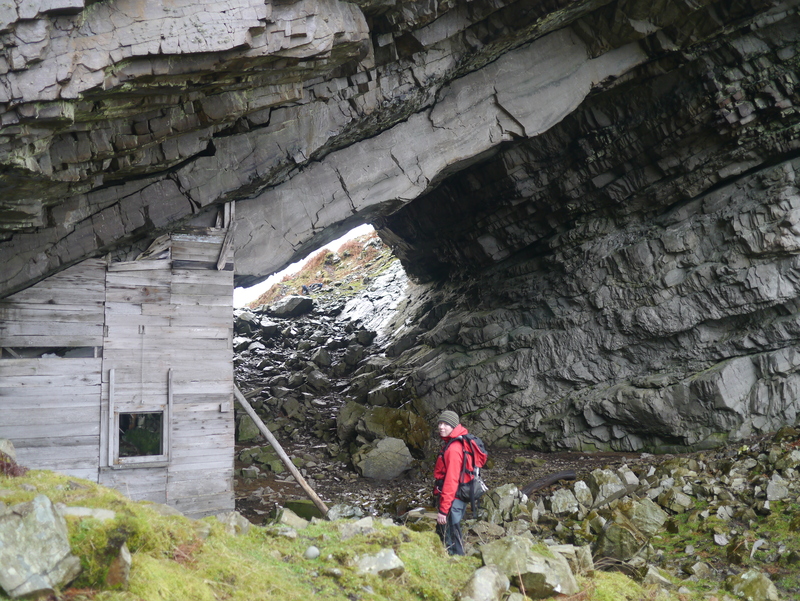 The bothy was in a bit of a sorry state when we visited, but an MBA work party has since sorted the place out – it’s a fine wee shelter in a sublime spot for those who like that sort of thing. James. Lots of driftwood at the nearby beach. 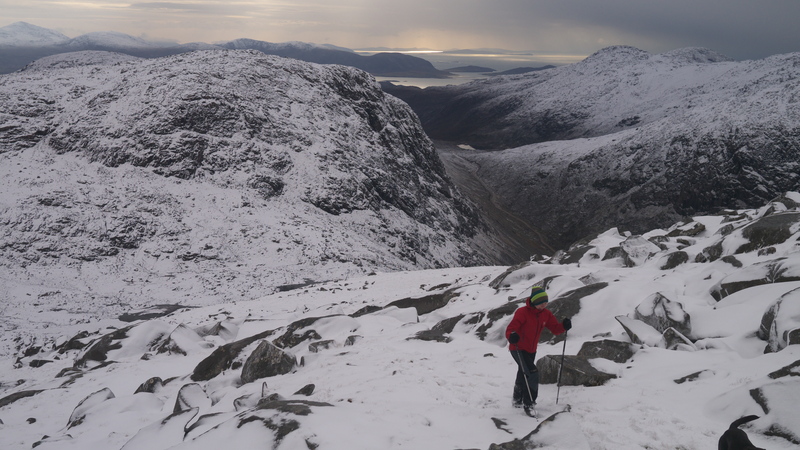 The route to the bealach was retraced early the next morning before making the ever-steepening climb to the summit of Beinn Corradail. There follwed a slightly tricky descent to the Bealach Heileasdail before the climb to the summit ridge of Beinn Mhor – the walk along the narrow ridge to the summit trig point was excellent and the views from the summit are commanding, taking in much of the Uists and the Cuillin of Skye and Rum to boot. 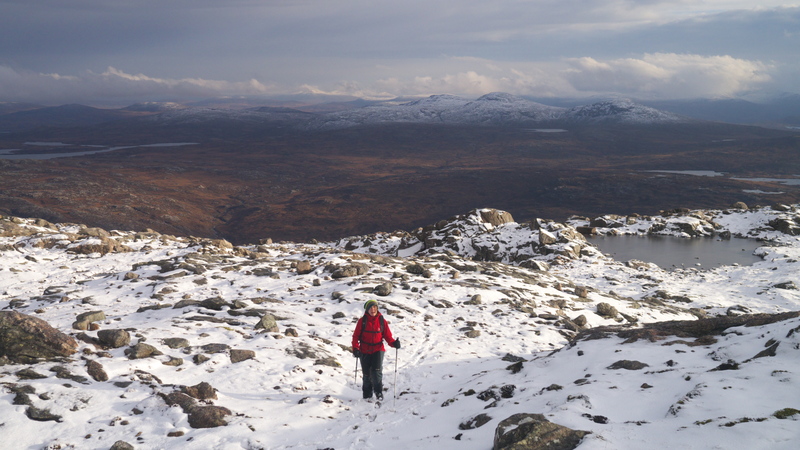 The steady descent from Beinn Mhor was followed by a taxing cross country yomp across boggy, tussocky ground to the road. 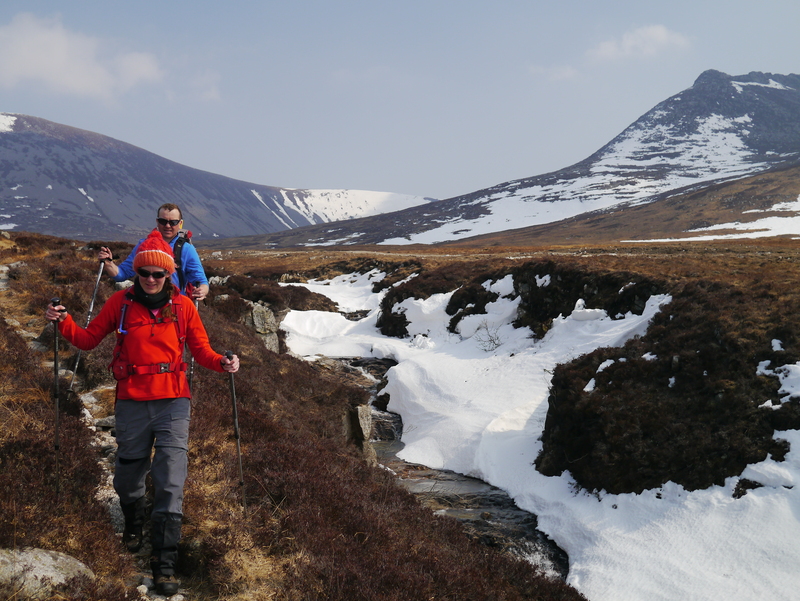 The return along single track roads was a little dull until we arrived at Howmore where the return along the Machair to Loch Druidibeag put the spring back in our steps. 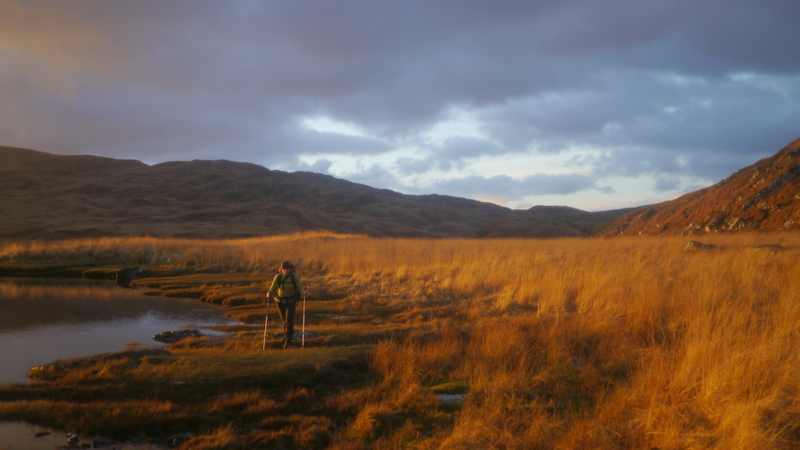 I’d recommend this route to anyone who likes their wild and remote and can handle the rough and boggy – just so long as your navigation skills are in reasonable order. From South Uist we headed north to, erm, North Uist. 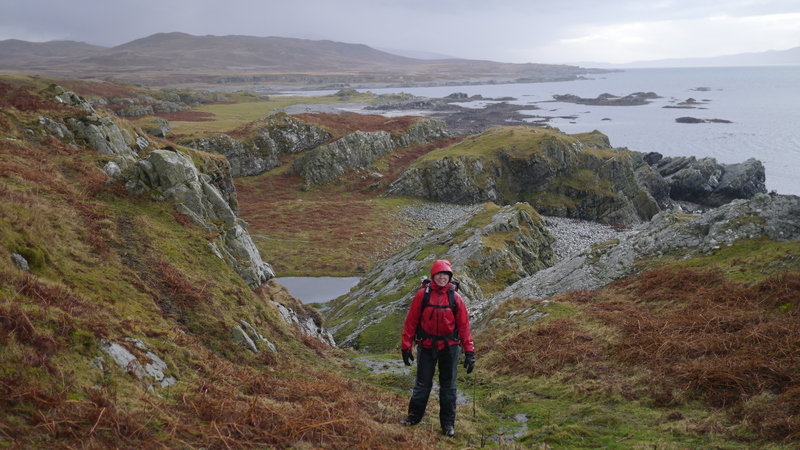 A sinuous route through bogs and lochans took us to the wedge-shaped summit of Eaval and back before we headed to the northern end of the island to Udal and the first in a series of white sand beach-garlanded coastal walks. A greater contrast with the bogs of Eaval would be hard to imagine. 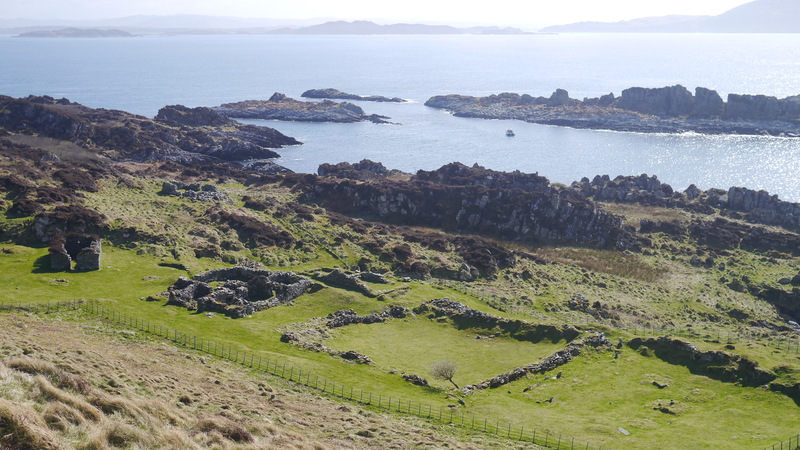 If you plan a trip to the Outer Hebs, it really is worth visiting this lovely peninsula – it’s a beautiful spot with lovely views and traces of the ancient settlement of Veilish for added historical interest. Needless to say that in the five hours we spent walking around the peninsula we saw not a soul. 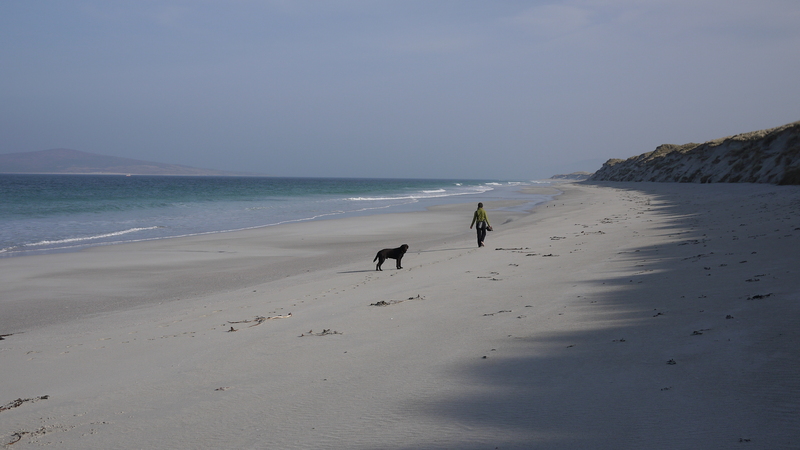 Next up: we drove over the causeway to Berneray for another white sand beach extravaganza – this one featuring the three mile beach that accounts for virtually the whole of Berneray’s west coast. 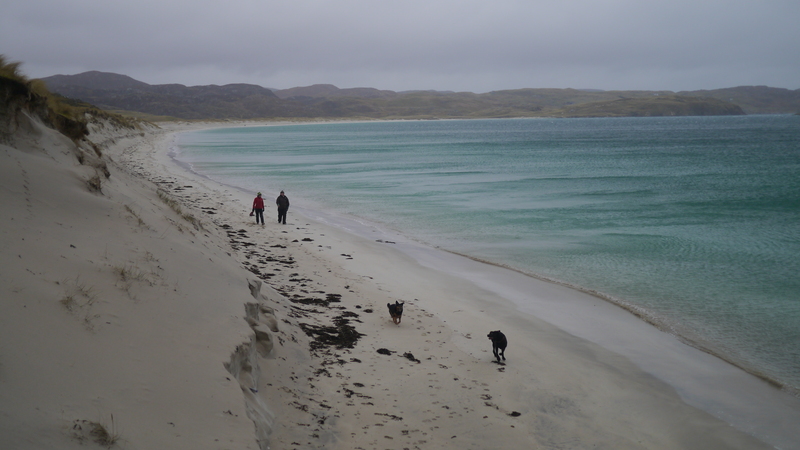 Our walk took in this splendid beach with it’s views across to Pabbay and the Harris Hills as well as the local high point -the 93-metre summit of Beinn Shleibhe. Pretty much like paradise, eh? 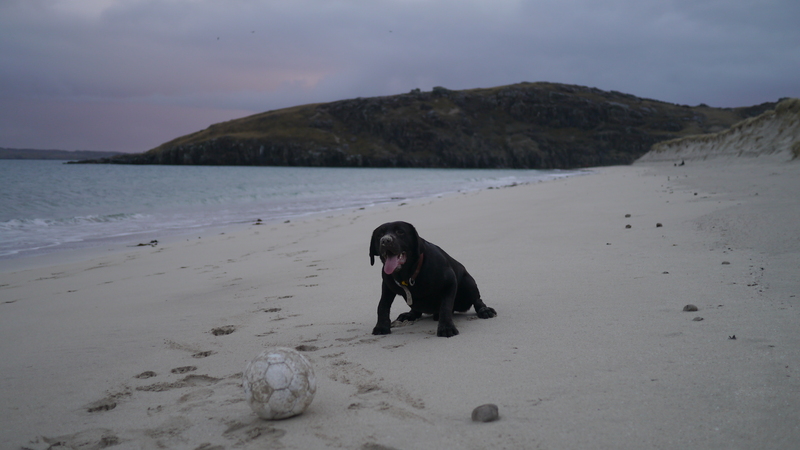 Well, yes, except there was one big fat, greasy bluebottle in the ointment that marred our stay on Berneray. After our walk we camped outside the island’s Gatliff Trust youth hostel; inside the hostel was a total mess with food and grease all over the table and work surfaces, greasy washing up in the sink and detritus scattered about. It seemed the offenders had stayed, trashed the place and then buggered off; but where was the warden who is supposed to check up on the hostel every day? We cleaned the place up and retired to our tent. A gang of builders turned up the next morning, it seems they were staying there while working on a house, which is totally against the ethos of the hostels. I confronted the hairy-arsed Neanderthals and got into a rare old slanging match with them, they tried to intimidate me, but I wasn’t having it as I was pumped up with righteous indignation. When we left the hostel we tried to speak to the warden, visiting her house twice but she was elusive to say the least. 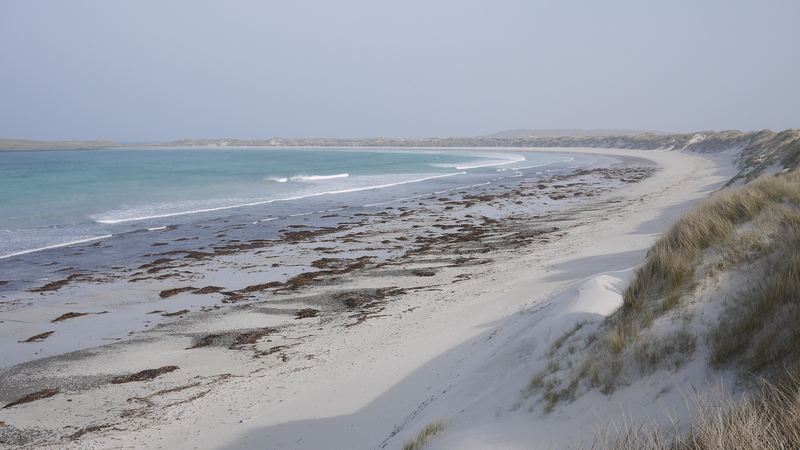 So we spoke to the Gatliff Trust’s chairman on the phone – he seemed concerned and said that he’d check up on Berneray hostel in a few days as he was visiting the area. However, we encountered him a few days later at the Trust’s Reinigadale hostel on Harris and to be frank he didn’t inspire confidence. A sorry state of affairs. Anyway, I digress. 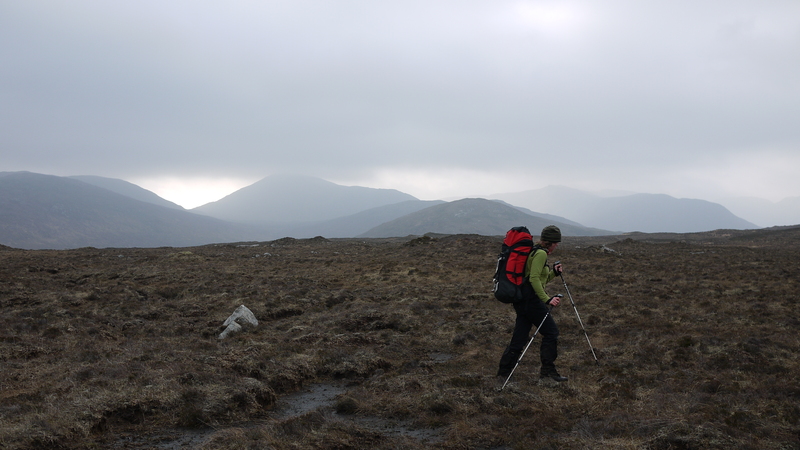 Next morning we were up early and setting off on our next tw0-day backpack among the north Harris Hills; the weather continued in its mild, sunny though slightly hazy vein, which was perfectly acceptable for March as far as we were concerned. 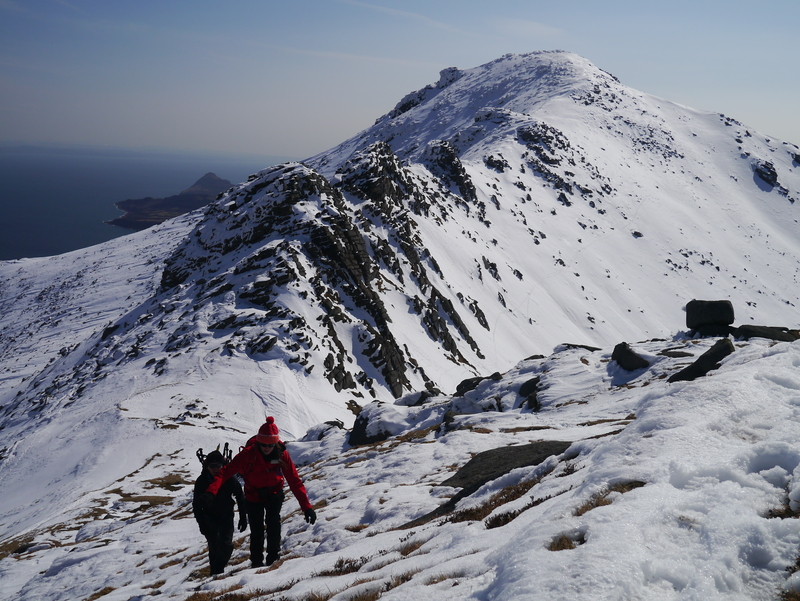 Our route took us first along Gleann Chliostair from Abhainn Suidhe, thence to the summit of Tiorga Mor (679m) by the most ill-conceived route imaginable. Doh! Great views from the top, mind. 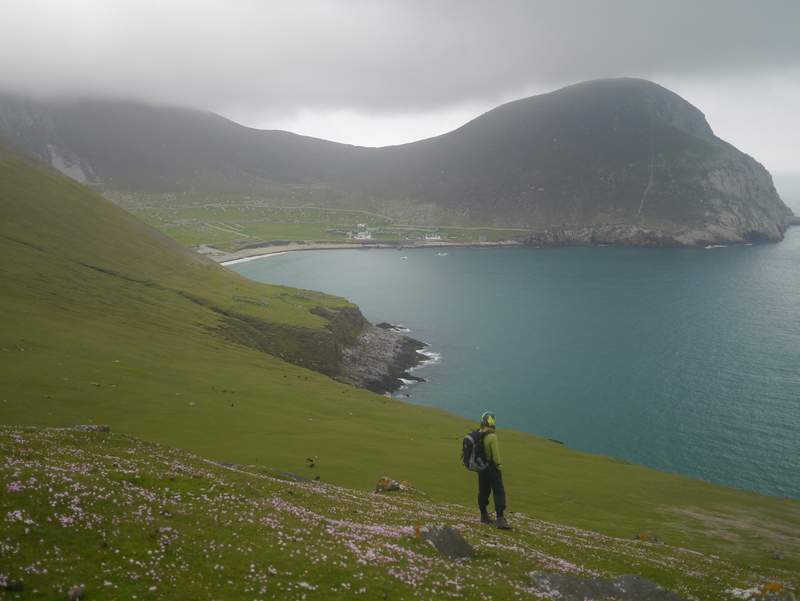 After a brief pause-ette to admire the expansive views – was that St Kilda far to the south-west? 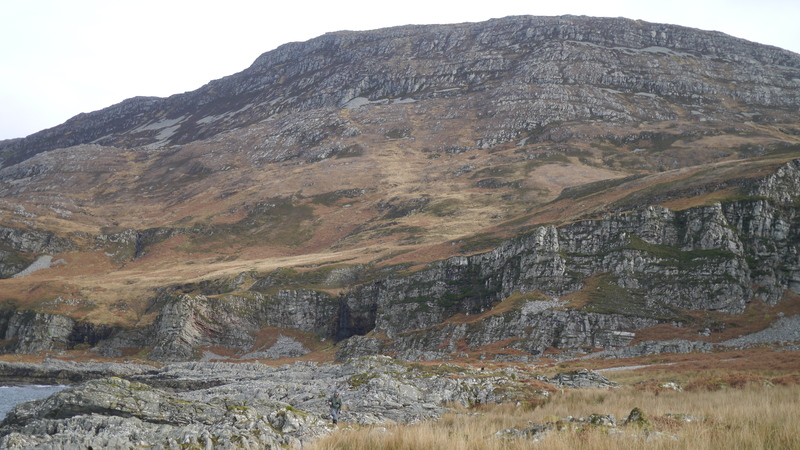 – we tottered along the rock-strewn ridge. It was a mild and hazy old day – a theme for most of the previous week. 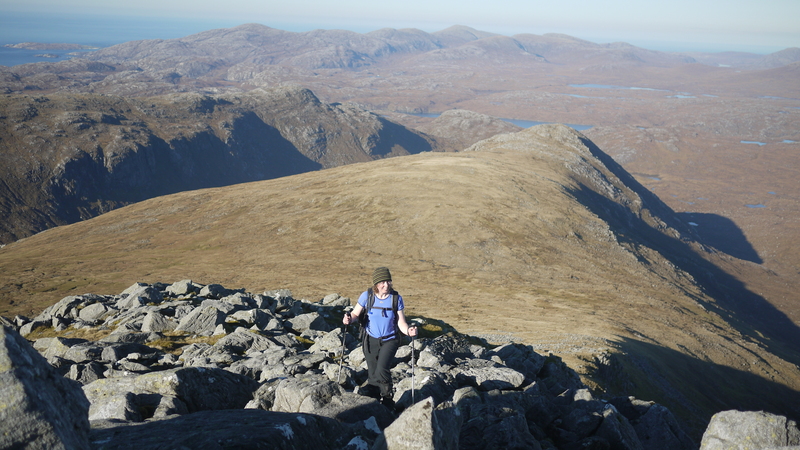 We continued along the rough and pathless ridge forming the western flank of Gleann Uladail; the walking was quite challenging at times with the descent from Mas a’ Chnoic-Chuairtich proving particularly tricky. 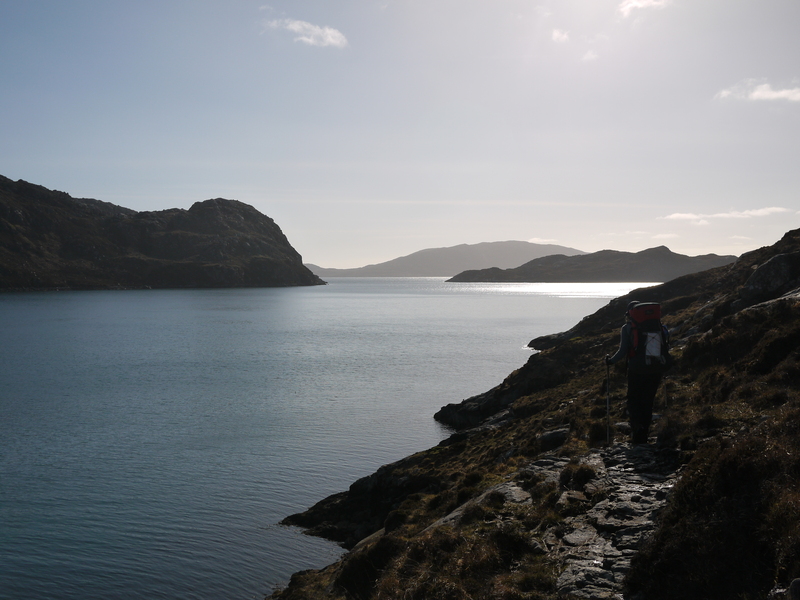 After seven hours walk we reached the southern shore of Loch Reasort – a long, relatively narrow yet impressive sea loch that separates north-west Harris from south-west Lewis. 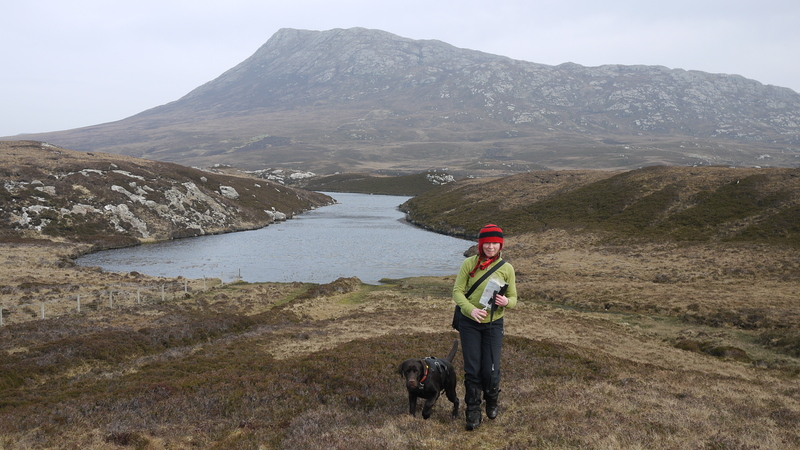 The terrain was too difficult to continue towards the head of the loch along the shore so we picked up the old ‘scholars path’ above Dirascal that led us much of the way to Ceann Loch Reasort over often boggy ground . 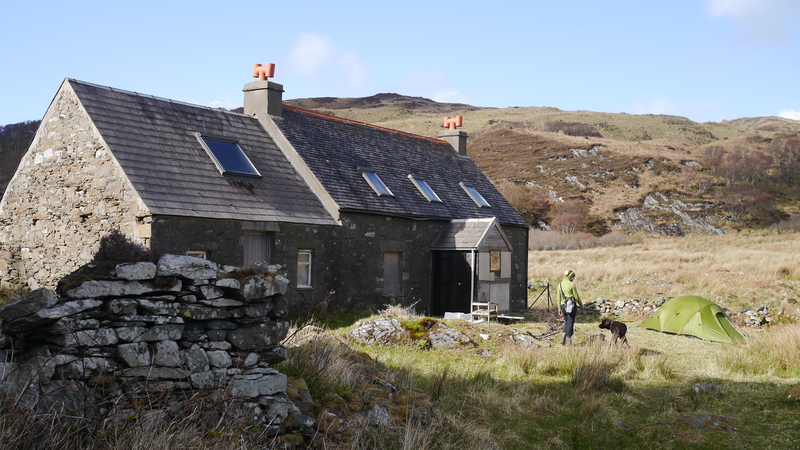 We were knackered by the time we arrived at the head of the loch after nine hours walk, but we found a great pitch by an abandoned shepherd’s cottage. After a windy night, the weather had finally turned by morning. 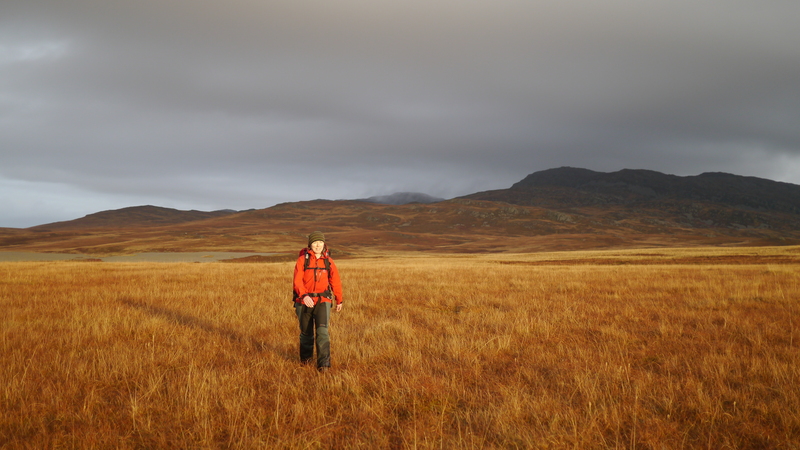 Heading south again, we crossed the boggy peat moor and gained the low ridge forming the eastern flank of Gleann Uladail. The ridge took in a series of minor tops before approaching the impressive summits of Muladal, Ulabhal, Oirebhal and Cleiseabhal, however, the weather was deteriorating and the cloud came down so we took the decision to drop down into Gleann Uladail beneath the mighty buttress of Sron Uladal then walk out to the road along the stalkers’ path. 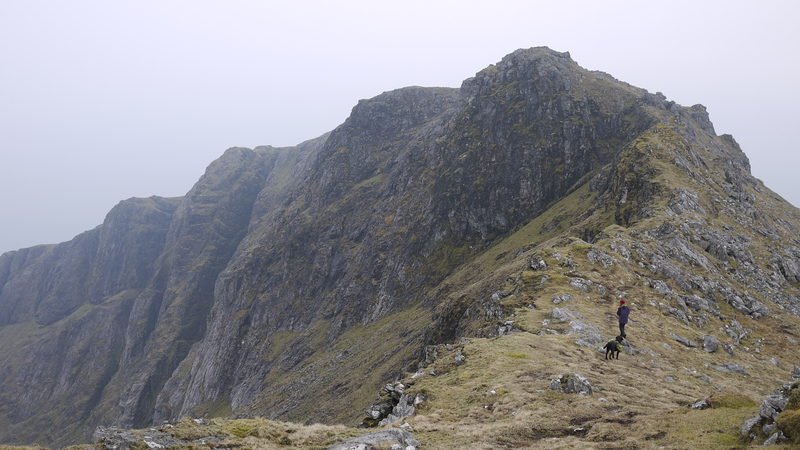 Next up was an aborted attempt at the Clisham Horseshoe; the weather was poor and visibility was pants so we turned tail after gaining the first summit on the ridge, Mullach an Langa. 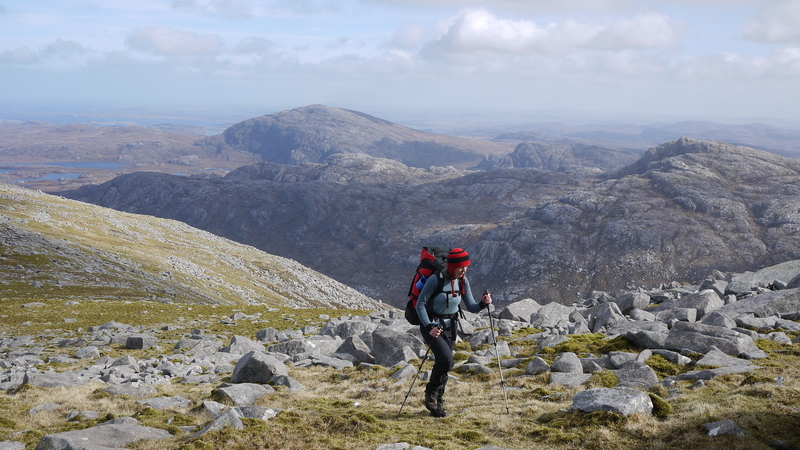 After a night at Reinigadale hostel we set off for the Lewisian section of our Hebridean Odyssey. 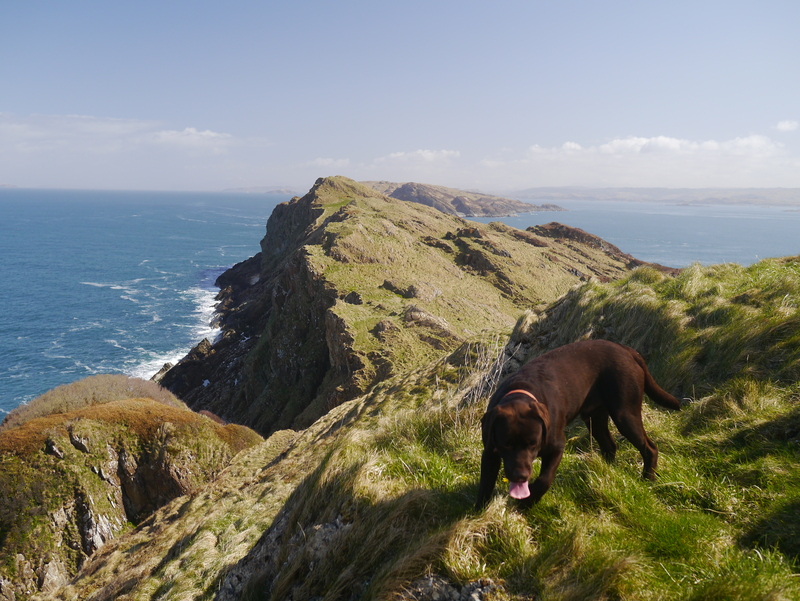 TLF dropped myself and Dougal off at Garenin and we set out north along the splendid West Side Coastal Path while she went off to the seething metropolis of Stornoway for supplies. 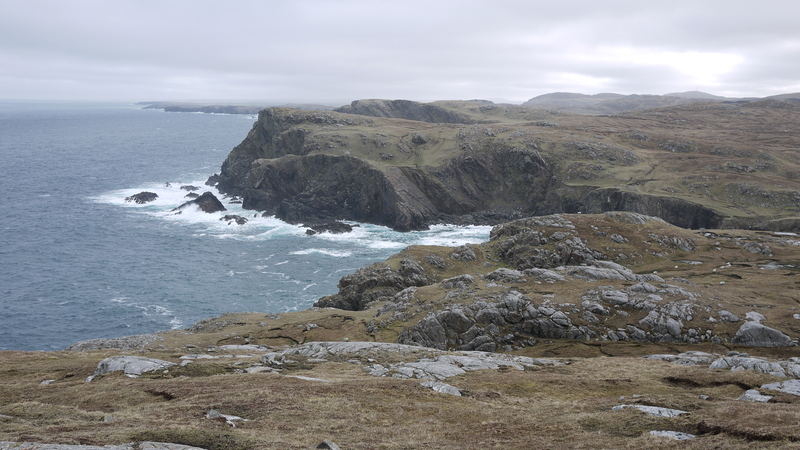 TLF collected us at the end of our walk and we set of for Uig in the south-west of Lewis. 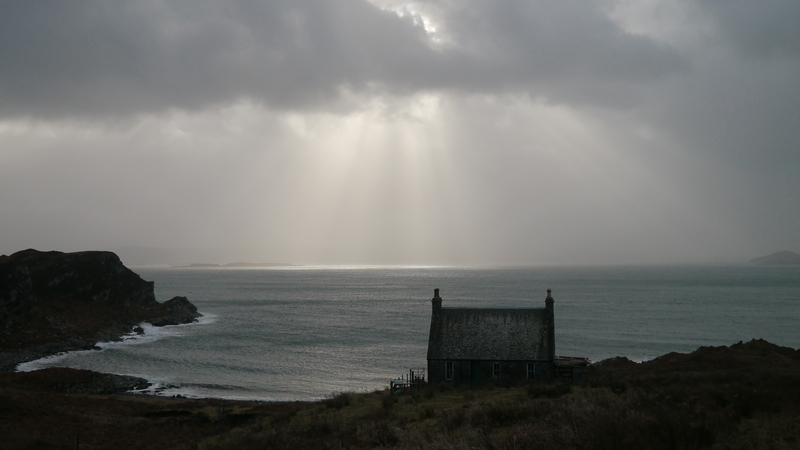 Here we stayed the night in a splendid and dramatically situated bothy, the location of which I’m not at liberty to divulge. 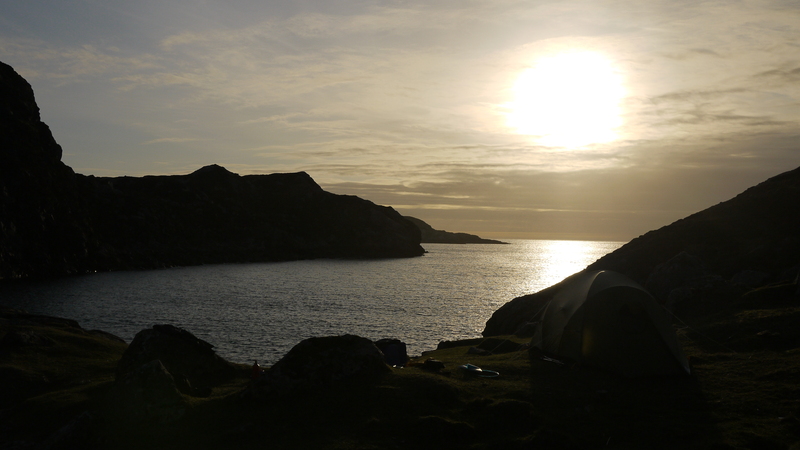 The next morning we packed up and set off on a two-day backpack around the Uig Hills. 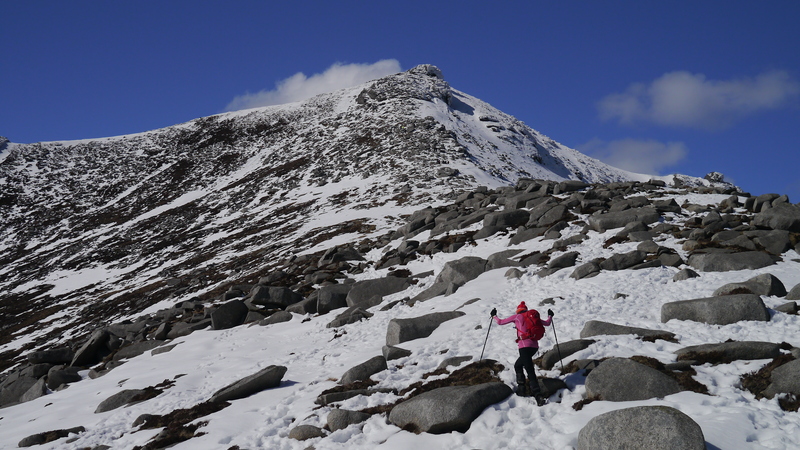 The weather had improved, which was very useful as much of our route was complex and pathless, taking in the 500m-odd summits of Mealaisbhal, Cracabhal and Laibheal a’ Tuath. 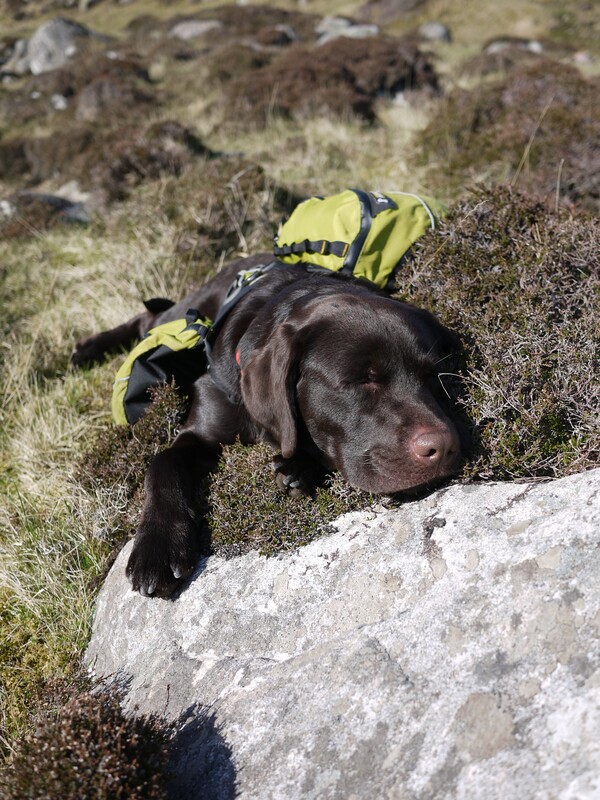 It was a tough old walk, especially carrying full kit, and the effort eventually took its toll on poor Dougie. By the time we’d left the hills and descended to the shore of Loch Tamnabhaigh, he was cream-crackered. 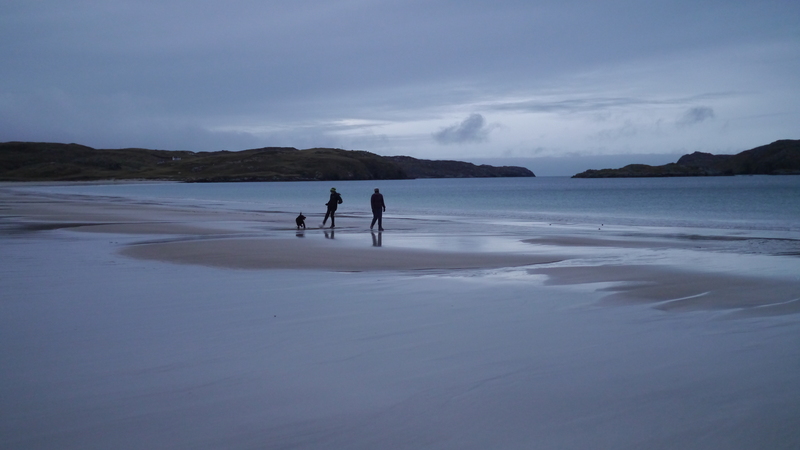 Still as my father-in-law says – to the annoyance of many – ‘to rest is not to conquer’, so we dragged Dougal kicking and screaming around the coast to the head of a small sea loch – Tamana Siar, where we camped for the night. 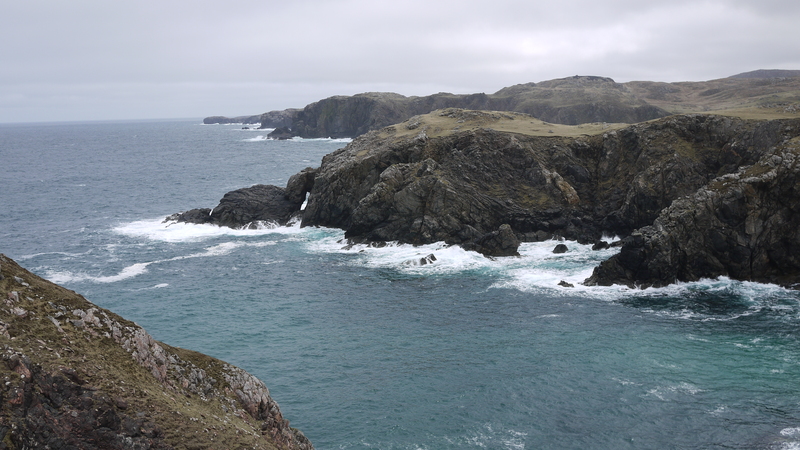 The Penultimate day of the Outer Hebridean leg of our trip was spent walking out along the west coast of the Uig peninsula, back to the motor, before returning to Harris. 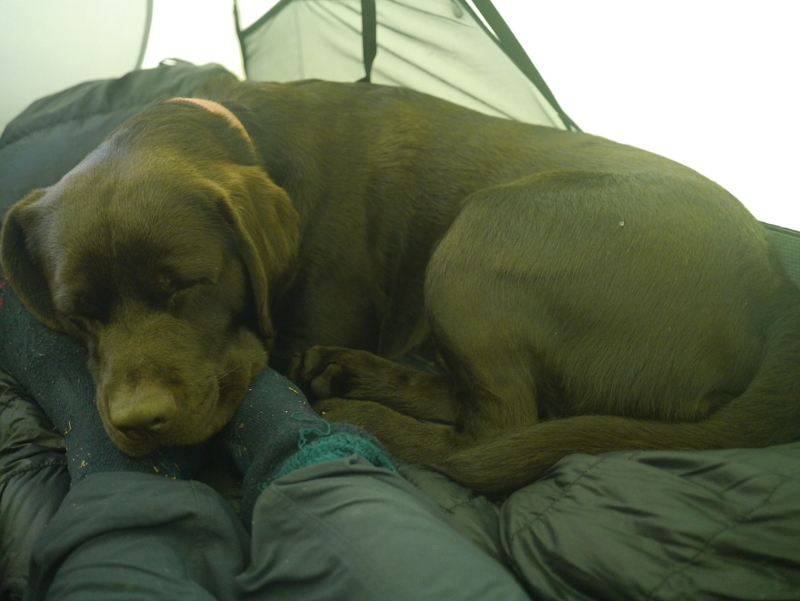 During the night the wind picked up and brought with it a few showers from the west; I lay awake in our tent for a while feeling entirely cosy as the rain pattered busily on the rip-stop nylon, my wife and Labrador snoring companionably away beside me. Seeing as we’d turned in at around 9pm I still felt fully refreshed when I decided it was time for tea at 7am. 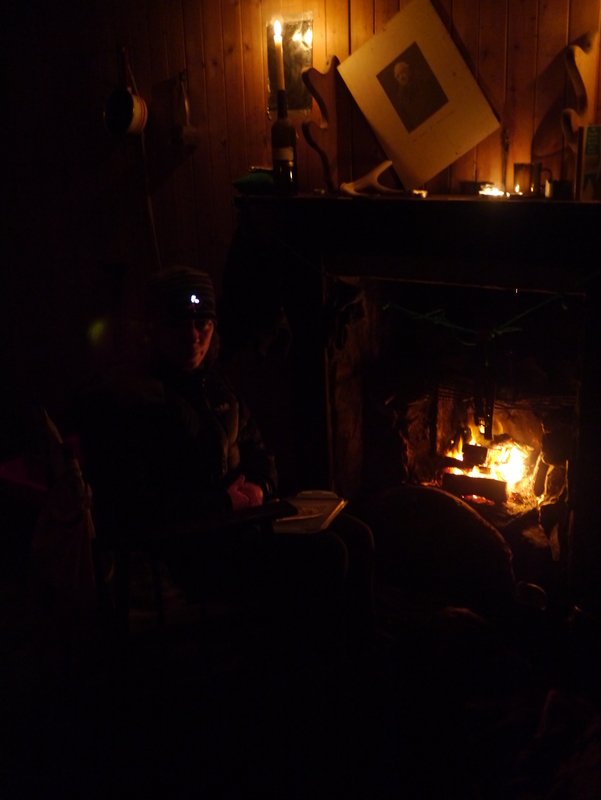 Obviously it was still dark as I lurched the short distance to the bothy; the wee, wood-panelled room still retained some of the warmth of the previous evening’s fire. I lit the candles on the mantlepiece, and got a brew on. 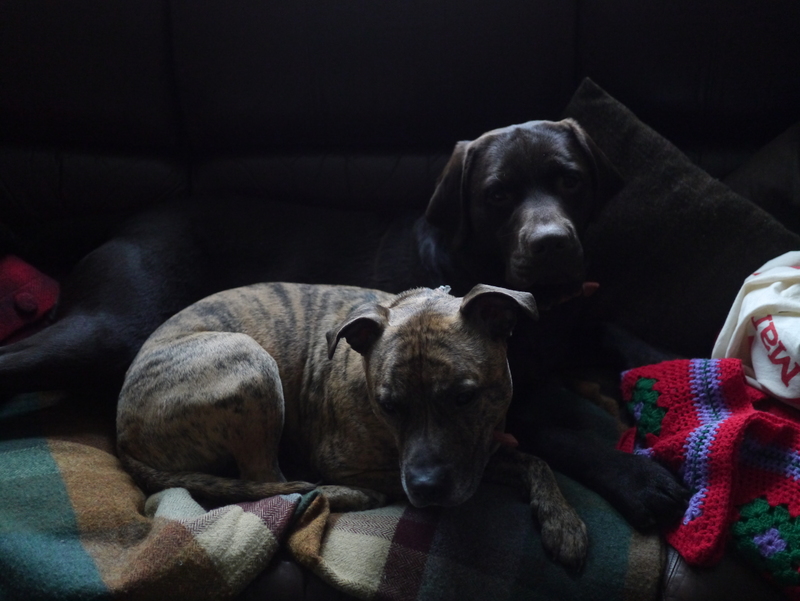 Fiona and Dougal joined me for breakfast and together we watched the ‘changeable’ weather as it passed by the window. Still, weather is always much better when you’re out amongst it so we saddled-up and moved on out on our day’s expedition. Heading north along the glacial cliffs of the west coast we could see bands of rain queuing up behind Colonsay to the west, awaiting their turn to administer a good lashing as punishment for the two days of dry weather we’d enjoyed beforehand; hey-ho, you can’t be being feart of the weather in Scotland. 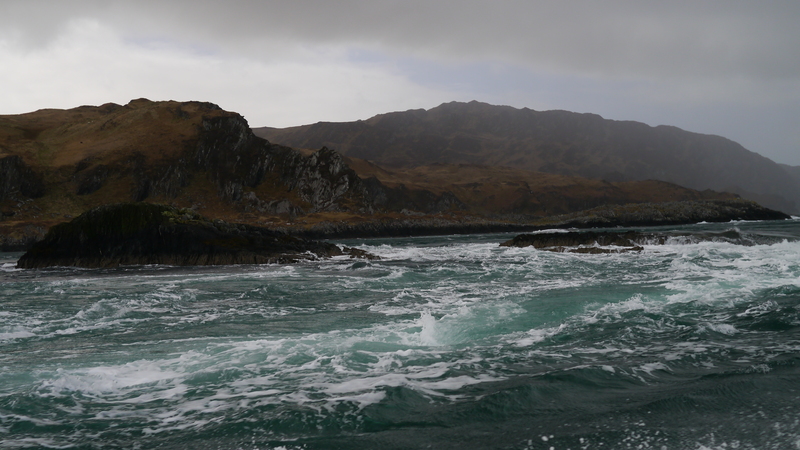 An angry squall set about us as we descended into Breinn Phort and we briefly hid under an overhang in the cliff. 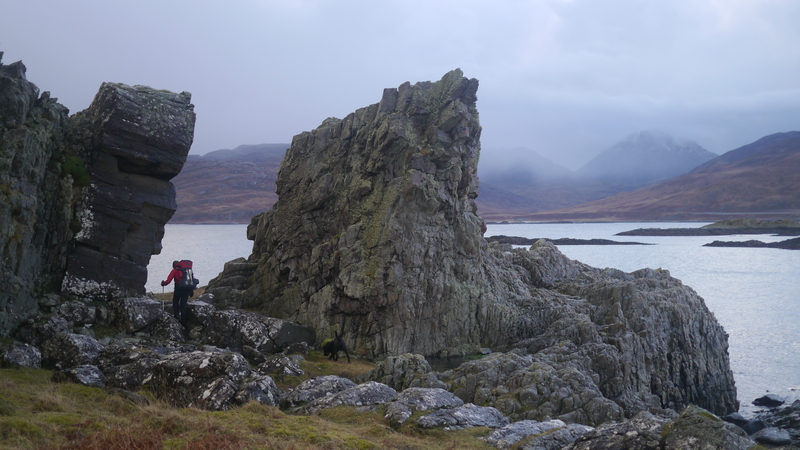 The rain eased and off we set out along the raised shore platform, following deer and goat paths winding between rock stacks and outcrops. We soon passed beneath two cave entrances arranged close together up a slope from the shore platform and I was reminded of a memorable encounter I’d once had here. 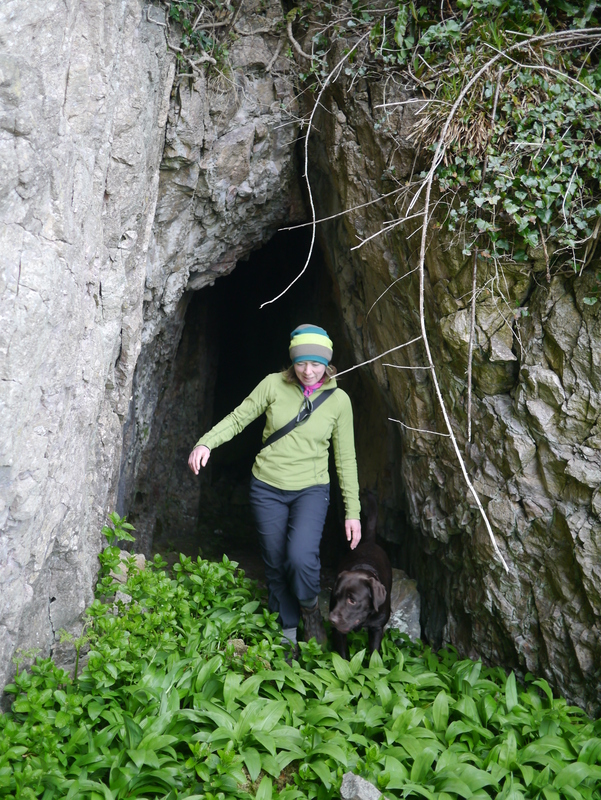 It was late spring a few years ago and I’d been mooching along this stretch of the coast, investigating the many caves; I almost passed by these two as I’d seen plenty already, but I was drawn by the curtain of water droplets raining down across the entrance of the larger, left-hand cave. 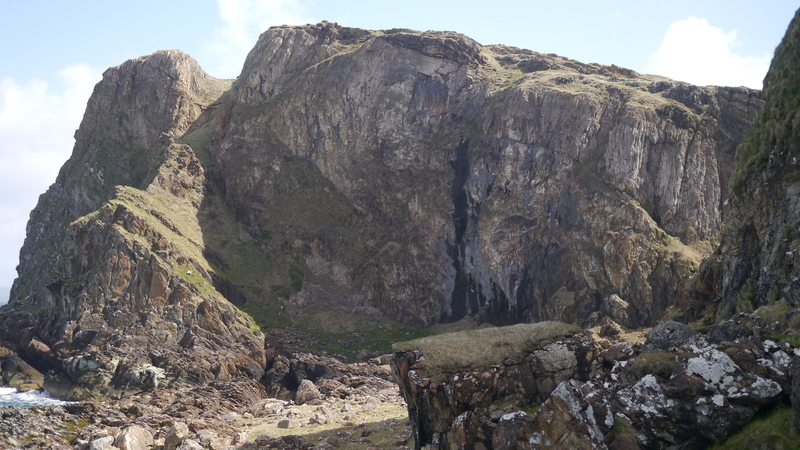 Sunlight lit the sparkling droplets as they splashed off the rocky floor of the cave mouth and when I looked down into the chamber there stood a young stag, sunlit in its brand-new, fox-red summer coat. The stag gazed back at me with a keen look of fear and I knew that he knew he couldn’t get past me. In this brief, still moment the air seemed to tingle with tension before he lurched into the dark recesses at the rear of the cave. I stood transfixed, my attention focused on the muffled sound of his hooves and before I could think what to do, the stag exploded out of the mouth of the right-hand cave next to me. He shot down the slope and skittered clumsily across the large pebbles on the beach below, like a gangly teenager on ice skates for the first time. I was amazed. It took me a moment before I could bring myself to go and confirm the obvious – that the ends of the caves were connected by a stag-sized hole through the rock. Anyway, we’d not seen an awful lot of wildlife thus far this morning, but that was about to change. 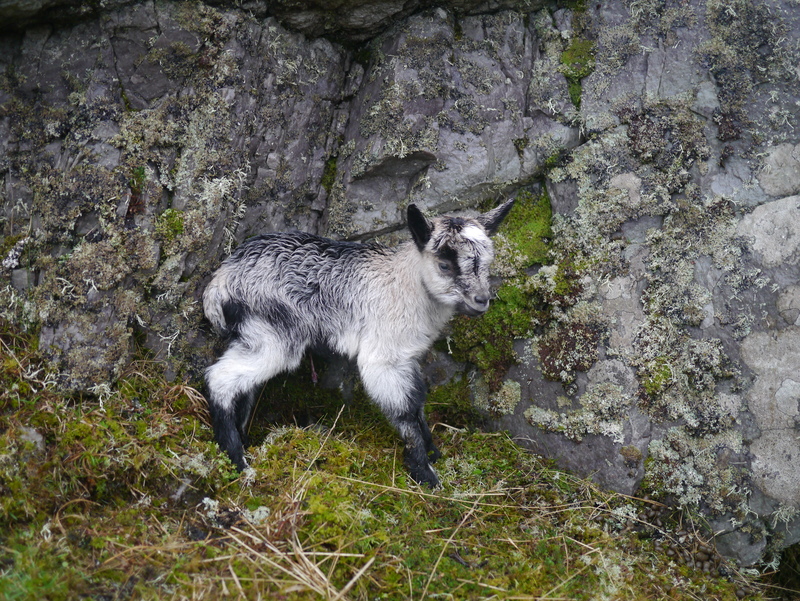 The west coast of Jura is home to around 600-700 wild goats, which are likely descended from domestic animals abandoned when crofters were forced to leave their homes and livestock in the mid-nineteenth century. 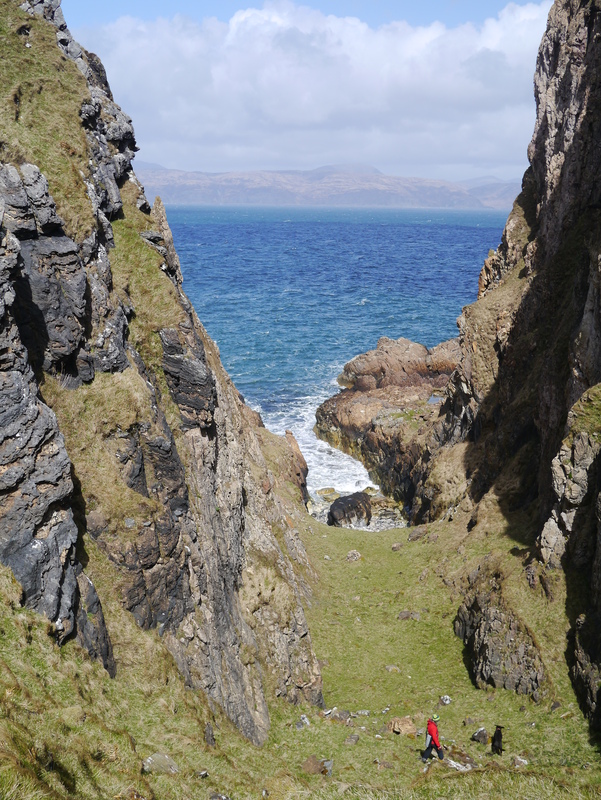 A more fanciful notion has it that the feral goats of the Hebrides are descended from animals that swam ashore from a couple of shipwrecked vessels of the Spanish Armada that were lost in these waters. Whatever their provenance, I was aware that for unknowable reasons of their own, the goats generally have their kids in January – perhaps they’ve read their Darwin? I was a little concerned how Dougal might react if he encountered any wee kids, but I was surprised that we’d seen none. I was just commenting on this to Fiona when Dougal, a short way ahead of us, suddenly barked. He was crouching somewhat nervously as a very wee goatlet indeed bleated at him inquiringly. This little critter was so fresh out of the oven that the umbilical cord was still dangling and the placenta sac lay nearby. The kid seemed to be unafraid, which is more than can be said for Dougal. Anyway, we ushered he dog away and spotted the mother watching from a rocky outcrop above us. We moved on quickly so she could get back to her sprog. We continued wending our merry way along the shore, staggering across beaches of large pebbles and squelching through tracts of perma-bog. The wildlife was now much in evidence with sizeable herds of deer and tribes of goats fleeing at our approach; it was like a damp, Scottish version of one of those natural history documentaries about the Serengeti. Dougal was a bit puffed-up as if he imagined that all these beasties were scared of him rather than alarmed, as they most likely were, by mine and Fiona’s variously orange and red waterproof jackets. Soon enough, Shian Bay came into view; a welcome sight as it was definitely approaching lunch-o’clock and there’s no finer picnic spot than it’s own silver-sanded beach. However, a posse of several large shaggy goats had failed to flee our advance in the standard fashion and Dougal was upon them as soon as they realised their error. 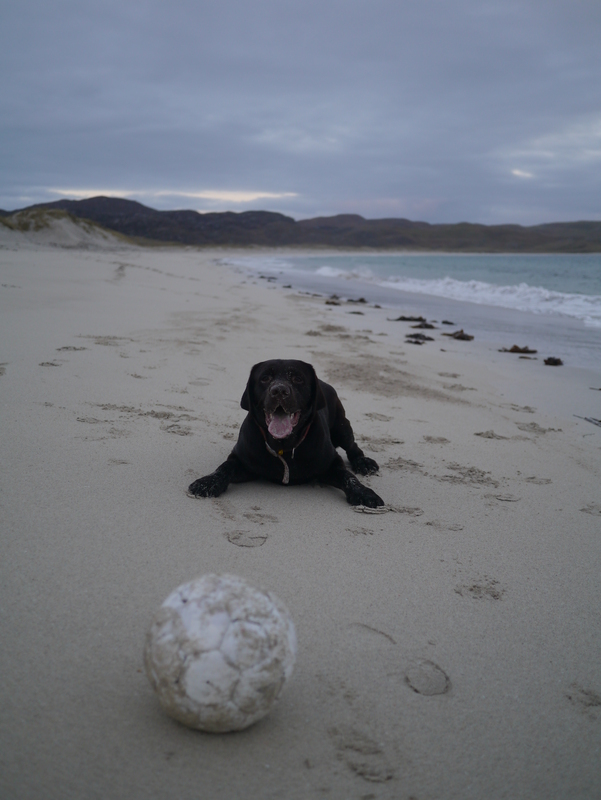 He only wished to show them who was boss, but I called him back for a stern lecture on his responsibilities as an ambassador for all Glaswegian Labradors, when on holiday. He didn’t seem all that impressed. 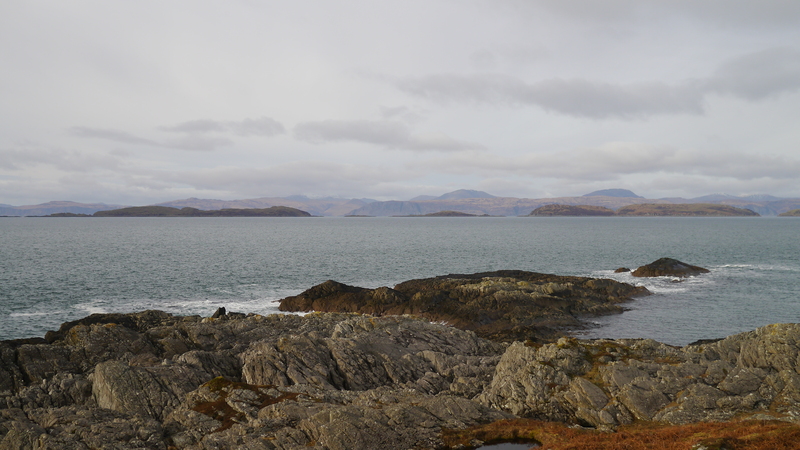 The rain had gone off, so we sat a while on a large log enjoying the vista from Shian Bay west across the Firth of Lorn to Colonsay and south-west to Islay. 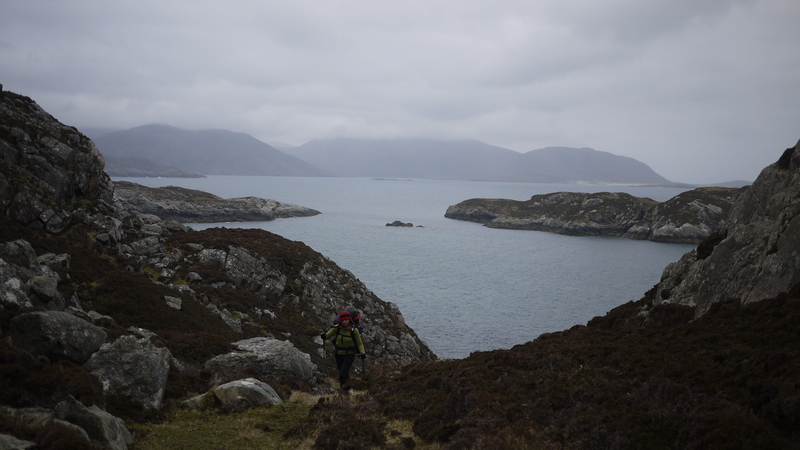 Further bands of rain were beginning to gang up behind Colonsay once again so we set off sharpish, also aware that we had limited daylight to reach our objective and make it ‘home’ in good time. We continued along the shore platform a while before heading back to the low, glacial cliff-tops once again to aid progress. We enjoyed a slightly tricky crossing of the Allt an Tairbh (River of the Bull) then had a quick look at the Eas Allt an Tairbh – no prizes for deducing what ‘eas’ means in Gaelic. A little further along the top, then we descended to the undercliff world once again, clonking across beaches of huge cobbles, sloshing through boggy marshes and poking our noses in caves until a final slope led us up to the rear of the former habitat of Jura’s last full-time cave dweller – the artist, Julie Brook. 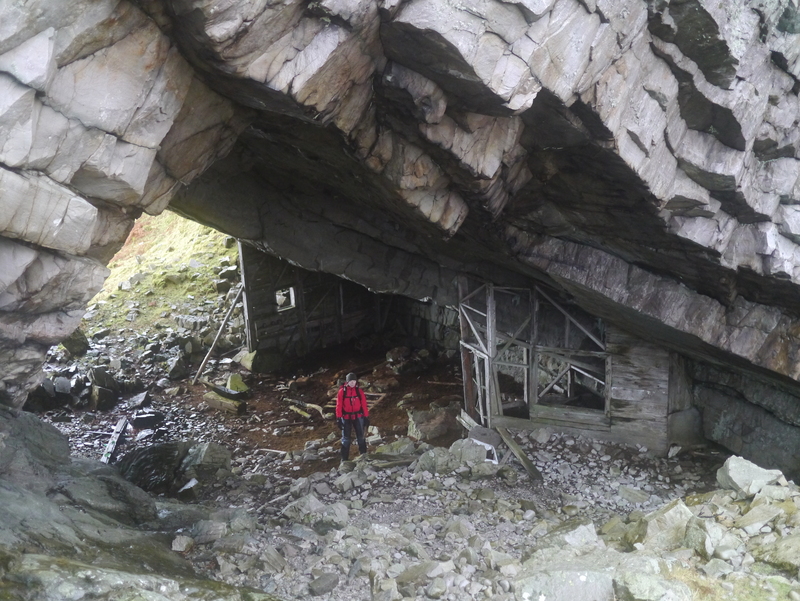 Julie built a shelter in this cave and lived and worked here for several extended periods in the early 1990s, including one sojourn of an entire year. Here’s an interesting article from The Independent. Julie painted a number of large canvases and created various ephemeral ‘environmental’ artworks including my personal favourite, her ‘firestacks‘. At low tide Julie would build a large cairn with a hollow at the top in which she’d place driftwood. When the tide came in she would paddle out to the cairn and light the fire. Good stuff, eh? 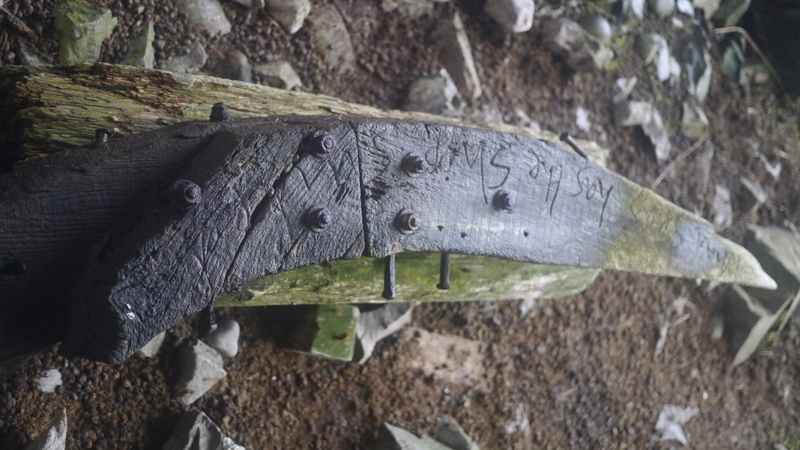 We had a good look around the cave and found several traces of her time here: a barley-twist carved stick, a carrier bag from the Tate Modern and a large wooden brace with rusted iron rivets which she’d carved with the words ‘ What seas has the ship sailed’. It does indeed look like a ship from a childrens’ fairytale book. We had a good look round and took some snaps, but it was soon time to be on our way. 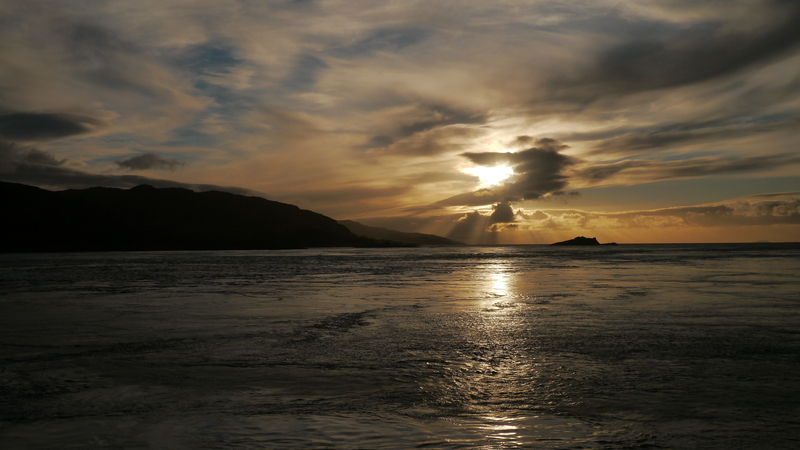 We hot-footed it back along the cliff-tops to save time and once we were beyond Shian Bay, the sun emerged in a glorious display of late-afternoon low winter light. 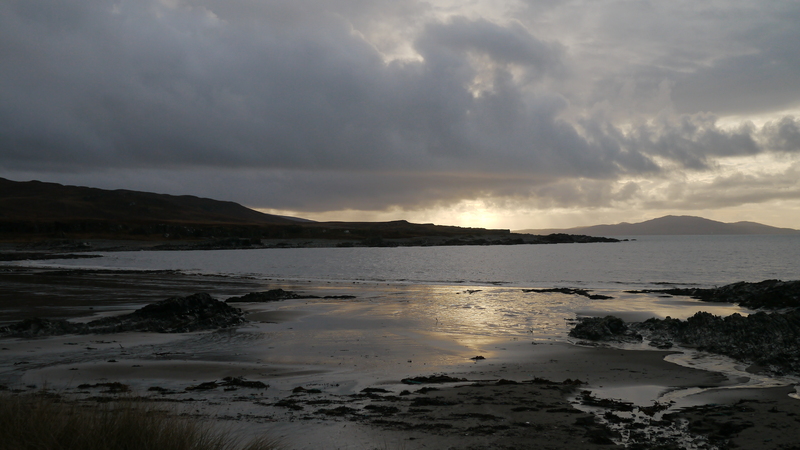 We were back at the bothy before dusk, though the sun had been swallowed-up by cloud once more. 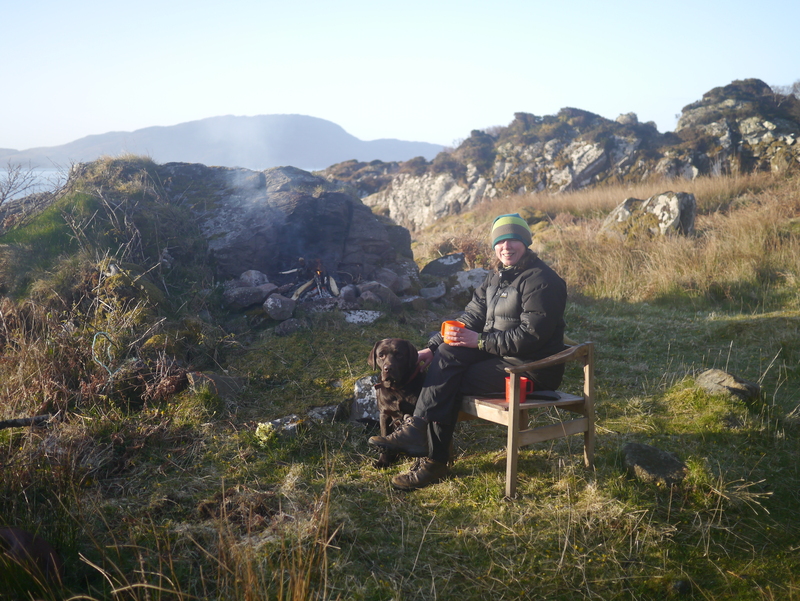 A very pleasant evening was enjoyed around the bothy fire before we hit the tent for another early night. Up before dawn, a leisurely morning was spent gathering firewood in a variety of weather, including energetic hail showers. 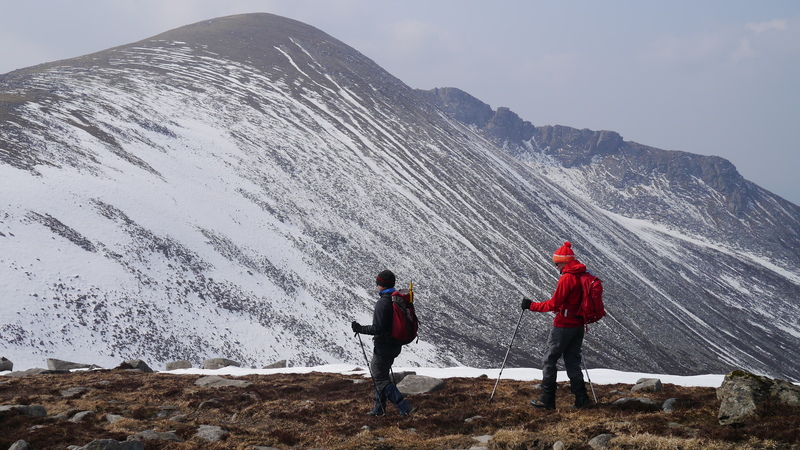 Around midday we set off back to Cruib Lodge bothy, retracing our outward route. The weather settled down – cold, but only a light breeze and no rain. The walk was surprisingly tiring, perhaps it was a hangover from the previous day’s six hour scramble around the west coast’s nooks and crannies. 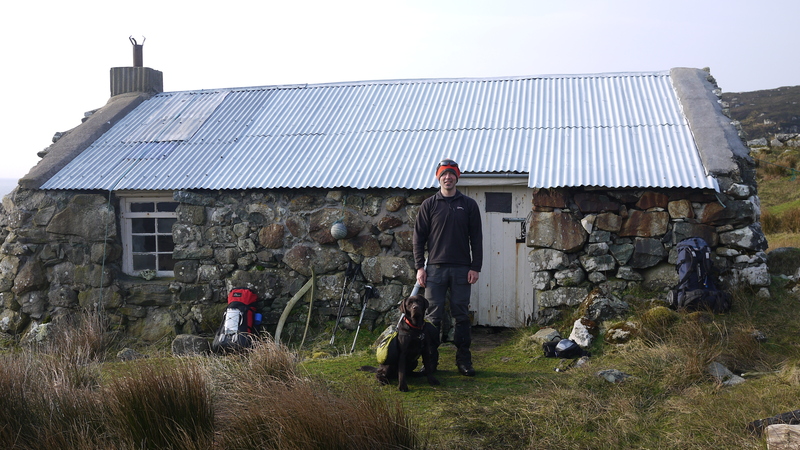 The walk was pleasant and uneventful apart from a few minor dog-goat-deer incidents, but we were glad to arrive back at the bothy after about four hours. Soon after we had arrived, however, we discovered that TLF had lost her gloves, which she’d taken off and clipped to her pack along the way. As we would be leaving before dawn the next day, I was sure that no gloves would be bad news. TLF was sure she’d taken them off after the river crossing at Garbh Uisge, around 25 minutes walk back the way we’d come. I dropped my pack and set off back the way again; Dougal followed then stopped, looked at me as if to say ‘you are joking?’, but then gamely kept me company as I retraced our route. The light was fading and a pair of black gloves could easily be missed. 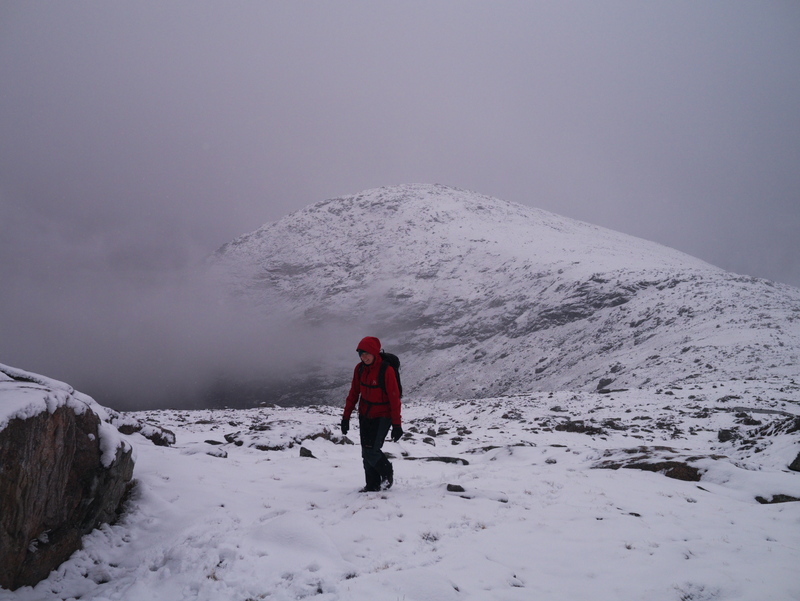 We walked all the way back to Garbh Uisge to no avail. 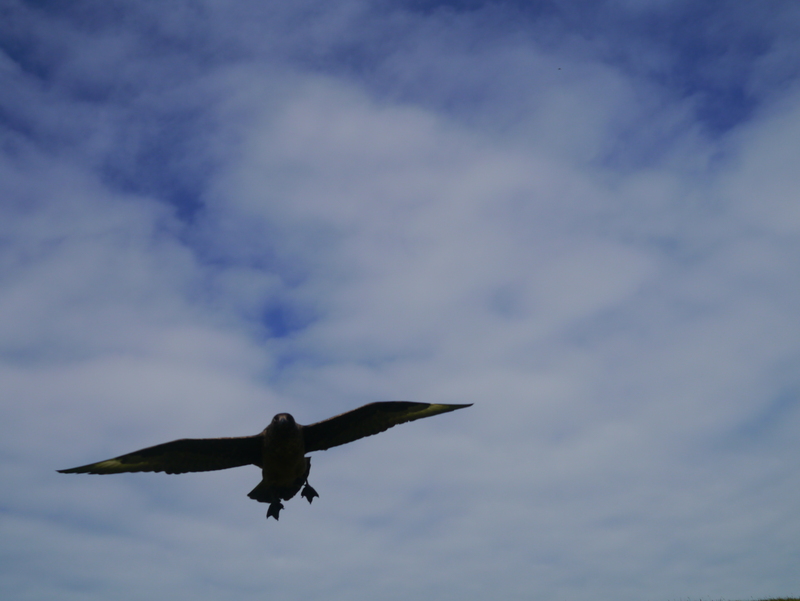 However, when heading back to the bothy again, there they were, yippee! Cups of tea all round back at the bothy! The next morning was indeed fresh; we set off at ten to eight so we could get back to the car and make the 10.40 ferry back to Islay. 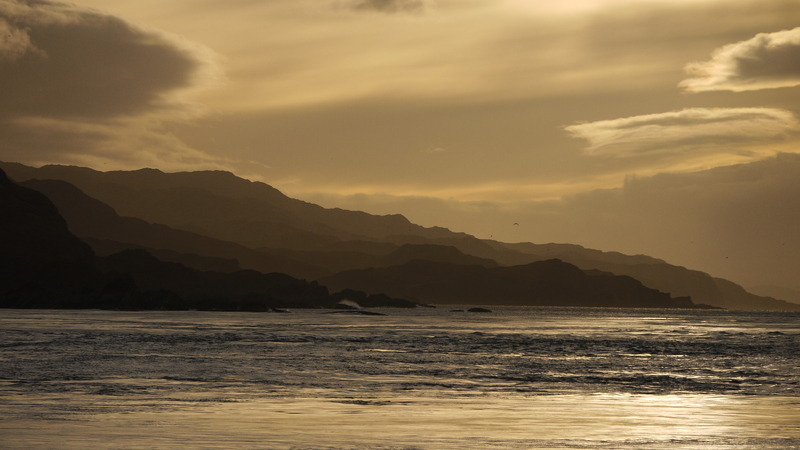 The tide was right up so our route back around Learadail and then the head of Loch Tarbert was made more difficult – the dawn light made up for it though. Good thing we did leave at ten to eight, though, as we made the ferry with two minutes to spare!